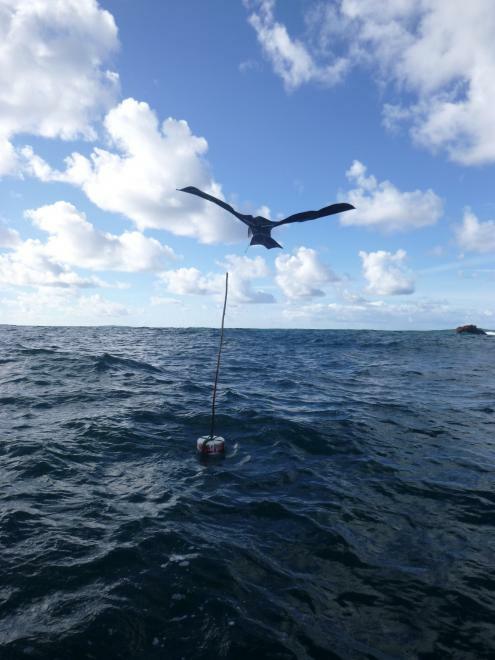 One more winter campaign to monitor seabirds ate sea have just begun. Over the next 40 days, SPEA officers will count seabirds along the entire Portuguese mainland coast. 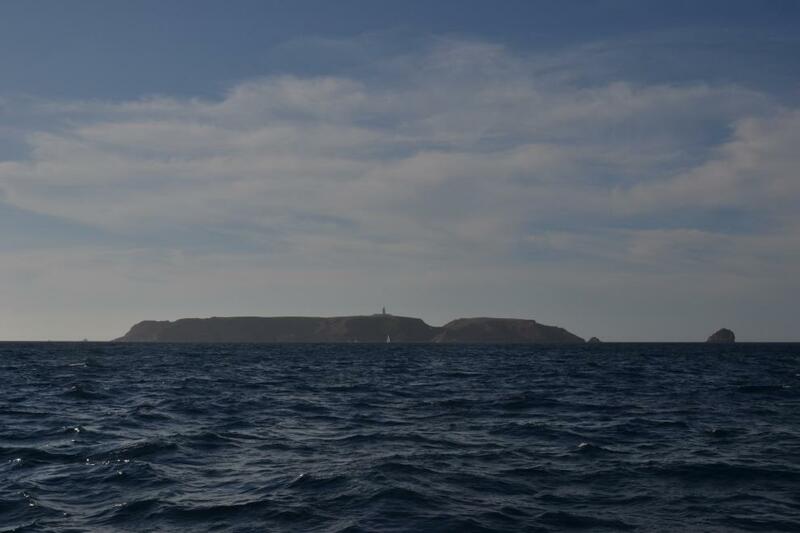 Counts are taking place under the scope of after-Life Berlengas and the new SPEA's project - MedAves Pesca. Scientific banding is an essential tool for the scientific study of birds. It is a research method based on the individual marking of birds, usually with a metal and / or color ring with the one character combination is recorded. A ring is like a bird's identity card. Any record of a ringed bird can provide a lot of useful information about your life and, in particular, about your movements. The analysis of the displaced birds allows us to define their migratory routes, to know the areas of rest, feeding or stopping, and also provides us information about their longevity. This provides crucial information to guide conservation measures and to guide the planning of integrated systems of protected areas for protection. In order to obtain this information it is very important that the observed rings be reported. To do so, simply go to the Euring website (https://euring.org/) and enter the color, letter code and / or number of the ring, species, place and date on which it was sighted and, if possible, take a photo to confirm their identification. We can contribute to increasing awareness of these wonderful living beings! On the first Saturdays of each month the days RAM (Portuguese acronym for Seabird and Marine Mammal Monitoring Network) are carried out, which consists of the counting and identification of species and behavior of birds and marine mammals in some places of the coast of the Iberian Peninsula. In Portugal, places of observation are: Praia da Vagueira, Cabo Carvoeiro, Cabo Raso, Cabo Espichel, Sines, Cabo de São Vicente and Faro. This type of initiative is important in order to monitor and identify migratory behaviors and population trends and follows a standard methodology (same time in all places). In the month of March, the RAM day was full of different sightings from dozens of Balearic shearwaters eating, Northern gannet to migrate to their breeding places, local moving of shags, yellow-legged seagulls and dark-winged following fishing boats and even the timid dolphin’s (Phocoena phocoena )right by the shore. Workshop "The mission of NGOs in the prevention and detection of Crime against the Environment"
During the X Congress of Ornithology of the SPEA held in early March in Peniche, a Workshop on Criminology was held, led by Dr. Rita Faria, a professor at the School of Criminology of the Faculty of Law of the University of Porto and her two interns Inês Lima and Gabriel Leal who we are very grateful for the availability and professionalism. The main focus of this workshop was to explore the mission that NGOs can do in the prevention and detection of crime against the environment through collaboration with the area of ​​environmental criminology. The first part of the workshop included a presentation on the overall Portuguese legal framework for crimes against the environment including legal mechanisms for combating and integrating with European and international guidelines or directives. The main challenges for this type of crime were listed, such as the fact that many of them are culturally accepted and the victims have no voice (nature, animals, etc.) and the existing data are limited and often unrealistic. -The importance of Media as information is shared on a large scale in a short time. It was a very participatory and informative activity, the result of the current collaboration between SPEA and the University of Porto within the framework of the Life Berlengas Project and the work on the subject of incidental catch of seabirds due to illegal fishing practices in the Berlengas Islands SPA. 19 days on the research vessel "Norway"
Once again, SPEA participated in an IPMA data collection campaign on the research vessel "Norway". 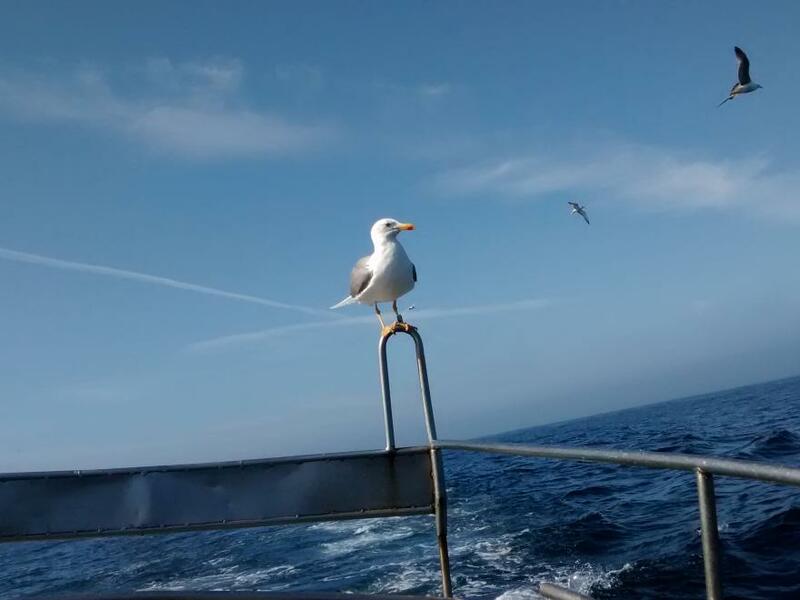 Our role in this voyage is to perform systematic seabird counts with ESAS (European Seabirds At the Sea) methodology along the entire Portuguese coast and still in southern Spain. This type of work gives us a lot of information on the distribution, population trends and migratory behaviour of seabird species. During the 19 days, I traveled from Cadiz to Lisbon carrying out a series of routes perpendicular to the coast. There were many species that I observed: Northern Gannets, Mediterranean Gull, Lesser Black-backed Gull, Yellow-legged Gull, Black-legged Kittiwake, Audouin’s Gull, Black-headed Gull, Sandwich Tern, Great Skua, Razorbill, Common Murre, Balearic Shearwater, Manx Shearwater and Sooty Shearwater. In addition to the counts in the linear paths, whenever the vessel was fishing (in this case dragging), I recorded the interaction of the seabirds with the fishing gear and collected detailed information about the art and its catches of fish. I also noted species of cetaceans (Common dolphin and Common bottlenose dolphin) that appeared with some regularity. At the end of each drag I was amazed at the amount of abandoned gear that was recovered (plastic and mud logs, traps and gill nets) and still a lot of plastic. It's just a little taste of what's down there. In addition to the regular incredible sightings, the camaraderie and conviviality that is created with the crew on the ship (be it with the IPMA technicians, sailors or masters) is very rewarding and enriches a long stay on board. It all started in July. A Skype video call and, suddenly, I was packing my bags to go to Lisbon for 5 months. It was one of the best decisions I have ever made. 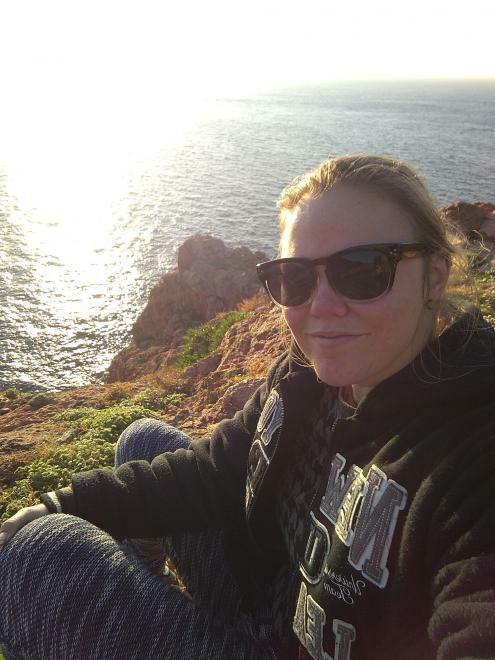 During these months I was able to meet amazing people from all of SPEA’s departments, but what has truly changed my professional life has been, undoubtedly, the weeks I spent in the Berlengas Islands. Those incredible weeks, surrounded by good people, to whom it did not matter if it rained or if the sun was shining, will forever be in my memory. I am thankful to all of the staff for the opportunity that they gave me when they took me in, for without them I would not have been able to participate in the conservation actions that take place in the island, such as removing ice-plant, retrieving rat control boxes, monitoring nests and ringing Band-rumped Storm-petrel and Cory’s shearwaters, among others. I will always remember the boat trip there, some of them a bit seasick, others feeling sleepy, walking all the way up the island to the house, the meals shared in great company, talking about everything, the afternoons peeling seeds, the almost “hurricane” that ended up being just a strong storm (and I glad it did! ), the moon eclipses, the photos, the laughter’s… and coming back in the same boat, but a bit sadder. It was amazing! Thank you very much SPEA, for all this time. I am going to miss it very much! My participation in LIFE Berlengas project began in 2015 with a curricular internship on the black rat population of Berlenga Island. The experience went so well that I had to come back later to do my master's thesis, this time on the interactions of the European Shag with commercial fisheries. After three years it is difficult to talk about everything I had the opportunity to do and learn. This project made me grow up and shaped the biologist I am today. I was lucky enough to meet great people who taught me so much and who always made me feel at home, and they are the best that I take from this experience. Thank you to all who have shared with me the love we have for this cause. I also had the great pleasure of being part of something that in fact tries to make a difference and that contributes to the conservation of this wonderful archipelago. It has not always been easy, but the less good moments make the achievements even more special. It makes me very happy to be able to look back and see all that Berlenga has become, full of life, thanks to the great work, effort and dedication of all. For all those who want to help in the conservation of this archipelago, do not hesitate, get involved and be part of this beautiful story. You will be received with open arms, and will feel that you are indeed making a difference. But be careful, you're going to fall in love! We can leave the island, but the island does not leave us. In addition to putting long-hauling devices on longline gear, we will test the same on a boat that operates gill nets. In this type of gear, especially on large boats, the timing of the day's start of the nets creates a great uproar in seabirds. When the nets are not cleaned well, they carry a lot of fish and when they are thrown into the sea the birds enjoy feeding. And it is here that many of them get stuck and end up drowning. To try to stop this situation we will put a rescue device aboard the boat that will accompany the whole day of work. 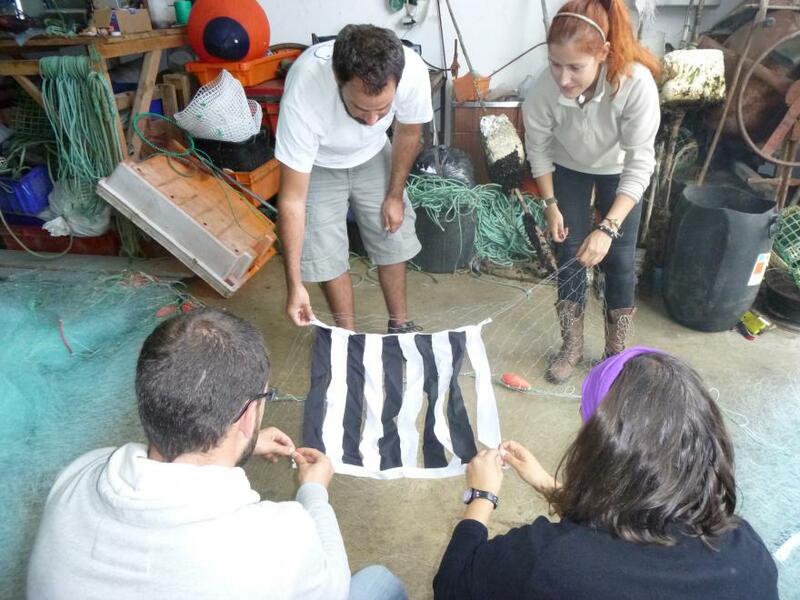 MedAves Pesca is the new SPEA project, funded by Mar2020, whose main objective is to reduce incidental catches of seabirds in fishing gear (http://www.spea.pt/en/estudo-e-conservacao/ projects / fishing-medaves). It is a project that fits into the post-life Berlengas actions and will be partnered with ADEPE (Association for the Development of Peniche). For the first time, we placed 2 rescue devices in the waters of the Berlengas SPA zone (one for each vessel operating longlines). 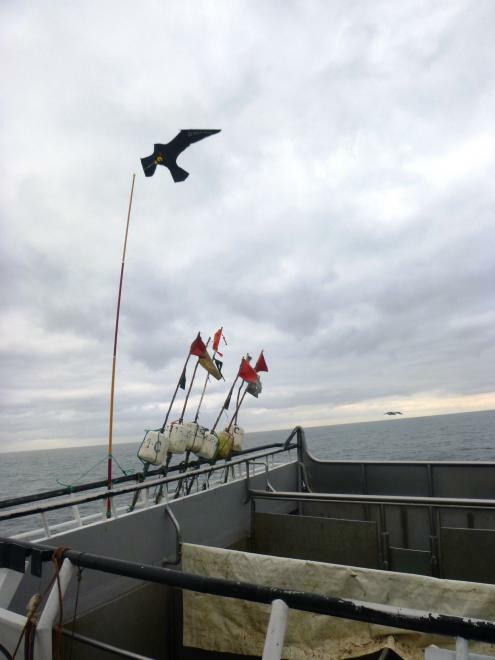 Initially a few adjustments were made so that this device in the shape of a bird of prey would stay straight, did not curl or land in the water. After a few attempts we have found the "formula" and it is operational. Both the yellow-legged seagulls and the Northern Gannets were curious in the presence of the device but kept away from the fishing area. No seabird catches have yet been recorded in any of the control (far from the device) or experimental areas (with the device). We hope that the next shipments can give us information about the effectiveness of this measure. Once again, the fishermen of Peniche have shown themselves to be receptive to the experiences we offer them and their collaboration is fundamental. Public presentation of the Pedagogical Notebook "From the islands to the classroom"
'On December 5th, Auditorium Américo Gonçalves held a public presentation of the "Pedagogical Notebook: From the Islands to the Classroom". 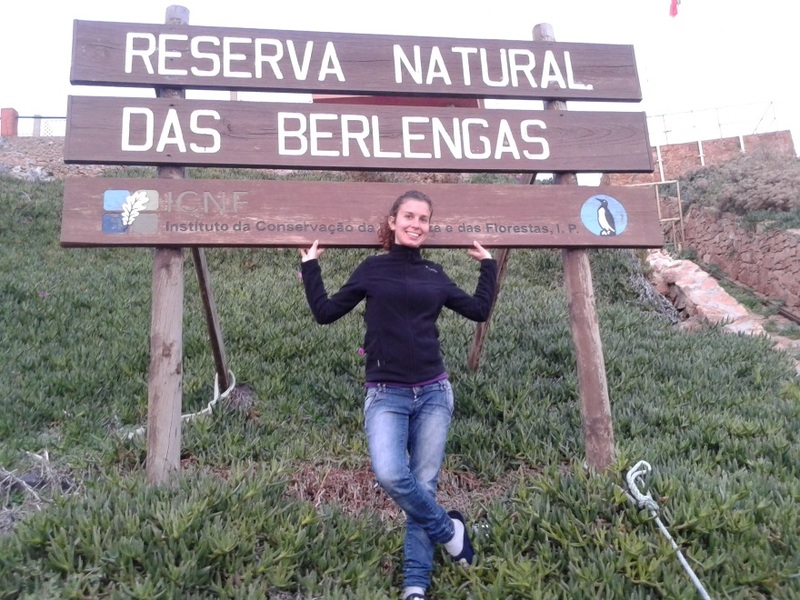 The action was promoted by the Portuguese Society for the Study of Birds (SPEA), under the project "Life Berlengas | Sustainable Management for the conservation of Berlengas, "and was intended primarily for educators who somehow work on the themes underlying the project. The session was conducted by Dr. Teresa Oliveira, being assisted by the person in charge of the same, Dr. Mónica Costa. Explaining the framework of the project, the speakers showed the various values of the pedagogical book. The participants also had the opportunity to socialize, based on the experimentation of a didactic game designed for the youngsters. On the SPEA page, you can access the didactic resources presented at http: //berlengas.eu/en/da-ilhas-ate-aula-de-aula-un-caderno-pedagogico- ..., but the authors mentioned that they are to try to publish the work on paper. Those responsible for the action also distributed some materials, highlighting two issues of the "Pardela" magazine and leaflets resulting from work carried out in the 2017/2018 school year, with two classes from the 12th grade of our school, involving summaries of the work developed in the framework of the project "Life Berlengas". The SPEA team was present at a Workshop on Accidental Bycatches of Balearic Shearwater in Palma de Mallorca on 12th of November. The Balearic shearwater is the most endangered species of European seabirds. It nests only in the Balearic Islands and about 90% of its population passes through our waters during its non-breeding period. One of the main threats to its conservation are accidental catches in seine fishing and longline fishing. Birds know no borders and so it is so important for different countries to work together to find ways to mitigate this problem. Over the last 4 years, 102 artificial nests have been constructed for Cory's Shearwater on Berlenga Island. This year 37 have already been occupied! Annually these nests are monitored and chicks are ringed. This short video is a small example of our work. If you want to know more details see our report here. 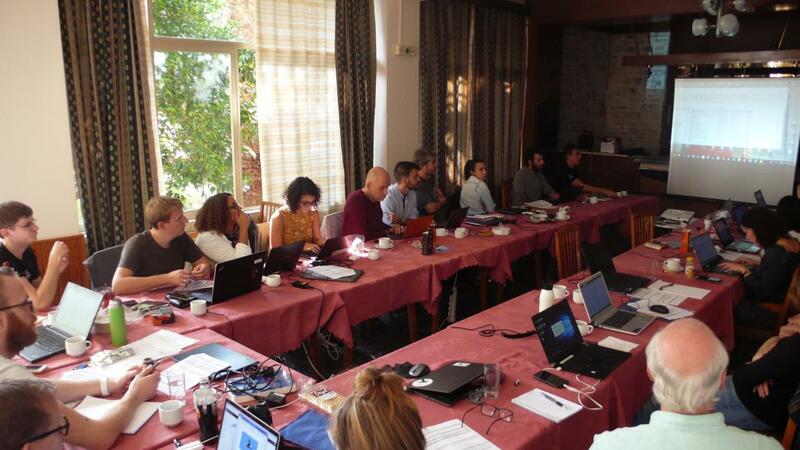 In the week of the 22nd-26th of October 2018, the Life Berlengas team was present at the annual meeting of the Marine Task Force of BirdLife International in Athens, Greece. This is a meeting where European partners can share knowledge and results of ongoing projects and discuss difficulties, common approaches and future challenges. SPEA presented the results of Life Berlengas actions on accidental seabird catches in fisheries. The number of participating countries is increasing, reflecting the growing collaboration in the conservation of birds and their habitats, which are borderless. 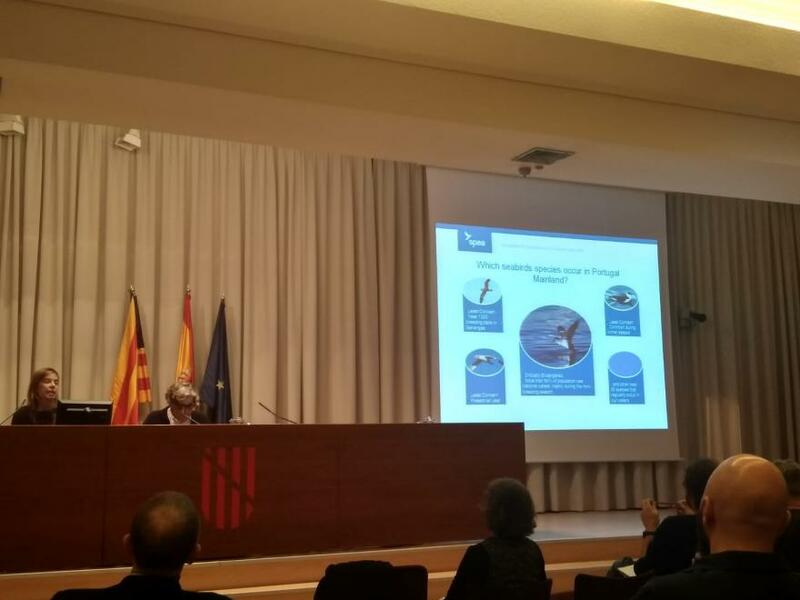 The group also took the opportunity to discuss the Strategy for the Marine Program of BirdLife that will guide the work and priorities for the period 2018-2022. Once again, we were in Cabo Carvoeiro talking about the Life Berlengas project and its respective actions in the activity called DONAS (De Olhos Nas Aves) in collaboration with Ciência Viva. It was a very positive morning thanks to the enthusiasm of the participants In this activity participate from children to adults of various nationalities. We had the opportunity to show species like shags, yellow-legged gulls, gannets and cory's shearwaters, and explain their characteristics and ecology. 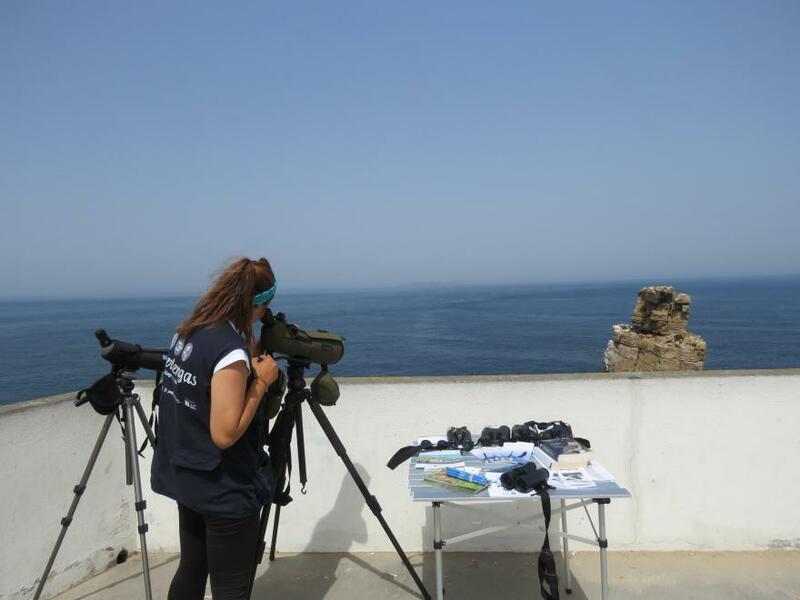 We talk about the most common seabirds in the Berlengas ZPE (Special Protection Zone), the project objectives and we teach how to handle the binoculars and telescope. We also talk a little about SPEA as an organization that promotes the conservation of species and habitats. Many were interested in receiving news of our projects. This type of activity allows to local participants and tourists to have an especial morning enjoying the nature. From now, many of those who have heard us will not forget the sound of the cagarras or the distinction between galleta and cormorant, for example. The 15th of September we will return to the activity and we will be looking forward to more curiosity and enthusiasm of the public. 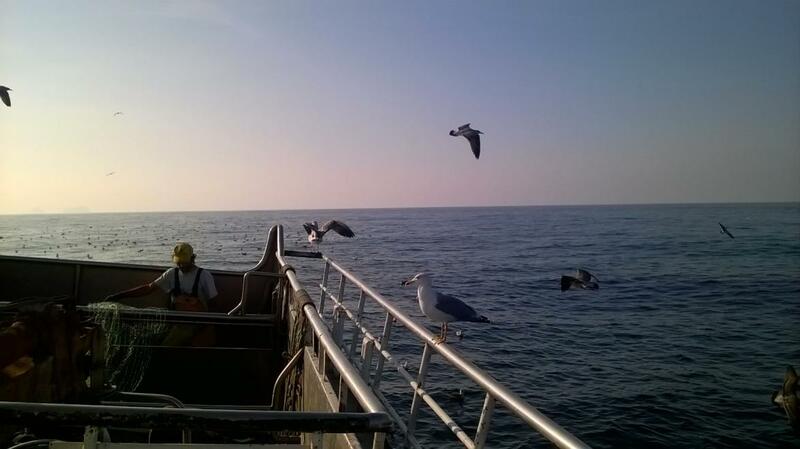 The main purpose of our presence on fishing boats is to evaluate the interactions between seabirds and fisheries. We are monitoring bycatch and try to implement new mitigation measures. During Life Berlengas we intend to reduce seabird bycatch into the ZPE Ilhas das Berlengas. Currently, we are using a new mitigation measure in purse seiners. The objective is to scare seabirds and keep them saved away from the operation area. This new idea consists in a kyte very similar to a bird of prey. The scarybird stays in the top of the vessel during all fishing trip. 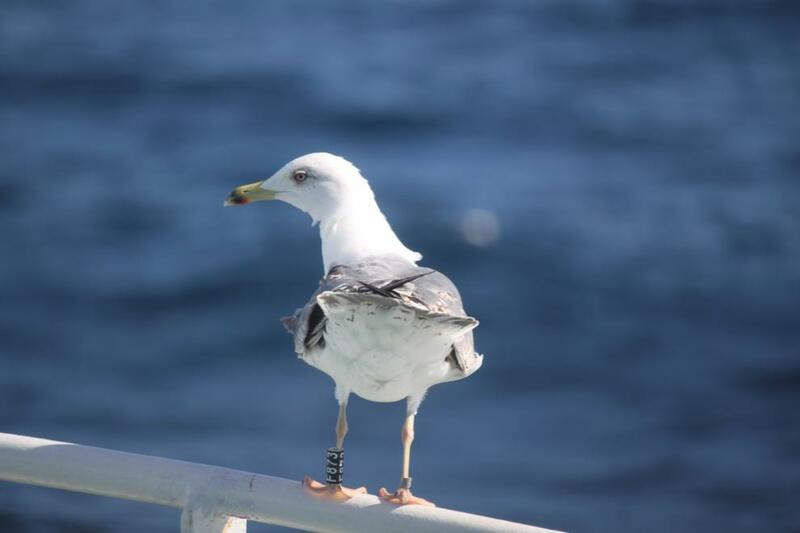 During several trips aboard our testing boat (some with scarybird and the others without it), we can see a diference in the gull behaviour (being the most abundant species attracted by purse seiners). With scarybird, seabirds keep a longest distance from the boat. Such behaviour may happen because, as expected gulls see the scarybird as a real predator. The crew of “Guerreiro do mar” agree with us too and really like our first results. This type of measure is very simple and can make the difference to reduce the interations between seabirds and fisheries. This way we can protect and give harmony for both. I've also spent some time in SPEA's headquarters inserting the aforementioned observation data into a database. Moreover, while I was there, I did an identification guide for the use of other fisheries observators. This guide involves fishes, cetaceans, birds, waste, among others. Each technical file of a species cointains the scientific name, common name in portuguese and in english, amoung other designations of the common name, the group to which the species belongs to and the code of FAO/EURING. For each species there is a real image as well as draft, emphasizing the main characteristics. There is also a small description of the species, minimum capture size and capture method. It is with great enthusiasm that we have seen that there is already a chick in the nest and that it is already alone for long periods. It must have hatched in mid-July and is being fed and nurtured by zealous parents. They leave the nest to go search for food in the waters adjacent to the Berlengas, and when they return, the chick needs all the attention and care! See here one of these moments and follow the growth of our 'cagarrita' and the daily life in the nest. And if you see something unheard of or surprising, share with us in 'Live Nest'. Once again SPEA team organized a course on fisheries and seabirds bycatch observation. This time our audience was mainly the students from the Escola Superior de Turismo e Tecnologia do Mar, Peniche (ESTM). The training included a theoretical component realized in the ESTM and a practice component divided in a trip at sea around Berlengas archipelago and a guided visit to the Peniche dock. In a fast boat, we did direct observations of several fishing gears. We could see gillnets, fishing traps and demersal longlines. So difference between each gear were explained. We made observation and identification of seabirds, recorded their interaction with fishing gears and boats, and talked about the bycatch problem. During a pause on Berlenga island, students learnt on recording seabird interactions and bycatch. We also showed an on-testing mitigation measure that we use on purse seiners to avoid interactions and bycatch of seabirds. In Peniche dock, we talk about the fish market dynamics and those species with bigger commercial value. By the end, the students saw the selling operation. These were day’s very positives and we saw the students with enthusiasm. They asked a lot of questions on environmental awareness with fishermen, illegalities of fisheries in Berlengas and mitigation measures. The observation of fisheries is an essential work for the collection of trust data. Aboard we better evaluate which measures are feasible to implement. Do you want to be a SPEA volunteer? Do you have between 18 and 30 years old? And live in Portugal? So these news are for you! SPEA is participating in a LIFE project “Volunteer Escapes”, with 10 other national partners, that aims to promote the volunteering in Natura 2000 Network. 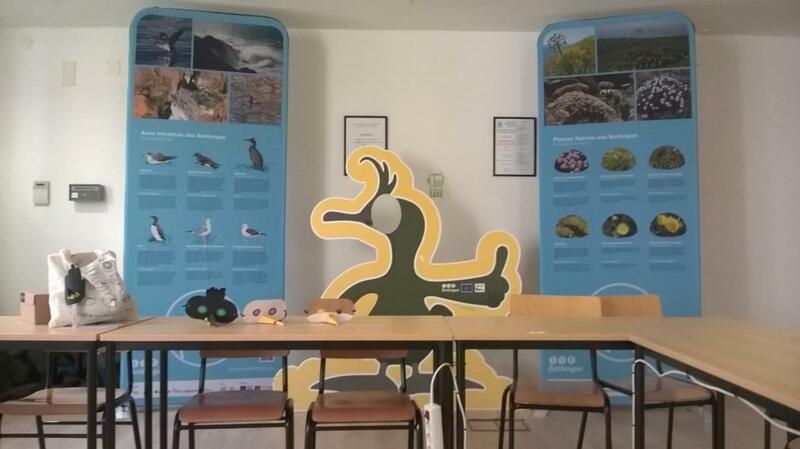 We will have activities in Berlengas (Peniche), Lagoa Pequena (Sesimbra) and São Miguel Island (Azores). We are looking for volunteers interested in our mission and that are available between 3 and 6 months. This is a good way to get involved in nature conservation actions and a good opportunity to learn more. Find out more in http://www.spea.pt/pt/estudo-e-conservacao/projetos/. Contact us by e-mail alexandra.lopes@spea.pt! Environmental Education - A Job That Does not End! With the end of the project approaching, we are also in the phase of completing the activities with the schools. Environmental education actions played a very important role in sensitizing and interacting with the students of several Peniche schools, community elements that are fundamental in the process to improve the perception about the Berlengas Nature Reserve and to help spread the importance of preserving ecosystems like this. In this academic year 2017/2018, we worked with two levels of schooling – 8th and 12th grades - in a phased and continuous approach. The objective was to put the students in more direct contact with the actions developed in the field and the different problems that the Life Berlengas project has been responding to. With the three groups of the 8th grade, from the D. Luis de Ataíde Basic School, it was thought a structure of theoretical sessions with the proposal of developing a work that would culminate in a visit to the island. In the initial theoretical session, the archipelago, the species and the habitats were presented, as well as the main actions of the project and, at the beginning of the second period, we made a clarification session. At that time, they had already completed the theoretical part of the work, the session was meant to improve some parts of the work and to come up with proposals for the practical presentation. 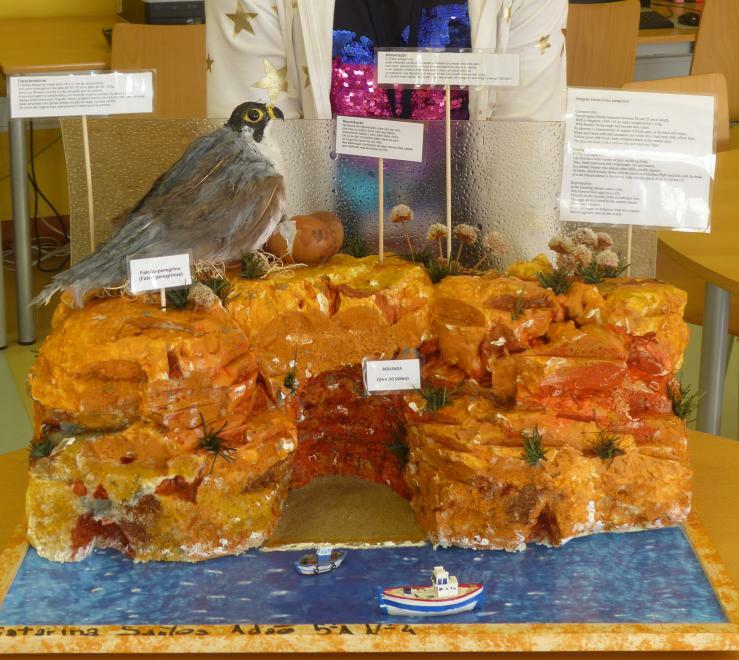 On the 18th of April, SPEA was present to attend these presentations, which took place in the school library and took on a more creative form, such as online quizzes, mock-ups with the island of Berlenga and the animals that live there, traditional games like the Jogo da Glória and even songs. It was very important to see that somehow the islands and their resources were impregnated in the minds of these teenagers. We leave here a small sample of this event - a rap made about the island. To finalize the actions with these classes, a visit to the island was made on May 2nd. The students had the opportunity to take courses accompanied around the island and to develop some more practical works, such as the cleaning and maintenance of the rails and the removal of hottentot-fig. The works were presented on the 23rd of April to some school teachers and also some partners of the project and had musical approaches, interviews and videos, where students exposed goals and difficulties encountered, getting a little more understanding of the dynamics of research and of practical conservation work. Teachers also produced a story, which can be found on the school website. With the summaries of the works done by the students, a pamphlet was produced and was distributed on the day of the presentation, with some copies for archiving and consultation in the school library. You can consult the pamphlet here! In this final line, we know that awareness does not end and does not end with the end of a project, and we cannot fail to stress the importance of involving all entities in order for this work to continue. We depend on these partnerships, especially with key community stakeholders, to highlight the importance and demonstrate why we conserve islands and islets with their unique birds and habitats. Having Peniche this heritage even 'at the door', we believe that these young people will have a crucial role in their dissemination and protection in the medium to long term. rule are the death of numerous seabirds (mainly diver species such as Razorbills and European Shags, for example) and the capture of fish found in nursery areas (breeding grounds essential for the continuity of species). Although the fines imposed are relatively light, benefit to the fisherman is much lower when sued. On the other hand, a series of complaints of the same situation may lead to stricter measures being taken. I reckon sometimes is disheartening to watch illegal acts to continue, but if we are comfortable with the situation nothing will change. We need to at least do our part. If you find gear that is too close to shore and/or surface, take pictures and contact the nearest Maritime Police. It is always worth the attention! At the end of the afternoon on the 2nd of March I decided to dress my wetsuit and catch some waves on the Papôa beach. It is an usual ritual that, whenever I can, I do as I enjoy the harmony and peace of mind provided by surfing. I went to the water alone and at the sea nobody else was surfing, so I was completely alone at the sea; the sea was wild but it didn’t worry me too much. Although Porto de Areia Norte is a rocky beach, at the same time, it is a beach that is only 100 meters far from the house of my Grandparents and 300 meters far from my own house. While surfing on Papoa Beach and even under the peak (where the wave breaks at the very first moment) I saw what seemed to be a belly floating, just about 5 meters far from me. At the first, the surprise and some fear, then I tried to find out and I soon realized it was a Dolphin. With the arrival of a set (set of waves in a row) the body was dragged to the rocks and I saw that it was an adult of Dolphin but I did not understand if the animal was alive or not. I decided to paddle to the animal but it was too dangerous, I waited a little because I knew that inside that small bay the current would take the animal from the rocky dangerous zone, because the water that enters in a bay has to leave somewhere while the bay overflows. A few minutes later the animal was in fact and again on open sea, next to the channel, where the waves do not break because of deepwater and the current power. Ok, now I knew that I can easily see if the animal would still be alive and to what specie it belonged. I carefully paddled to the animal and it was already dead, but the body was incredibly fresh. It was an adult female (approximately 2 meters) of Delphinus delphis. When I was trying to identify the dolphin species and the possible causes of death, a couple of Seagulls tried to attack me, something like claiming these discovery for themselves, perhaps afraid of missing dinner or something similar. After satisfying my curiosity I left the dolphin with the Seagulls and I remembered a Poem by Eugénio de Andrade that ended with "Good evening, I go with the birds". Because it was getting dark, I decided to return to the surf and I started to paddle trying to make some more waves before the natural light ended. A few minutes later when I came out of the water, I saw that the animal was landing on the beach. It was a female, apparently, pregnant. Moreover, the animal tail suggested it had been trapped by something, probably fishing nets. Maybe that was the cause of death. Still with the wetsuit on and carrying the surf board on my hand, I decide to run, straight to the Berlengas reserve head office to give them this information. At the end of the night, after dinner before we went to sleep, the Poem to fall asleep was just the one that Eugénio de Andrade dedicates to his Mother and to all Mothers and wishing that the Mother and calve of Delphinus delphis, had gone with the birds. It’s urgent to reduce the consumption of plastics, we can make the difference! Regular coastal inspections to monitor strandings of seabirds and marine mammals is one of our tasks in SPEA. Our ecological footprint on the planet is easly noted along the beach. Every day, lots of plastic arrive and stay in the sand. However, simple changes in our habits may reduce the unnecessary consumption of plastic. For example, we need to stop buying plastic bottles and take reusable ones. The same applies to plastic bags. Avoid the use of drinking straws, it’s appears a simple thing but when this is lost in the nature is very dangerous to the animals. If you can, choose to buy in bulk to replace packaged products, it’s really makes the difference! The most important is: every time you think about to buy something, ask yourself "I really need this?" Everything we buy in the end is garbage, so buy with conscience. Pollution of the oceans by plastics is a serious global environmental problem that threatens marine biodiversity. It is our responsibility to preserve the common home and to think about future generations. 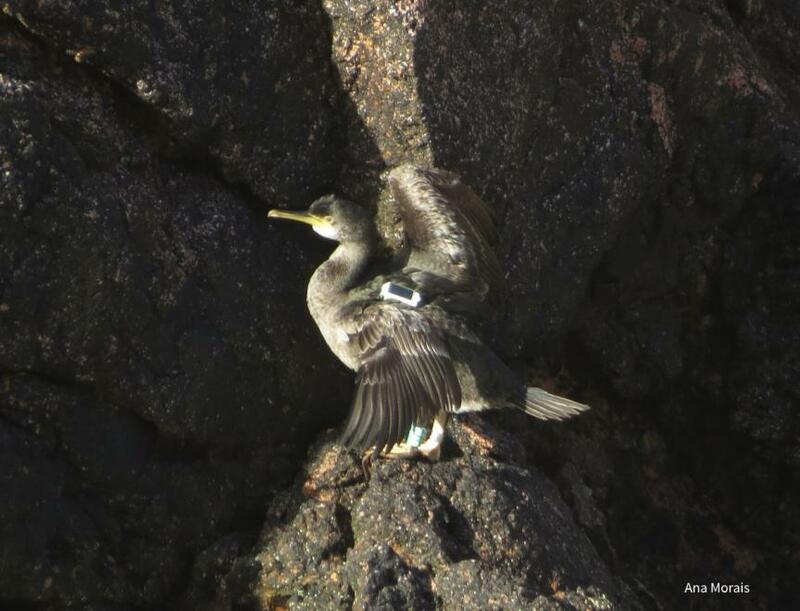 With great sadness we report that one of our GPS marked shags in Berlenga Island died. We still remember the emotion felt on our first meeting in last October, and enjoying to see it flying back to the wild, so serenely, atfer let us put a backpack on him. The purpose was simple, to better understand its behavior at sea and find its preferred feeding areas. Nothing would have predicted that this story would end so tragically. For 5 months we received its locations on a regular basis. With coastal habits it took refuge in Baleal and occasionally explored the coast of Peniche. We were looking forward to this being his first year as a breeding adult. Until the day we lost contact. One week passed till we received information again, and it wasn't good news. Our shag had been in the sea, far north of Berlenga Island, and had reached the beach near Quiaios, in Figueira da Foz. With the last locations received we went there, in the perspective of finding the animal and trying to understand what happened. When finally found, there was almost nothing left, just half a wing, some feathers, and the GPS. Unfortunately we cannot conclude much about the causes of death, we suppose that it died or was seriously injured in Peniche, drifted for several days till it get stranded on the beach, where it was caught by a carnivore, probably a wild boar, and devoured in the adjacent forest. Remains the great contribution of this little fellow to the knowledge of Berlengas population, and we have now another reason for encouragement to continue to work in helping this species that has so many threats. What makes us move is the hope that in the future we will be able to guarantee better conditions for this fragile population to live and thrive. 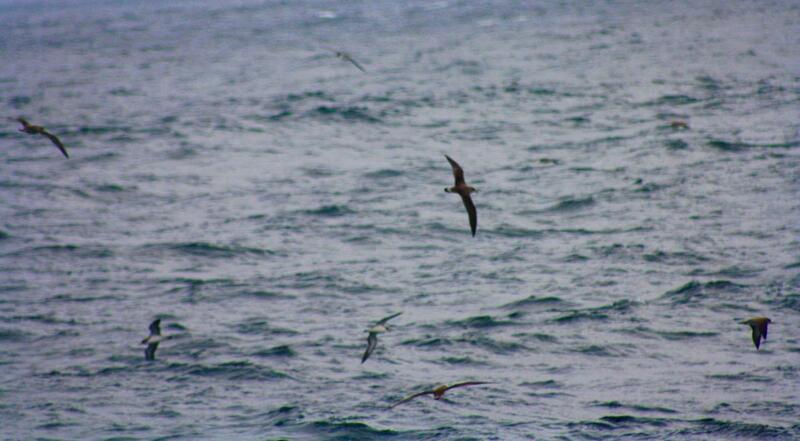 Cory’s shearwaters are back to Berlengas! 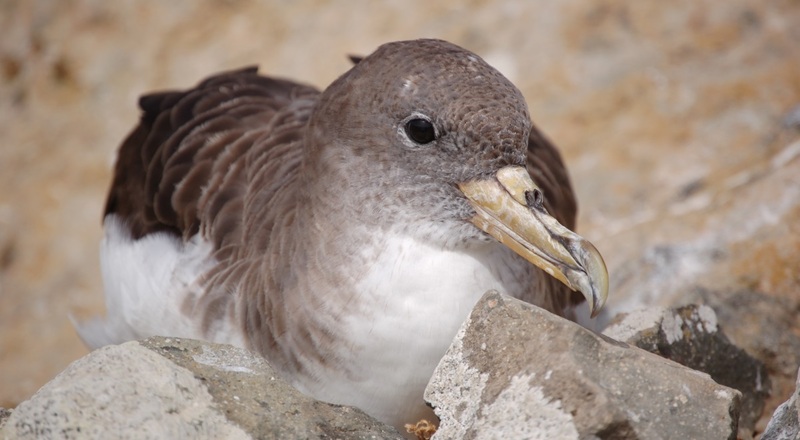 With another breeding season coming soon, the Cory’s shearwaters are leaving their wintering places on the high seas and returning to the colonies to find its mate and occupy the best nests. In Berlengas we can already see and hear them! The Berlengas archipelago is home to 800 to 975 nests, the largest colony in mainland Portugal. We hope the conservation actions developed under the project will continue to increase this numbers in future years. There will be more and more juveniles being born and giving their first safe flight here. We wish very good luck to our Cory’s shearwaters in this very important period. 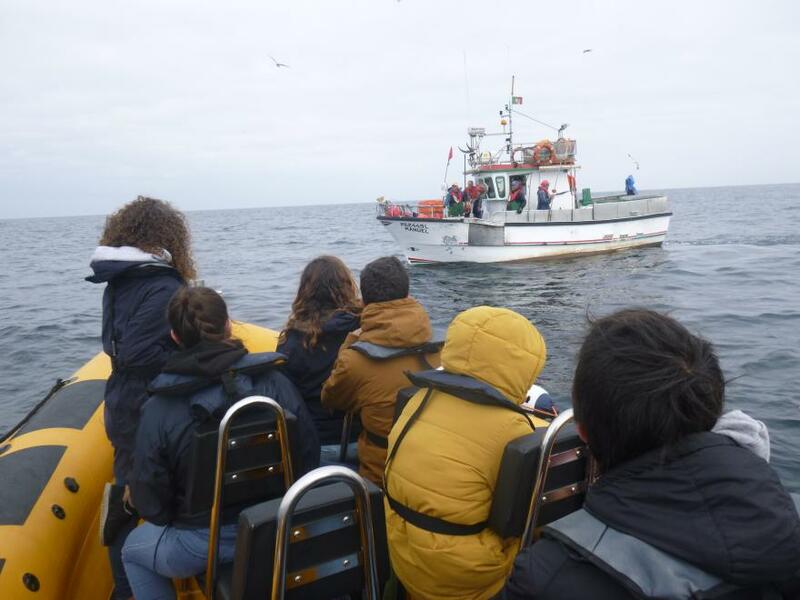 The students of Escola Superior de Turismo e Tecnologia do Mar who attended the training on ESAS (European Seabird at Sea) methodology and identification of seabirds went to sea to put into practice what they learned. Spea team was in charge of the trainning. This type of censuses allows us to obtain data on the distribution and abundance of marine species. A continuous monitoring is essential at the Ilhas das Berlengas Special Protection Area. We had a sunny day with very interesting sightings. Throughout the day we observed the Razzorbill, the Northern gannet, the Great skua, the European shag, the Great cormorant, the Yellow-legged gull, the Lesser black-backed gull and the Common murre! Short-beaked common dolphins and Bottlenose dolphins also came to visit us and were received with great euphoria. It was gratifying to work with such hard-working graduates in a sea full of life. At the end of the day, students were already able to identify the species they saw and independently record the data. 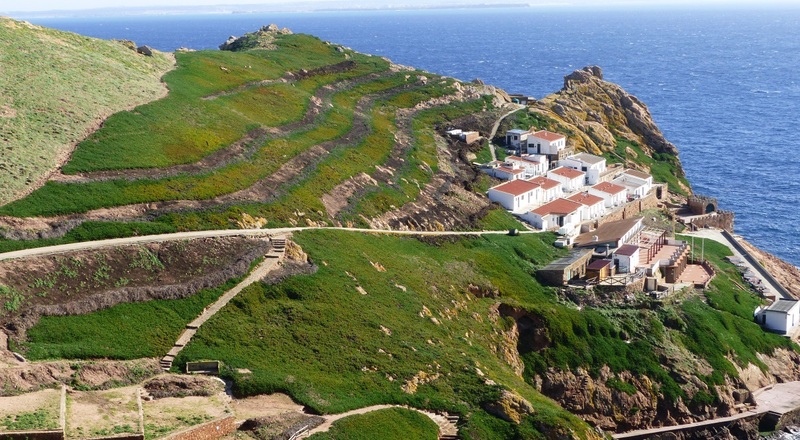 With more than three years of the project, Life Berlengas already counts on several achieved and successful goals regarding the control of invasive alien species on Berlengas archipelago. The presence of these species is one of the main threats to its fragile ecosystem, causing negative impacts on its native fauna and flora. Over 80% of the Hottentot Fig has already been effectively removed. There are no signs of Black Rat in Berlenga since November 2016. This last winter another rabbit control campaign has been carried out which is expected to have been effective in removing the last individuals of this species. To mark these actions of control and eradication of invasive alien species and to share experiences with similar projects, a Workshop on Restoration of Island Ecosystems was held in Peniche at the end of January. This event took place over three days, with the first two dedicated to the presentation of results on other islands and the third to a visit to Berlenga for a practical demonstration of some results. The workshop was attended by a panel of international speakers who presented several case-studies of similar projects that aim the control and eradication of invasive alien species in remote environments. Islands such as the Scilly (South of England), the Giannutri (Italy), the Shiant (Scotland), among others, face similar problems: how to deal with introduced mammalian populations, remove them without harming other species and certify that no introductions occur again. The common denominator was almost always the mammals, in many cases, introduced accidentally. But in all projects, doubt prevails: "What if they come back...?" Different methodologies have been presented to remove species and "innovative" and "creative" methods to monitor their occurrence and the implementation of biosecurity measures, in order to avoid their reintroduction. The afternoon of the second day was devoted to discussing important themes regarding this issue. The organization of the discussion groups on three themes - biosecurity; communication with the public; and evaluation and monitoring of habitat restoration - was important to list several aspects that will be useful in this final phase of the Life Berlengas project and ideas to be implemented in future projects. At the end, and already thinking about the After-Life Conservation Plan, it is important to ensure that conditions have been created to maintain healthy habitats and seabird populations, and to monitor the islands so that no new introductions occur again and, if it happens, to put in practice an effective methodology of control. 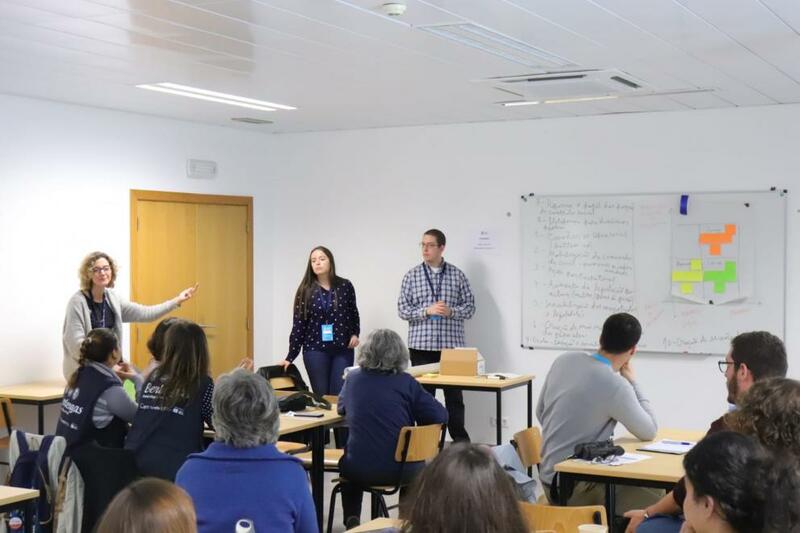 In this way, this workshop reached its objective because it allowed the exchange of ideas between different specialists and to make known the reality of Berlengas, successes and difficulties, regarding the control of invasive alien species and to involve the population in the actions of the project. See some photos of the event here! Contamination of water by hydrocarbons is a major cause of mortality in marine life. For the birds the contact with oil is disastrous. When the oil adheres to the feathers, they lose their natural structure and disposition, damaging the waterproofing and the insulation they offer. By instinct, the birds try to remove and clean the oil from the feathers, inadvertently ingesting it and causing serious damage to the internal organs, or eventually dying from exhaustion, dehydration, or hunger. 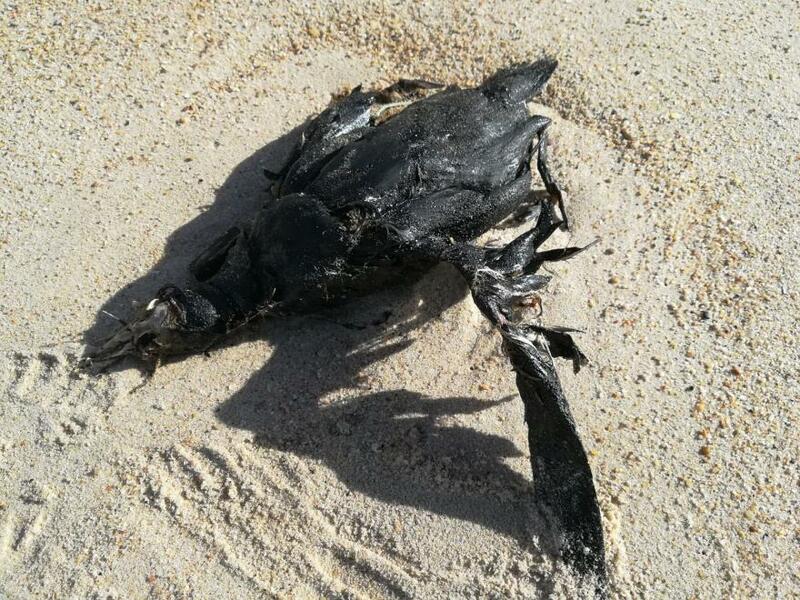 Recently having been arriving to the Portuguese coast dozens of seabirds covered with fuel. A significant number of them are found to be lifeless and the rest are sent to CRAM (Marine Rehabilitation Center) in an attempt to save them. The most affected species are the razorbills and the common murre. These birds are wintering species and choose our sea in search of refuge and food. 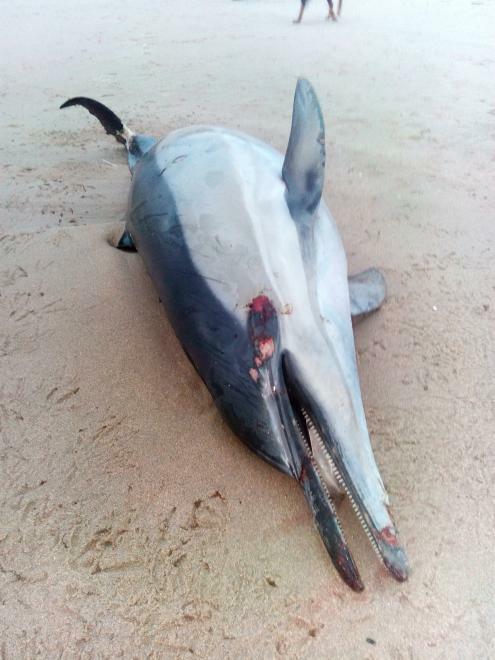 The origin of the spill is still unknown, but it is urgent to perceive the situation since there are already several records of stranding’s in the northern half of our country. In addition, this is an atypical situation given the large number of birds stranded, in such a limited period. If you find weakened wildlife, contact SEPNA / GNR, the ICNF or the nearest wildlife recovery center immediately! Situations like this should also be communicated even with the animals that are already dead to realize the size and distribution of the contamination. The Life Berlengas team went back to the school at the beginning of the 2nd period, this time for enlightenment sessions with the 12th grade about the work these groups are developing on the various issues addressed in the project. In October 2017, the three classes of the Secondary School of Peniche went to Berlenga to know better the project and to verify some of the practical actions that occur in the field. So far, the groups have already developed the introductory part of the work, with a contextualization and theoretical approach to the different problems. There is now a need to explore practical solutions to help propose intervention measures for the different problems. Accidental catches of seabirds, biosecurity and waste and water management are among the topics covered. Who knows, do not come from here some good ideas. In April they will present the works, and our proposal was to bet on unconventional formats, which could make the presentation appealing. We are curious to see the result. This is the testimony of a "lost" biologist who, in her almost obsessive-compulsive attitude of organizing the world, devoted herself to the management and complex world of financial records. I have been working at SPEA recently and almost always in the office among many excel files, so a week in January at Berlengas seemed the perfect start to a new year. Even with the cold (which was not so bad), the strong winds (which were not anything too) and the constant feeling of wet feet (that was constant! ), my stay could only prevail for the best. Walking the cliffs in search of nests, putting traps to detect the presence of rabbits, making waits on rocks in the hope of picking up shags... All these experiences surpassed expectations, remembered the taste of being outdoors, and renewed energies by knowing that one is contributing to the conservation of a unique habitat and wonderful species. The days were filled with different works, with well-disposed people and with those moments that allow the rare opportunity to contemplate what surrounds us and just let ourselves be dominated by the sensation of the present. All the work with the volunteers is meritorious and this has been, in fact, a huge help for the whole project. From this experience I can only emphasize positive aspects... with the exception, perhaps, of the sea which always makes turbulent arrival on the island. But if it was easy and smooth, wouldn’t be as enjoyable. 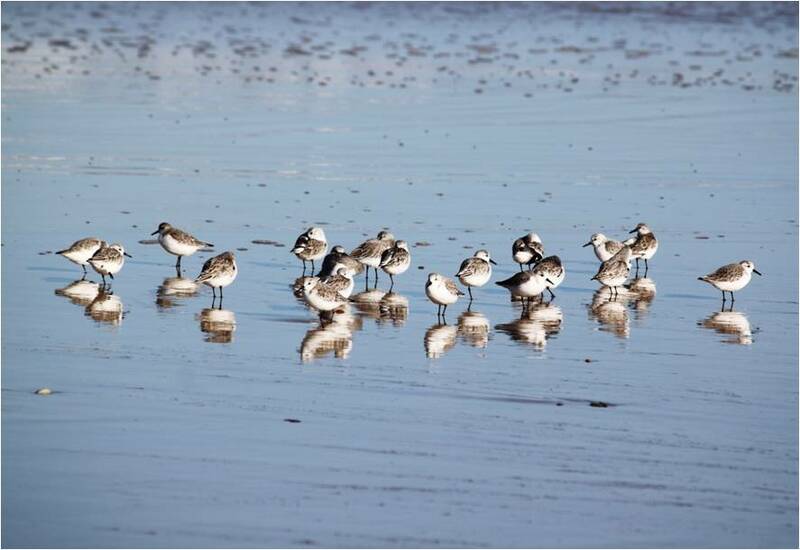 The main objective of the Arenaria project is to carry out an annual monitoring to know the distribution, abundance and population trends of the birds of the Portuguese coast during the winter, especially the shorebirds. It is a joint initiative of ISPA - University Institute, National Museum of Natural History and Science and SPEA. Resident population: 11 individuals (2 lighthouse keepers, 2 nature wardens and 7 workers and LIFE Berlengas project volunteers). Distribution: is a species endemic to the Berlengas archipelago, dispersing to the Peniche area through random weekly and / or monthly movements. Habitat: is found throughout the island of Berlenga, being sighted in rocky, flat or steep areas, and even near the sea. Individuals spend the night in the highest part of the island, in the lighthouse. Description: is generally the same as the species found on the continent, but is distinguished from this by having a characteristic damp appearance, constantly wear boots, waterproof clothing of different colours, cap and / or hood on the head. It is still frequent to see individuals using tools, such as binoculars, telescope and walkie-talkies. There is no marked sexual dimorphism due to the amount of clothing used by the specimens of this subspecies. Behaviour and ecology: they are active from sunrise to the end of the day. They stir and remove Hottentot Fig on rollers on the slopes of the island; they move to find, count and watch shag nests (Phalacrocorax aristotelis), capturing and ringing the birds when possible; seek out rabbits by means of traps baited with fruit and vegetables, plant sowing of endemic plants at local and Iberian level, such as Armeria berlengensis and Angelica pachycarpa; and make countings of seabirds passing through the surrounding waters. This subspecies is completely adapted to the lack of fresh water for hygiene and electrical and network limitations. In the late afternoon and evening, they form clusters to play games and play activities. Reproduction: do not exhibit behaviours of this nature nor form couples. Feeding: usually omnivores, with some specimens with physiological and / or ethical dietary restrictions. They eat constantly, being sighted often cooking, looking for food and talking about food. They prefer bread and butter. Threats: the end of the LIFE Berlengas Project, bad weather and high pressure from seagulls and invasive species of fauna and flora. Recorded conclusion: it was a great week in an isolated and paradisiacal place, with large Homo sapiens berlengensis and where a dynamic and crucial project for the conservation of the Berlengas Nature Reserve is in force. At present we have two distinct mitigation measures in place: modified hooks (black and sable) in longline gear on the "Dois Filhos" vessel and contrasting panels on gill nets on the boat "Meu Regresso". Both operate regularly at the SPA (Special Protection Zone) of Berlengas Islands. To make sure that these measures do not harm the economic component of fishing, catches other than quantified and identified are measured or weighed on board. The goal is to see if modified hooks and panels do not interfere with habitually caught species. With the arrival of winter, it has not been easy to board frequently to be able to talk about results. However, we expect to see some news in the coming months regarding both the feasibility of measures on incidental catch of seabirds and the assessment of their economic impact. The crews have been impeccable in collaborating on the project and taking an interest in conservation issues. So, it gives a lot of pleasure to work like this! Storms are associated with adverse oceanographic factors, such as currents and strong winds, which may be the cause of the stranding of marine animals. In addition to natural causes, other conditions, such as diseases and human actions, can leave the animals confused and debilitated, eventually giving to the coast, often dead. 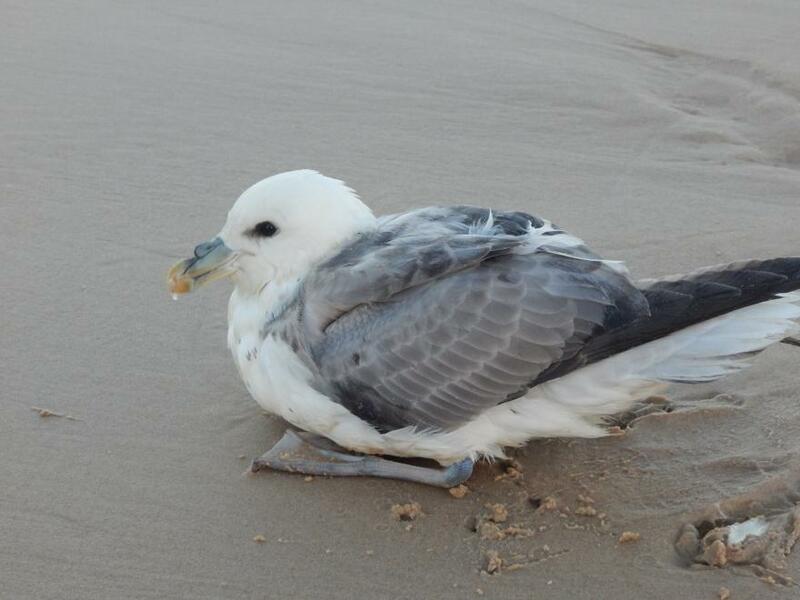 Although seabirds are adapted to many difficulties, there are times when they weaken and can not continue the way, stranding on the beach. Last week, following the passing of the storm Ana, we carried out a coastal inspection on the beach of Gâmboa-Baleal in Peniche, to monitor animals such as dead or injured birds in the sand, quantifying damages after the storm. It was in the middle of the transect that we found the "Francisca", a fulmar (Fulmarus glacialis), lost and weakened by the sea. This bird is typical of the Arctic Ocean and North Atlantic, being very rarely sighted in our waters and coast. After its collection the bird was delivered to the care of the ICNF to be later sent to the CRAM (Marine Rehabilitation Center), where it is currently resting. We expect our fulmar to regain the strength to later be released, and continue on its way, flying well north. If you find any wild animals that are injured, weak and in need of help do not hesitate to contact SEPNA / GNR, ICNF or the nearest wildlife recovery center! Text and photos: Joana Bores Ramirez and Tânia Nascimento. We caught the bird of the year! After months of attempts we finally managed to catch shags! The preference of shags for cliffs, the steep and inaccessible terrain of Berlenga (and some bad luck), made this task difficult and sometimes desperate. But there is nothing you cannot do with a little work and perseverance. And it was with great happiness that in our last stay in Berlengas, we received a visit of two shags. 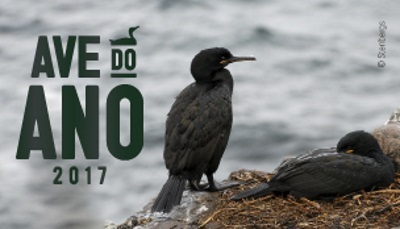 ‘Viriato’, a juvenile shag, was the first to be captured at night where it slept, and a few days later it was the turn of 'Nuno', a third year immature, to say hello. The purpose of these captures, apart from marking them with colour rings, is the deployment of gps/gsm devices that regularly collect locations and allow us, among other, to define feeding areas. Data such as these are essential to improve our knowledge about this population and thus act more effectively in its conservation. Cheers to our shags, that they fish a lot and give us many information. We keep waiting for the next ones! As part of Life Berlengas' Environmental Education activities, 12th year students at Peniche High School were on Berlenga Island on 23rd of October. They became better acquainted with the actions of the Project on the ground, observed the results already achieved and collected information for the preparation of their work in the Project Area subject. These will focus on different issues of the archipelago such as biosecurity, incidental catches of seabirds, and others. In the afternoon, there was still time to tear hottentot-fig and thus contribute to the conservation of this valuable ecosystem. For one year I collaborated with SPEA as a fisheries observer under the Life Berlengas project. 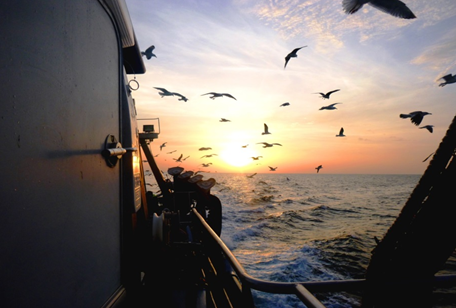 The main purpose of our presence on the vessels is to monitor the interactions between seabirds and fishing gear. I have learned a lot on sea days, both in identifying species of seabirds and fish as well as legislation and fishing dynamics. I have had the opportunity to work with various gears (longlines, gill nets, traps and siege) and in boats from 7 to 20 meters. The crews also diverged from each other but all of them were curious, receptive and welcoming. Every day, in the fishermen, I saw courage, faith and knowledge. I have lived with true heroes of the sea. However, there is a need to continue to draw attention, particularly regarding marine litter and by-catches. Our support and guidance are important, and we can even change attitudes. Seabirds abound in number and diversity in the Berlengas special protection zone and it is gratifying to be here. Cetaceans and moonfishes also show up frequently and are always wonderful sightings! I am still privileged with the sunrise and the indescribable sunset that I can enjoy. Not always the sea is calm, it is not always easy to wake up early and bed late. However, the profession of fishing observer surprises me, defies me and delights me. Each day at sea was and continues to be an adventure. Between September 28th and October 1st, the SPEA team was at the largest sustainability event in the country, GreenFest Estoril 2017. This is a privileged moment to promote not only the Life Berlengas Project, its objectives and actions, but also to make known the work of SPEA as NGO’s and to raise awareness of the importance of all of us to adopt more sustainable behaviors in our daily lives. There was also time to stimulate a series of activities of Environmental Education dedicated to children and adults about Life Berlengas. In track games, video visualization and construction of masks, everyone got to know the seabirds of the Berlengas archipelago better. 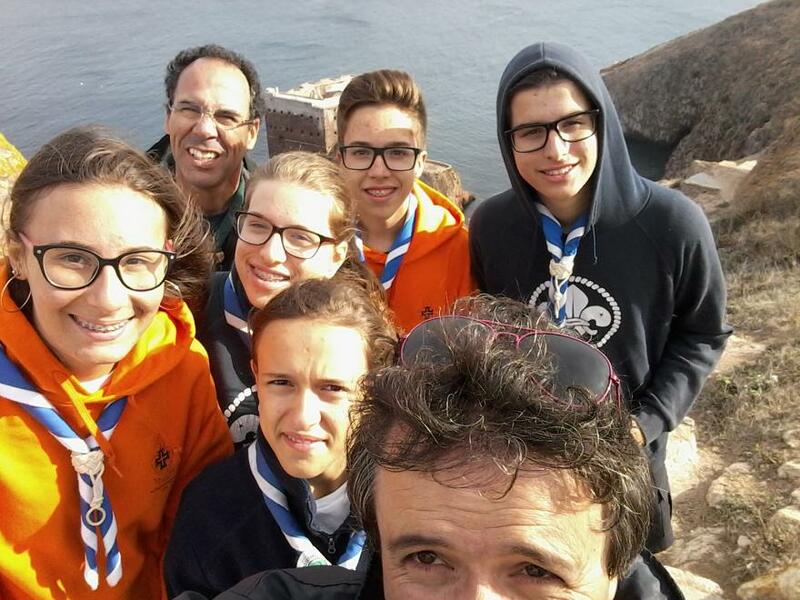 Scouts from Guarda Grouping 134 joined Life Berlengas in removing the hottentot-fig. 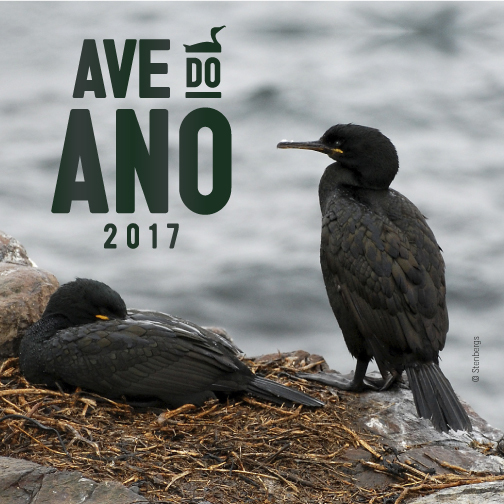 The European Shag Patrol won, as a prize for the best video about the Bird of the Year 2017, a stay in Berlenga to visit the intervention areas of the project. They had the opportunity to participate in various activities and even left their contribution in removing the hottentot -fig. Speaking for the whole team, the activity was excellent. We were very well received by both SPEA and the Navy. SPEA offered us a kit with a t-shirt and a map of the island and the lighthouse lords lent us the facilities and did a guided tour of the lighthouse which was very enriching. The island itself is beautiful and we all liked to have spent more time there. Speaking for the whole team, the activity was excellent. We were very well received by both SPEA and the Navy. SPEA offered us a kit with a t-shirt and a map of the island and the lighthouse lords lent us the facilities and did a guided tour of the lighthouse which was very enriching. As for the activities, the observation and listing of shags was excellent as it allowed us to touch the birds and realize some of their daily habits. The cleaning of the Hottentot-fig required some physical effort, but it was very gratifying to know that we were contributing to a common goal. Thank you very much for the opportunity that was given to us and we have attached a photograph of the team and the leaders who accompanied us. After the visit to the Berlengas, during the celebrations of the 36th anniversary of the Nature Reserve, our member José Marques gave us his testimony through an article published in his personal blog about the experience he lived on that day. On September 16th, the SPEA team returned to Cape Carvoeiro to introduce Life Berlengas and the species of seabirds we protect, under the DONAs activity. We focused a lot on the European Shag for being the Bird of the Year and we invited people to stare at them while they were staying at Nau dos Corvos. Surely they will not look at that great rock without thinking about its meaning. It was also easy to show the yellow-legged seagulls that took advantage of the strong winds to glide. The public ranged from locals to tourists of various nationalities and, in general, they were interested and enthusiastic about getting to know the project. It was gratifying to teach kids and adults how to use binoculars, identify some of the species of seabirds that pass by, and hear that "good job!" It was a sunny morning, privileged view and sharing of knowledge. Being part of the Life Berlengas volunteer team was an experience that enriched me both personally and professionally. Cooperation in all the tasks carried out under the project (much diversified tasks, involving both the fauna and the flora of the island), has further alerted me to the fragility of an ecosystem that needs to be rehabilitated and which has to continue to be protected for a harmonious balance. The involvement in the project also allowed me to meet new people with interests also in the conservation of this ecosystem. In addition, in partnership with other volunteers, I was able to successfully complete a final biology degree project with one of the island's emblematic birds, Shearwater. This is undoubtedly an experience to be repeated. In the end of august we shipped for the Seabird Census (ESAS) in the Berlengas’ SPA. The migration has already started which helped us to bear the rain, the cold and the hard sea conditions. We recorded 18 seabird species, some sunfishes jumping out of the water and several small groups of common dolphins. The major activity is always around Berlengas Archipelago and Serro Sudoeste. It was in these areas that we recorded the Sabine’s gull, Manx shearwater, Sooty shearwater and Great shearwater, Pomarine and Arctic jeager. During the entire trip we saw the Northern gannets, Cory’s shearwaters and Storm-petrels, Wilson storm-petrel, European storm-petrel and Madeiran storm-petrel, in rafts or even in large groups foraging. On our way back to land a very curious Common tern and a small group of Red phalaropes come to say goodbye. When we put our feet on land we were tired and wet but these days were super exciting and we have hueg expectations for the next migration months. 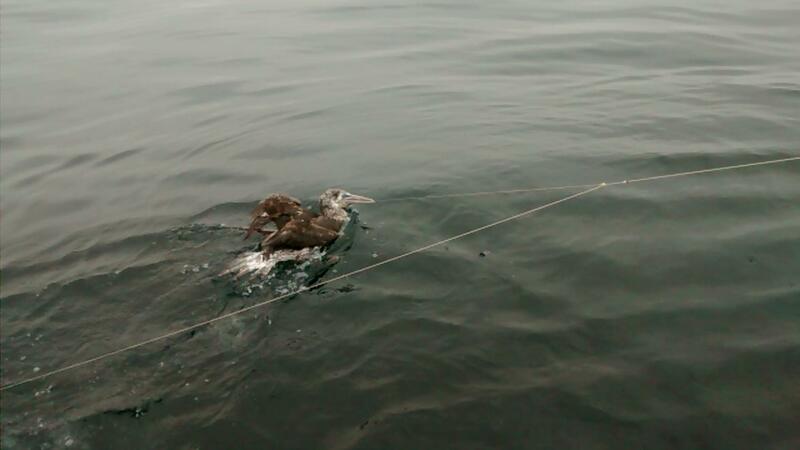 Once again a seabird was bycaught in a longline fishing gear. This time it was an adult Cory´s shearwater, potentially a breeder in Berlengas lslands. Given the depth of the hook in the digestive track, it was impossibe for us to remove it. The bird was sent to CRAM (Marine Animals Rehabilitation Center) and we had the help from ICNF (Institute of Nature Conservation and Forests) and SEPNA (Protection Service of Nature and Environment) in the transport from Berlengas to Quiaios, which we appreciate very much. In the rehabilitation center, the Cory’s shearwater underwent surgery in order to remove the hook. It went all fine, but it isn´t free of danger yet. It’s very important that we keep the work with bycatch mitigation measures to mitigate these events. Species with vulnerable status such as Cory’s shearwaters are very susceptible and it is our responsibility to protect them. And the Brown booby keeps nearby..
We think that the Brown booby really likes to be in the Berlengas archipelago. This juvenile was seen for the first time, in April 2017 and in August it was observed again. This species is very similar to the Northern Gannet in size and morphology, although it has a darker plumage and a bluer beak when it´s juvenile and yellow when it becomes adult. This species breeds on smalls and isolated islands in tropical Atlantic Ocean, tropical Indic and tropical Pacific and probably got lost. We hope it founds his route soon and return to where it belongs. Otherwise, it can be very dangerous because the winters here are much more rigorous. Brown booby observations in Portugal are very rare: in 1994 in Ponta da Piedade; in 2010 in Cabo Raso; and in 2016 in Sesimbra. It’s very important to take a note of these rarities to know more about their migratory behavior. DONAs back to Cape Carvoeiro! 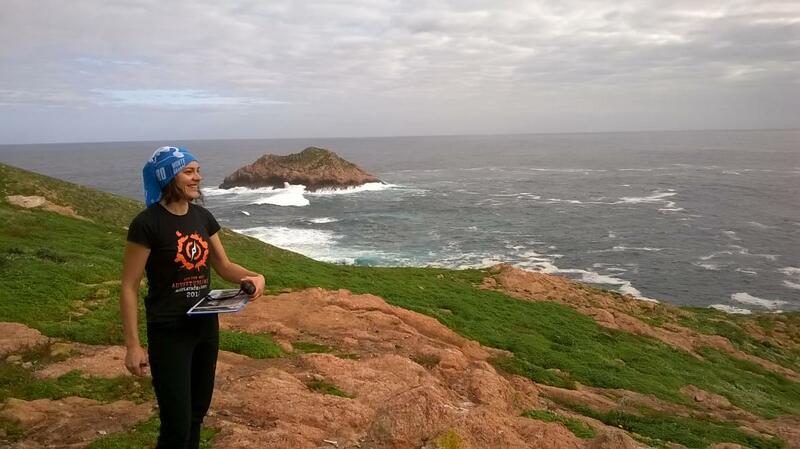 The activities to observe seabirds called DONAs (An Eye on Birds) returned to Cape Carvoeiro! 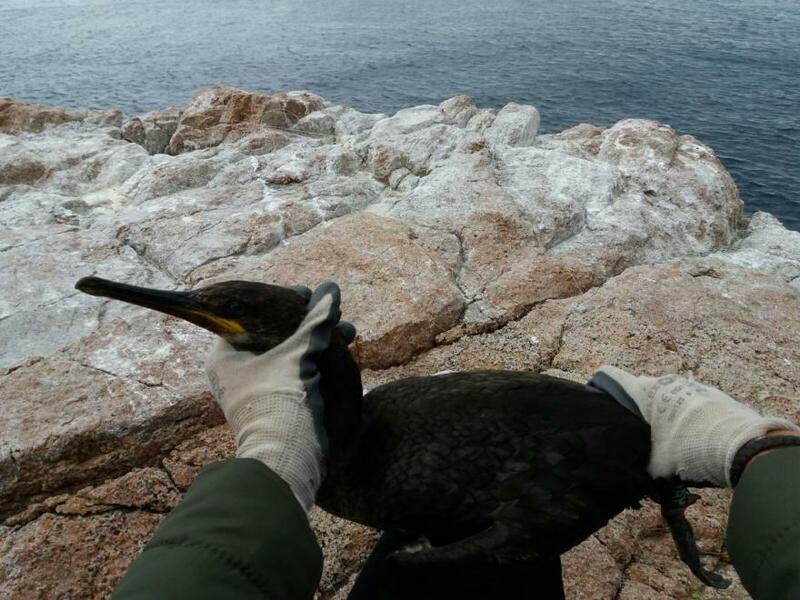 On July 15, SPEA and Life Berlengas returned to Peniche to show to all interested the Shags that were resting on “Nau dos Corvos” and the yellow-legged gulls that were taking care of their chicks. As is common in Peniche, the morning started grey and with the Berlengas hidden in the fog, but a little while later the sun appeared and exposed the birds and the island. Just like last year, we had the opportunity to get in touch with numerous people of different ages and nationalities and publicise the Life Berlengas project. It was gratifying to see the interest and surprise of all who tried the binoculars and watched with the telescope and wanted to know a little more about the birds observed, the SPEA and the Berlengas. Once again we returned home satisfied with the success of this seabird watching activity. We will return to Cape Carvoeiro in August and September! Be aware of the dates and do not miss the opportunity to join us. When I first visited Berlengas in the summer 2016 as a tourist and read about the Life+Berlengas project, I didn’t really believe I will be so lucky to come back one year after again as an Erasmus + intern. But the communication with SPEA people was very fast and clear so I had a wonderful experience as a student but also as a person completely in love with sea-life and nature. 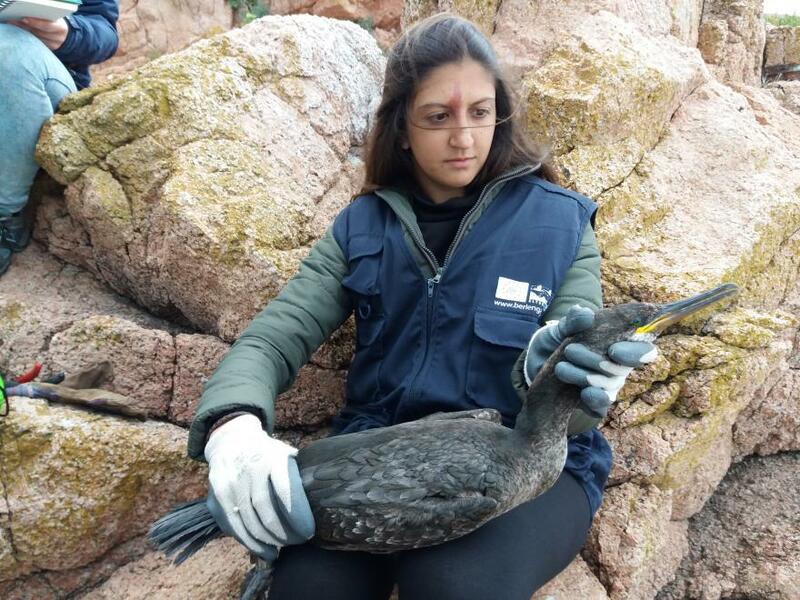 It was a great opportunity to take action in the Berlenga Island and protect nature directly by taking out all the chorão and monitoring European Shags as well as experience working in the office in Lisbon and monitor fishing boats activities in the reserve trough historical data. 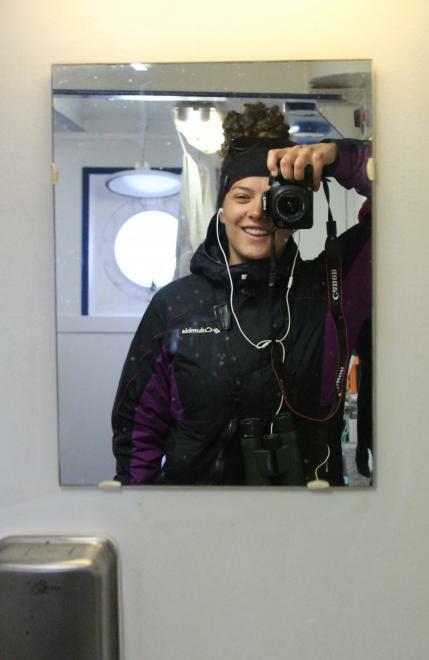 SPEA helped me to live my discovery channel dream for two months, especially moments that I spent at sea counting and watching beautiful Northern Gannets and their amazing diving skills will always be one of my favourite memories! The only thing that went wrong is time cause it runs too fast! I am very glad for this opportunity and would love to say thanks for everyone in SPEA and team in Peniche! Life for seabirds and cetaceans at the SPA of the Berlengas is not always easy. Each day they must avoid the numerous fishing gears to avoid getting stuck in one of them. Seabirds are the most attracted to the fishing gear since they always offer an easy meal. On longlines, birds such as Shags, gulls and Gannets are attracted to the fish that is caught in the hook and end up trapped in the fishhook by catching fish, while diving in search of food in an area with hooks they can be caught by the legs or the wings. Most of the time, these birds are released alive by the fishermen, but other times because of the time the bird was trapped and / or the state of the sea, they end up dying. This week it was a common dolphin calf that was stuck in a line of hooks, something rare to happen, because the dolphins do not usually get stuck in these lines, unlike what happens in fishing nets. 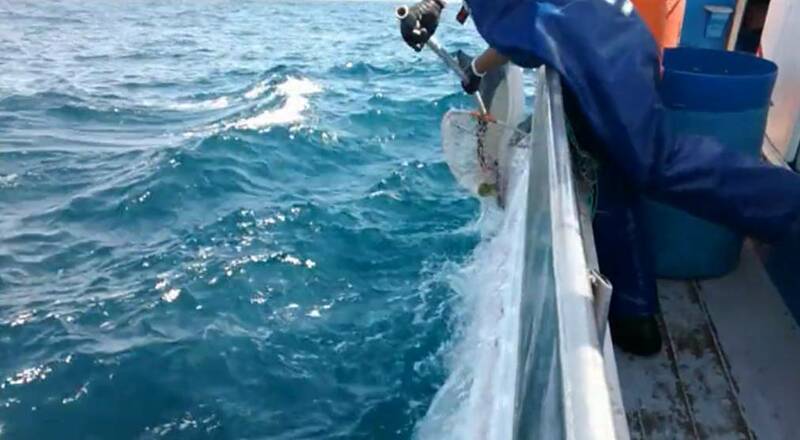 This dolphin calf was released by fishermen who took the lines of hooks that were entangled to the animal's body. 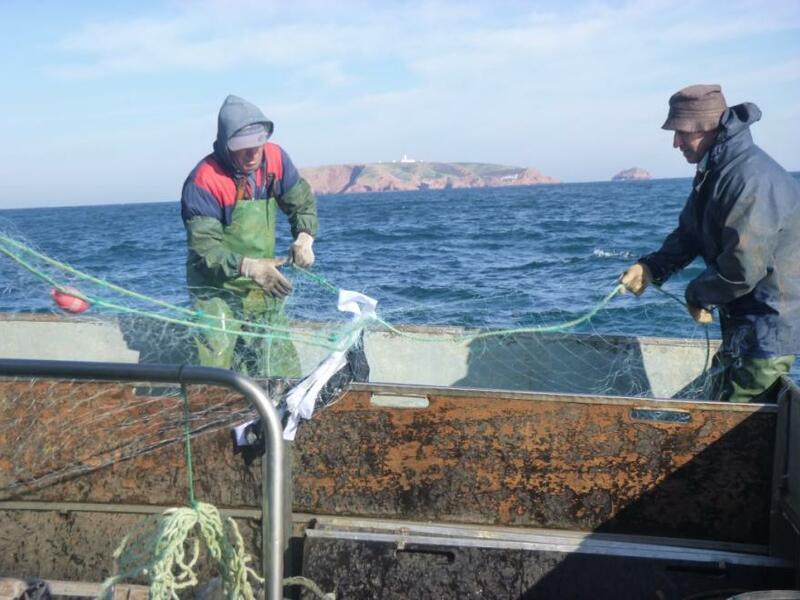 The Life Berlengas team works together with fishermen to reduce and avoid these accidental catches with mitigation measures on the nets and the longline. As part of Life Berlengas, SPEA organized a workshop for professors on the 30th of May. The biology and geology professors of the West region adhered very well to the initiative and spent a different day of learning, outside the classroom. 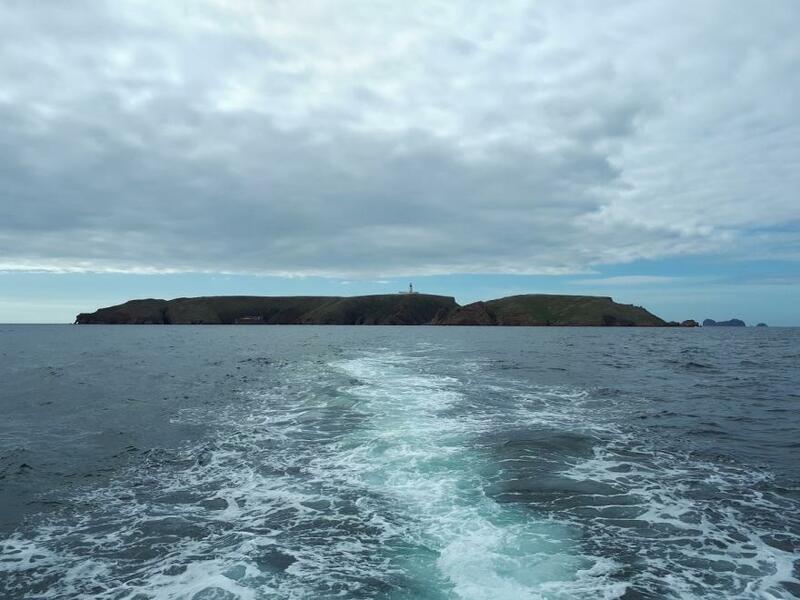 In a journey through some points of the Berlenga Island, the various themes that are framed in the main objectives and actions of the project were addressed. In a very informal and relaxed atmosphere, we talked about the biodiversity of the fauna and flora of the Berlengas, the removal of invasive species, the bycatch of seabirds in fishing gear, sustainable management, the monitoring of fauna and flora and the geology of Berlengas. The goal was, above all, to show on the ground the potential of the island and to demonstrate the relevance of this project to this insular ecosystem. Counting with the enthusiasm of Professor Teresa Mouga (School of Tourism and Technology of the Sea) and with the wisdom of Professor José Romão (Portuguese Association of Geologists), the contents were transmitted with the various floristic and geological examples that the island contains. At the end, a challenge was proposed, as a group, outline activities that can help to work on the different themes in a playful and appealing way over the next school year. Ramón Soto Madrid is a Spanish young men running around the Iberian Peninsula. This idea arose from his concern about the threats affecting the spaces of the Natura 2000. He believes the first step towards reducing threats to the Natura 2000 is to increase the environmental awareness of citizens. If the social majority is on the side of improving the protection and management of these spaces, it will be possible to have policies aimed at this and not at the continuation of policies that promote uncontrolled urbanization, intensification of homogeneous cropland and over-exploitation of aquifers, among others.It is for this cause that he will run around the Iberian Peninsula clockwise, starting at Cabo de Palos, to return to the same place 6 months after having travelled more than 4000 km. He hopes that with the help of experts, ecologists, organizations, etc. and the people he meets along the way, he can achieve this. In his way through Peniche he met the Life Berlengas team who explained him the project, its objectives and main actions. For us it was a pleasure and we wish him a good run! Here you can follow Ramon Sóto Madrid Facebook page. And here, you can see a video on seabirds and fisheries interactions by Ana Santos from SPEA. Every year Norway (research vessel of the Portuguese Institute of the Sea and Atmosphere) goes overboard to monitor the sardine stocks. 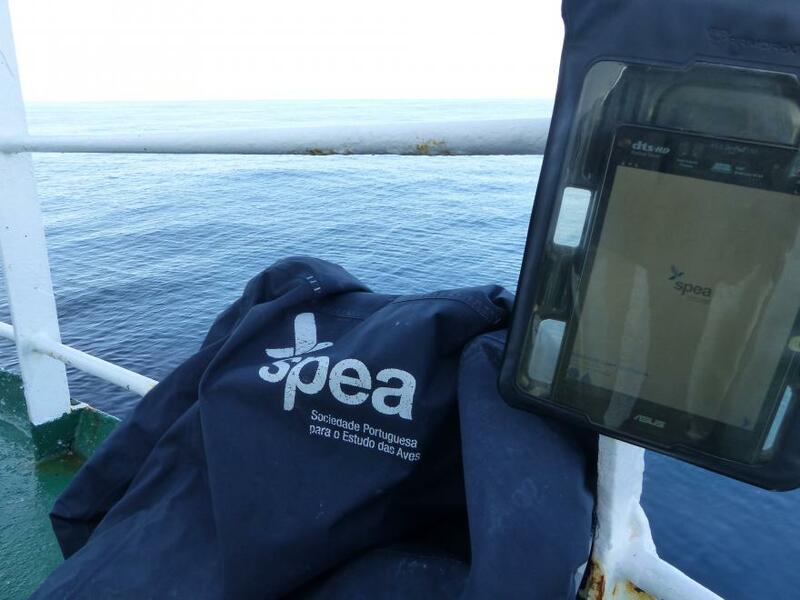 To take advantage of the "hitchhike", SPEA team members come together to carry out ESAS (European Seabirds at Sea) counts and collecting data on fishing events with trawling gear. The last trip we attended lasted about 20 days and was very positive. The observation effort was high (about 9h / day) and many species were recorded. Of the most common we recorded the Balearic Shearwater, the Great Skua, the Scopoli’s Shearwater, the Common Scoter, the Sandwich Tern, the Northern Gannet, the Yellow-legged Gull and the Lesser Black-backed gull and the less frequent Parasitic Jaeger and the Black Tern. 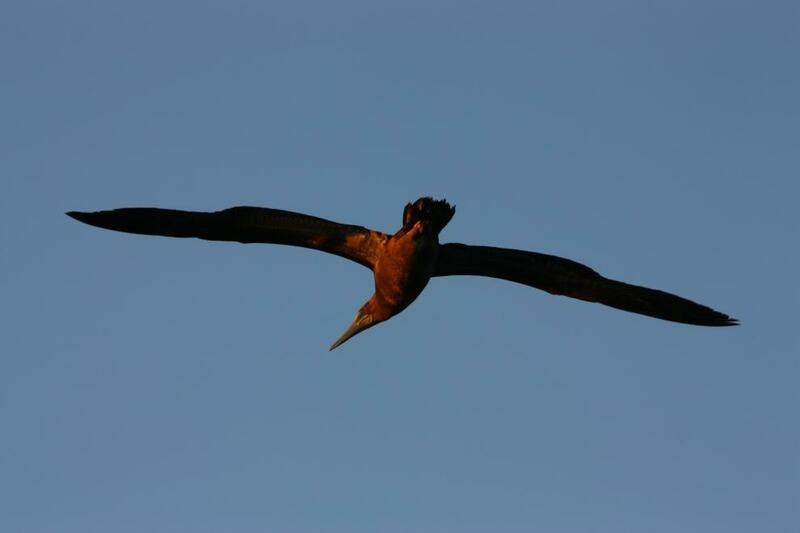 Nevertheless, the passage of a Brown booby was the surprise of the campaign. This is a very difficult species to observe in our country! In addition to counting and identifying species of birds, we recorded other marine animals such as cetaceans, sharks and moon fish. This type of information is essential for assessing species distribution and behaviour. So, by knowing we can protect. The Shag is a species whose population is mostly in the island of Berlenga. The number of individuals is reduced and so it is important to count the breeding couples to evaluate their history. Shag couples are still in breeding season and this is a suitable time to count active nests. 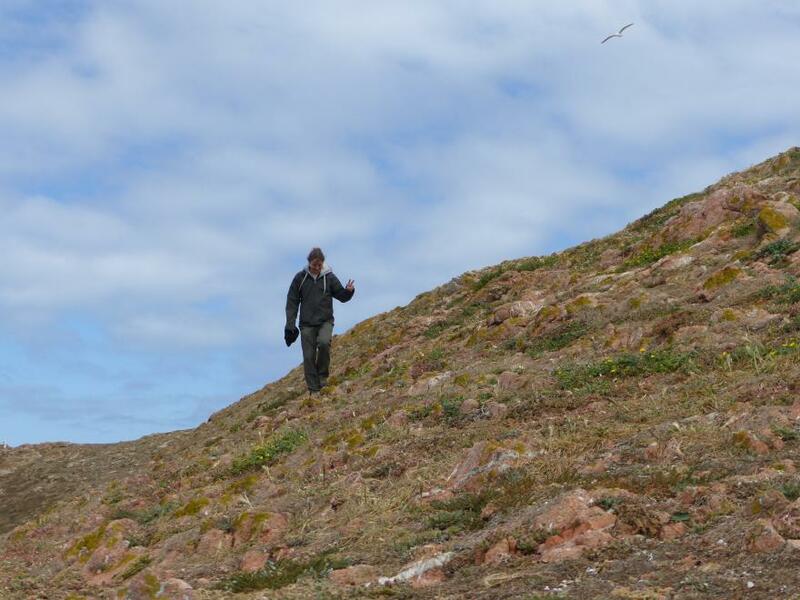 The monitoring of the nests in the Berlengas archipelago is carried out annually, unlike what happens in other places. However, this year the SPEA team along with some volunteers will prospect some of the sites of possible nesting along the Portuguese coast to update the information regarding the number of breeding birds. In the coast of Peniche, we counted 3 active nests and we had the opportunity to confirm that one of them contained 3 eggs. Soon we will return to the place to check the hatching of the chicks. Cory’s Shearwater that breed on Berlenga Island count on new 14 artificial nests built by the collaborators of the Reynaers Aluminium, S.A. During the last May 20, 62 collaborators and their families were building those artificial nests in a new site on Berlenga Island, expected to be soon occupied. Besides the presence of 2 known nests in this site, the short availability of natural cavities has been a limitation for the establishment of new breeding pairs here, once the natural burrows collapse very easy. By building these artificial nests we guarantee long time safe cavities, as expected for this species. In the scope of Life Berlengas and its Environmental Education actions, we have been collaborating with 4 classes of the 5th year of schooling of the Basic school 2, 3 Dom Luís de Ataíde in Peniche. Throughout this school year, we visited the school several times to present to the students the Life Berlengas Project and to awareness the enormous natural heritage of this archipelago. This collaboration, which had the precious support of Professors Lígia Neves and Maria Del Carmen, ends now with the presentation of the students' work, inserted in the Animal Project. 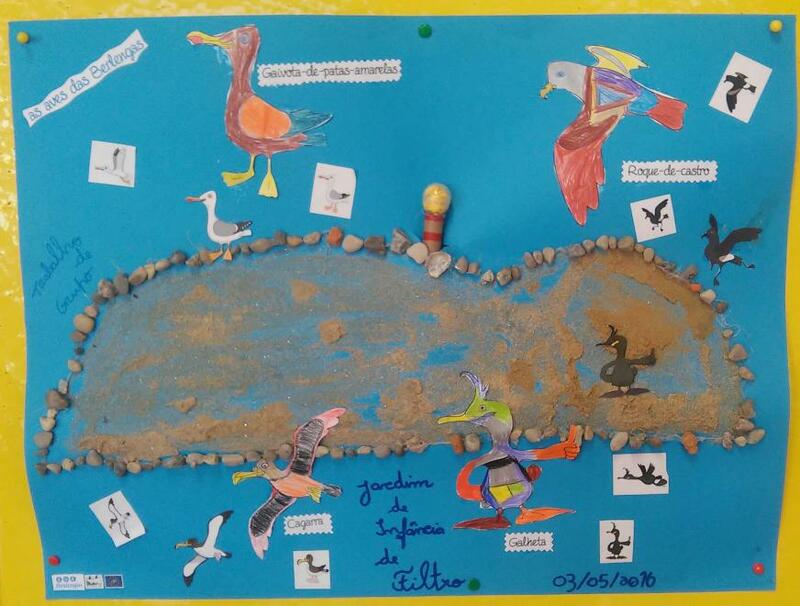 This is an initiative already developed in the school, but this year it focused on the fauna of Berlengas. We were delighted with the work, not only for its quality and creativity, but also for the way students engaged, how they engaged family and friends, and how proud they were of their results! These children discovered species they had never heard of and realized that there is such a special and unique place so close to them. This is the first step, for them tomorrow protect and preserve the Berlengas archipelago. 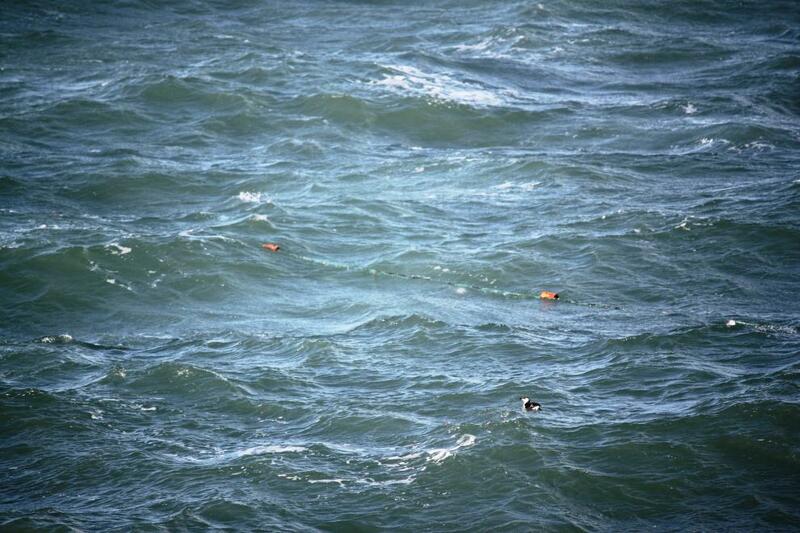 Last week the LIFE Berlengas field team was capturing Shags to mark them with metal rings and coloured rings. Ringing birds allow us to identify each individual throughout his life and allow us to know his habits. In wild birds, metal rings with a single code are normally used, but sometimes and additionally also coloured plastic rings are used, which allow the "number" of the ring to be read from a distance, without being necessary to disturb the bird. 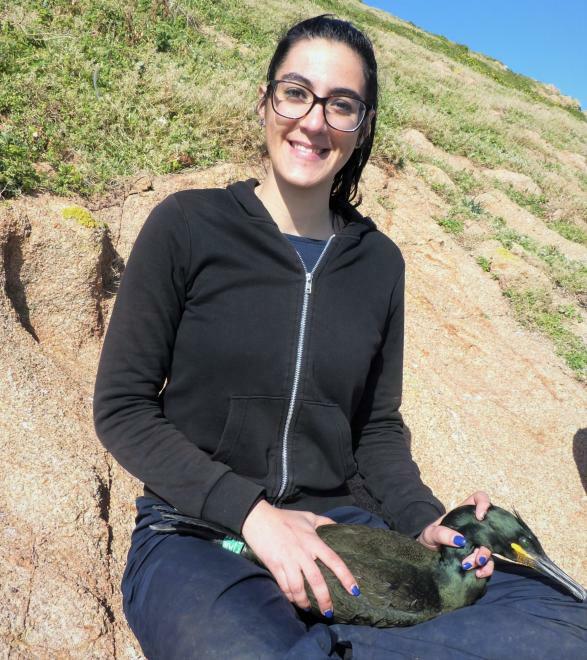 Under the LIFE Berlengas project, the Shags are being ringed with green coloured rings, which have white letters and numbers. By recording the observations of these animals, it is possible to know their movements, especially if they remain in Berlenga or if they move to other places, their feeding areas, and eventually also know threats they face. After the birds are handled, the moment of their release is always animated because everything goes well, and the bird returns to its natural habitat. Here is a short video of the release of one ringed Shag. 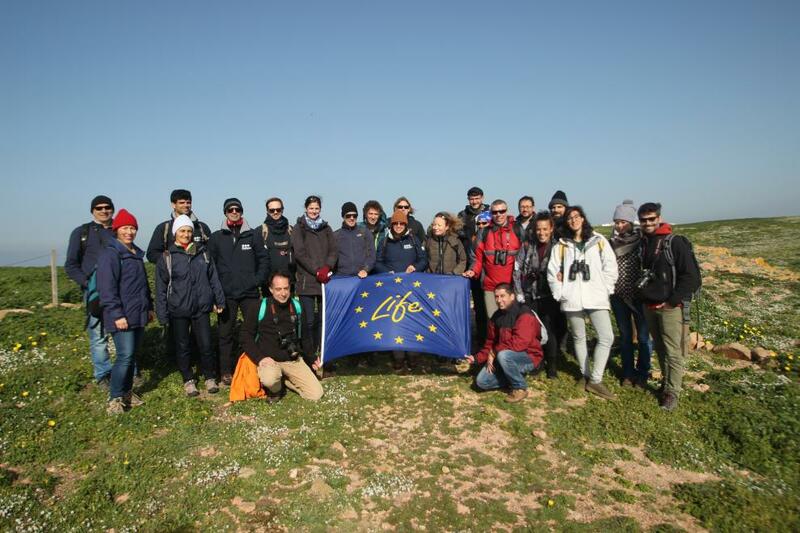 On April 26th and 27th, Life Berlengas Project, which is about to complete its third year of implementation, received a very important visit from the LIFE Unit, along with the external monitoring team. 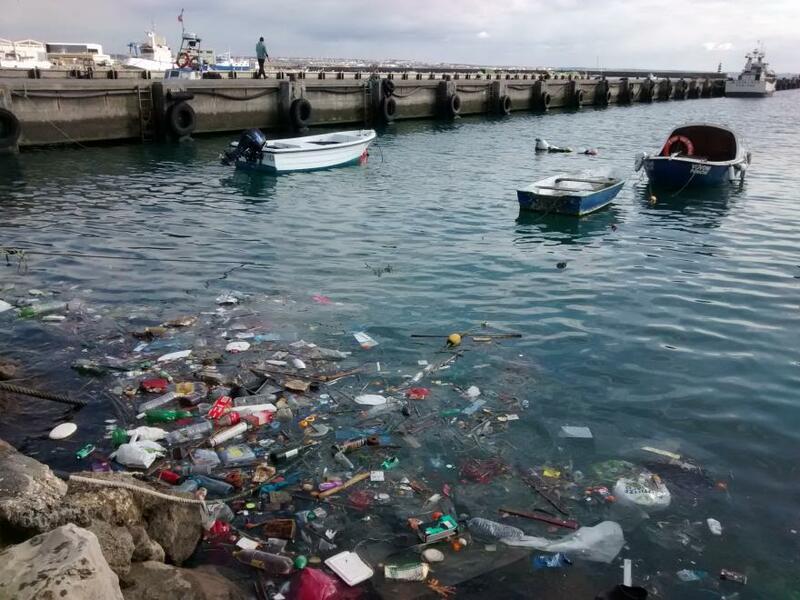 In the last couple of months, I have seen large amounts of litter in Peniche fishing port, mostly from fishing boats operating from this port. This litter stays during days floating in the water until, under the effect of the wind and the sea, it sinks or leaves the port, ending in the nearby beaches or floating in the ocean. In the fishing port we can find all kinds of litter (bottles, shoes, glasses, fishing gears, different plastics, papers, wood, cigarettes, etc) and this is just the visible material since there are also spills of bleach and detergents. All these marine debris contaminates our waters, causing the loss and death of fish, seabirds, corals and other living beings that inhabit these waters so productive in marine life. In our day-to-day work with the fishermen, we try to raise awareness and explain the problem of marine litter and the consequences it has on the marine environment. Many of them don't even realize the impact of this litter on the sea, because when they throw away something, they don't see it again, but it actually doesn't disappear, some of it stays in the bottom of the sea during decades, others during hundreds, and others like some plastics never disappear, breaking up into very small pieces -microplastics- that can be consumed by various marine animals that later are consumed by people. 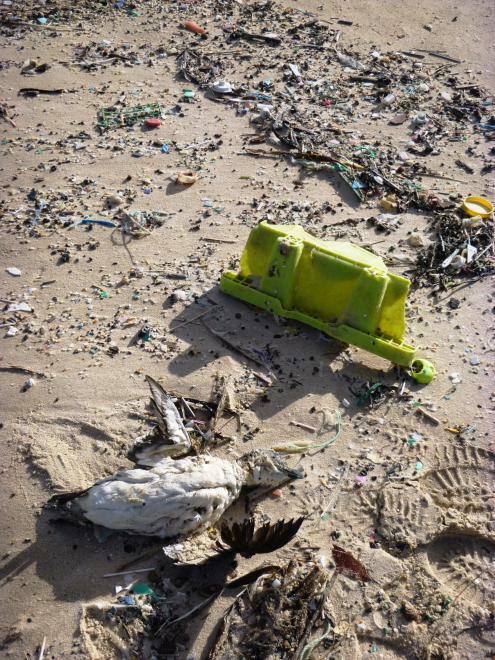 It´s our duty to reverse this situation and contribute for a cleaner sea! Nas Berlengas, os ovos foram postos a 12 de março e estiveram a ser incubados pelos progenitores, tendo as crias de galheta, a nossa Ave do Ano 2017, eclodido no sábado passado, dia 15 de abril e na terça-feira, dia 18 de abril! Nas Berlengas, os ovos foram postos a 12 de março e estiveram a ser incubados pelos progenitores, tendo as crias de galheta, a nossa Ave do Ano 2017, eclodido no sábado passado, dia 15 de abril e na terça-feira, dia 18 de abril! Estes são 2 dos 3 ovos postos no ninho que a nossa equipa do Life Berlengas está a seguir. Por volta das 11 horas de dia 15 passámos a ver a primeira cria e, a meia da tarde de dia 18 passamos a ver as duas crias em interação com o progenitor. Nos próximos dias será possível observar os progenitores a revezarem-se nas suas tarefas de cuidado "domésticas". Durante o dia, a alimentação, os cuidados de higiene e os curtos descansos são algumas das atividades que podemos assistir. As crias serão alimentada até junho, altura em que, habitualmente, os juvenis começam a abandonar os ninhos, ficando ainda dependentes dos pais e juntando-se em pequenos grupos no mar, não muito longe dos seus ninhos. A equipa do Life Berlengas disponibiliza, aqui, um vídeo das primeiras horas da primeira galheta da ilha da Berlenga e as reações dos recém-pais. Muito em breve e se tudo correr bem, podem ver as novas cria e os seus pais a prepararem-se para receberem mais um membro da família em: www.berlengas.eu/ninho-ao-vivo. The couple of European Shags, the Bird of the Year 2017, followed by the SPEA received the first two chicks. There is one more egg in the nest that shall hatch soon. The eggs were layed on March 12 and were being incubated by their parents, being that the first hatched last Saturday, April 15th and the second on Tuesday, 18th! These are 2 of the 3 eggs layed in the nest that our Life Berlengas team is monitoring. Around eleven o'clock on April 15, we saw the first chick, and at mid-afternoon on April 18 we saw the two chicks interacting with theirs parents. In the coming days, we will be able to observe parents in their daily care tasks. During the day, food, hygiene care and short breaks are some of the activities we can watch. The offspring will be fed until June, when juveniles usually begin to abandon the nests, remaining dependent on their parents but joining in small groups in the sea, not far from their nests. And, if all goes well, we'll be able to see the two chicks and their parents getting ready to welcome the remaining family member on: www.berlengas.eu/ninho-ao-vivo. As a fisheries observer I have other tasks besides going on board, and one of them is to interview fishermen. The questions are mainly about fishing areas, gear techical details and bycatch of birds, mammals and other marine organisms such as turtles. These questionnaires are focused on boats operating inside Berlengas SPA since this is our study area. With this information we want to know the most important areas for fisheries, which gears have more impact on marine organisms and identify vulnerabilities between different species and seasons. The fishers are generally very nice and willing to share precious information with us. Apparently the most dangerous gears for seabirds and marine mammals are longline and gillnets. Seabirds such as northern gannet, razorbill and great cormorant are more vulnerable to bycatch due to their feeding behavior. The close colaboration between biologists and fisheries professionals is essential for a common goal: marine ecosystem conservation. 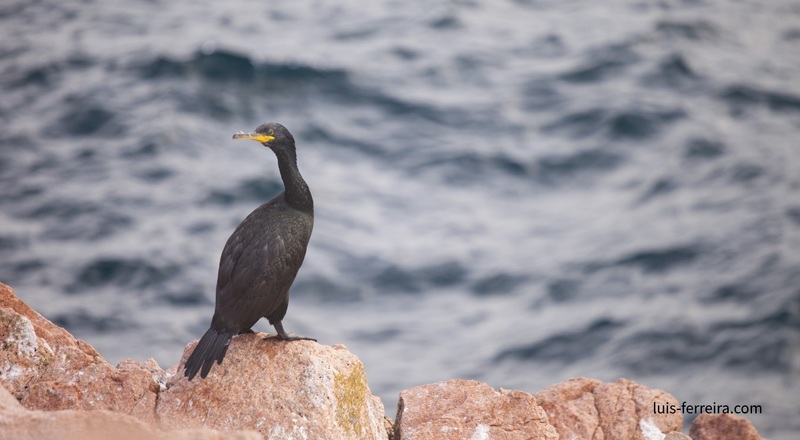 During April 12th and 13th Seabird census at sea (ESAS) took place in Berlengas SPA and once we were at the sea we sailed along the rocky shores to carry on the first visit of the National Census of European Shag Phalacrocorax aristotelis. The first day was extremely foggy and we were unable to carry on the European shag census and we couldn’t finished the first transect. During April 12th and 13th Seabird census at sea (ESAS) took place in Berlengas SPA and once we were at the sea we sailed along the rocky shores to carry on the first visit of the National Census of European Shag Phalacrocorax aristotelis. The first day was extremely foggy and we were unable to carry on the European shag census and we couldn’t finished the first transect. Despite the bad weather previsions, we left this work for the second day. The second day of census was foggy as well but not so much as the first day allowing us to make the European Shag census, finishing the first transect and doing all the second transect. It lasted 14 hours at the sea, initially in very foggy and cold conditions but during the middle of the afternoon sun made us a shy visit which helped us a little to deal with the cold wind. The migration to the breeding sites is still going on and we registered a lot of Sandwich terns, Northern gannets and Razorbills flying north. We also registered Cory’s shearwaters foraging and in rafts, Yellow-legged gulls and the biggest surprise was a Black tern foraging. The ESAS continue in May for two more days at sea, hoping for better weather in those days. We can all be a Berlenga’s seabird! During Easter break, LIFE Berlngas’s partner - Escola Superior de Tecnologia e Turismo do Mar (ESTM) dedicated a day to the children of the ones who work in the institution. It was a day full of activities in different areas. SPEA joined the initiative to show some of the natural values of Berlengas, which we were able to see from the window, so close. About 30 children from 3 to 14 years old participated in our activities. We watched a small movie about the biodiversity on the island and the work we are doing there to restore the natural values. In the end we transformed ourselves in seabirds by making some masks of the seabirds that breed in Berlenga’s island, the Cory’s shearwater, the Yellow-legged-gull and the European shag. It was an activity full of fun and the children loved the masks keeping the on during the day. Knowing that the children have fun while learning it’s the best feedback we can have. Fisheries observation in purse seiners is officially open! Since the first days of march that purse seiners are back to the ocean! The purse seiners are specialized in the fishing of pelagic fish schools. One of the symbols of Portugal is fished with this gear, the famous sardine, so this type of fishing is very important in our country. But as the fishing targeting the sardines is not open yet, fishers are now focused in other species such as chub mackerel, horse mackerel, atlantic bonito and others. This type of fishing is highly intense and the adrenalin levels are huge because the fishers try to catch a school of fishes in movement and the tiniest mistake may result in the loss of the school fish. Purse seiners are highly specific to fish small pelagic fishes which attract a lot of seabirds as this species are the ones seabirds usually prefer to feed on. From previous studies, seabird bycatch does not occur frequently in purse seiners but when it happens the numbers of seabirds are high. And that makes this monitoring even more important as the most vulnerable seabird to bycatch was the critically endangered Balearic shearwater. In our first trips in the purse seiners, we were very close to Berlengas’ archipelago and we have been registering many seabird interactions, mainly concerning iYellow-legged-gull and Cory’s shearwater, but with no risk of bycatch. Let’s see how the interactions change when they will start to fish mainly sardines as the fishers say that the numbers of seabirds interacting with the purse seiners are much higher than now. I did an internship in SPEA for six months between December 2015 and May 2016, working mainly for the Berlengas LIFE conservation project. I felt very comfortable with the SPEA team both at the office and in the field. At the office, I inserted and analysed the data from the fieldwork, producing digital maps using ArcGIS. At the island, we were working closely as a team not just for the several project tasks I had the chance to be more or less involved (removal of the invasive plant species Hottentot fig, mapping vegetation, monitoring other invasive species such as rats and rabbits, seabirds monitoring, construction of artificial nests for Cory’s shearwaters and ringing seagulls and Cory’s shearwaters, among others) but also for several other tasks such as cooking and eating together (delicious food!). I learned a lot from all the team and enjoyed especially the time shared together, ranging from interesting and funny talks in the kitchen to common silences walking along the island or looking together to the horizon. I even voluntarily decided to get over my fear of heights while removing Hottentot fig in the cliffs, thanks to the support of the whole team. We worked hard often in cold and windy conditions, however, I enjoyed that harsh environment as a reminder of how powerful and vivacious this island is. And, anyway, everyone who is motivated can deal with it, especially if can appreciate the uniqueness of the place, full of astonishing views and surprises. An unforgettable and magic experience which has changed the way I see islands, all of them. 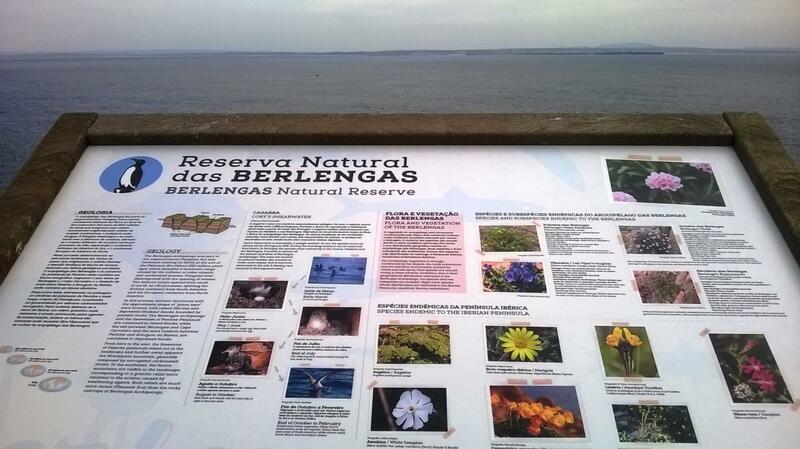 Since 17 March, the Berlenga Island has a new face with the new interpretive tables and the new signage created on the scope of LIFE Berlengas. By simply walking along the tracks, the visitors now have access to detailed information about the fauna, flora, geology, human occupation and archaeology of the archipelago. And all the information is in Portuguese and English. In addition, there is also another new! For those who want more information, you can go directly to the LIFE Berlengas website and all the information available here, using the QR code present on all the tables! RAM Census with Berlenga in sight! It was on the 1st of April that we restarted the RAM census in Cabo Carvoeiro (Peniche). It was a very nice restart with the prenuptial migration taking place: large numbers of Northern Gannets, flocks of Razorbills, Common Scoters and Sandwich Terns. While this species was flying north, European Shags were flying around us in the rocks below our point of observation. We also sighted some Cory’s Shearwaters flying south, possibly some of them are now starting the breeding period in Berlengas, leaving the island to feed. RAM (Portuguese acronym for Seabird and Marine Mammal Monitoring Network) Iberian census occurs usually on the first Saturday of each month in several different points of Portugal. 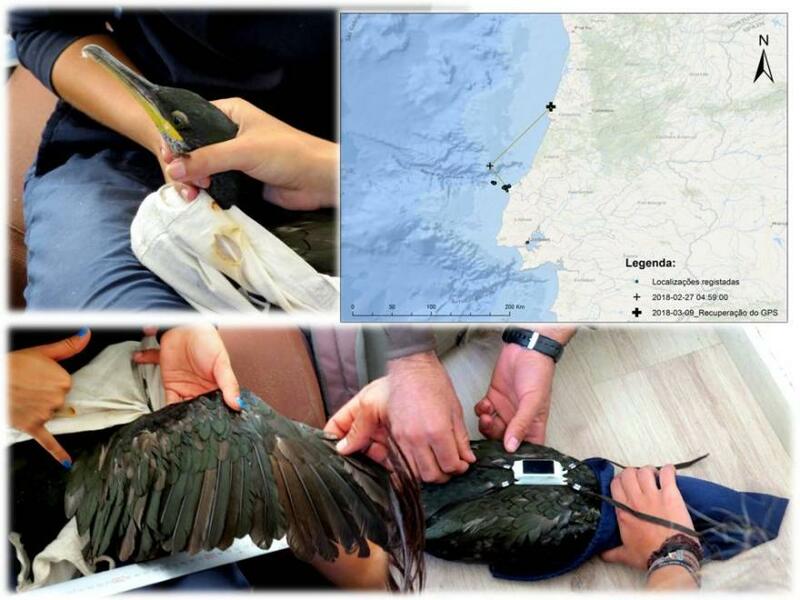 This methodology includes the counting of seabirds and characterization of their behavior. This data collection will allow us to understand the abundance, distribution, and behavior of seabirds throughout the year. If you want to get involved and help us count seabirds at Cabo Carvoeiro, just bring binoculars or telescope with you! 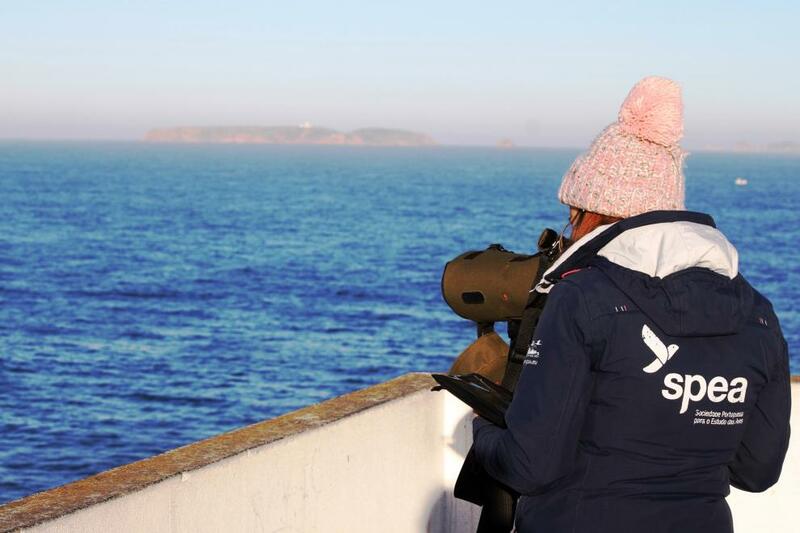 In the beginning of March we went out to sea to count seabirds in Berlengas SPA. After some hours we had a great list of species: yellow legged gull Larus michahellis, northern gannet Morus bassanus, Common scoter Melanitta nigra, great skua Stercorarius skua, razorbill Alca torda, Balearic shearwater Puffinus mauretanicus and Cory’s shearwater Calonectris diomedea. Cory’s shearwaters just started their breeding cycle and we had the opportunity to watch then near the archipelago. Berlengas Natural Reserve has many species of seabirds with vulnerable status. As we protect their habitat, we safeguard their survival. The contrast panels have been well received by fishermen, who call them different names such as “rags” or “flags”. After 10 trips on board of “Meu Regresso” it was possible to verify that the panels do not hinder or delay fisherman´s work. For us, this is an important result since we don´t want to interfere with fisheries dynamic. This video shows the hauling of the modified gillnets, with our mitigation measures attached. When low tide arrives it’s easy to see our “footprint” on the sea shores. Plastic and fisheries gear are still a big component of marine litter. 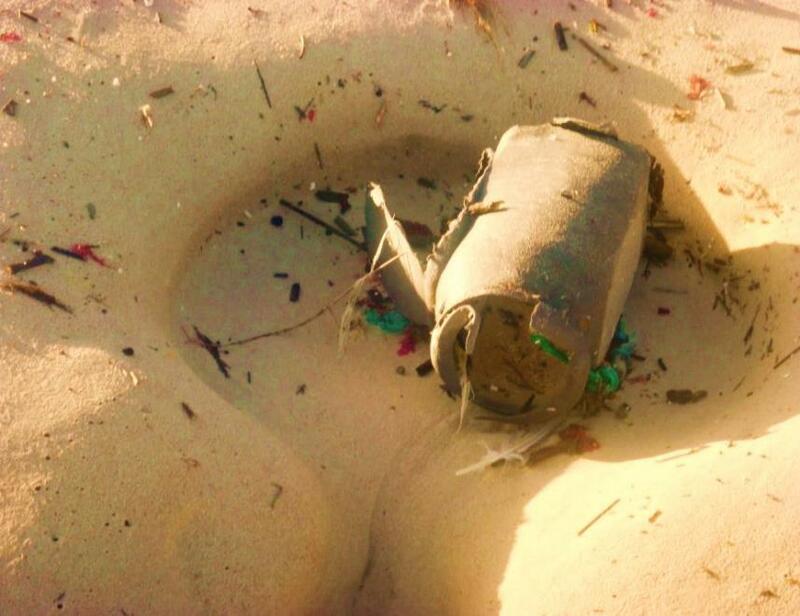 Traps are the gear more frequently found in the shore since they are light and disposable. It’s urgent to gain awareness of our impact. A lot of this litter causes the death of innumerous animals including seabirds that eat and/or get entangled. During this week we return to visit the students of the 5th grade classes of the D. Luis de Ataíde Basic School in Peniche. It was very gratifying to feel the sympathy and enthusiasm with which we were received again! The annual project developed by the Nature Sciences teachers, the Animal Project, has already started and this year they have joined the LIFE Berlengas, dedicating the theme to the fauna in the Berlengas Islands SPA. With different animals already assigned to each student, our visit served mainly to clarify some doubts and to help students in searching for reliable information, indicating various sources of consultation, such as books, magazines and web pages. It was very interesting to see how they were engaged in the research and many students are already developing the work, which made us very curious to see the final result of these works, which will be exhibited at the Fisherman's Day celebrations (May 31), and if everything goes for the best it will be available to anyone who wants to visit the exhibition. As it could not be otherwise and because we also love games, we ended with a knowledge consolidation quiz related to the first presentation session of LIFE Berlengas in November. The quizz proved that these ‘sponges’ are attentive and interested in absorbing the knowledge that is passed and do not let them escape because the answers were on the tip of the tongue. The development of this type of project by the schools is extremely important, since, in addition to being fun and challenging for the students, it also becomes easier to learn. In this way, it is possible to awaken a responsibility and environmental awareness very important for the future. In the next period we meet again and hope to have fantastic works waiting for us. We wish good luck and enthusiasm to these students! 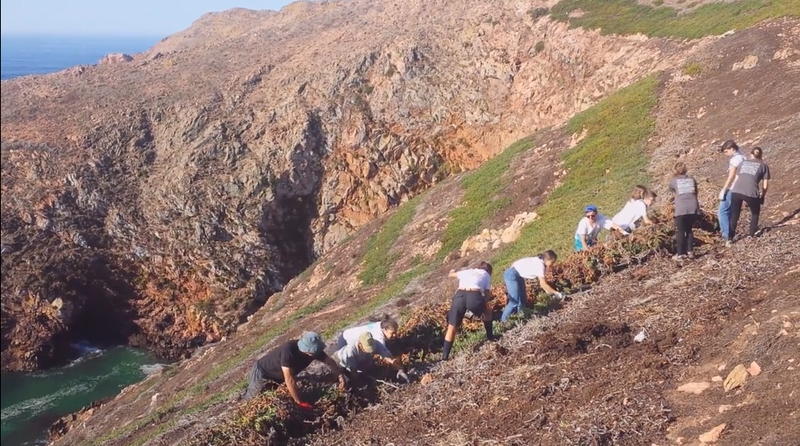 One of the actions foreseen on the Life Berlengas project is the removal of the Hottentot Fig. This species is one of the 100 worst invasive species in the world and it was introduced in the Berlengas in the 1950s. 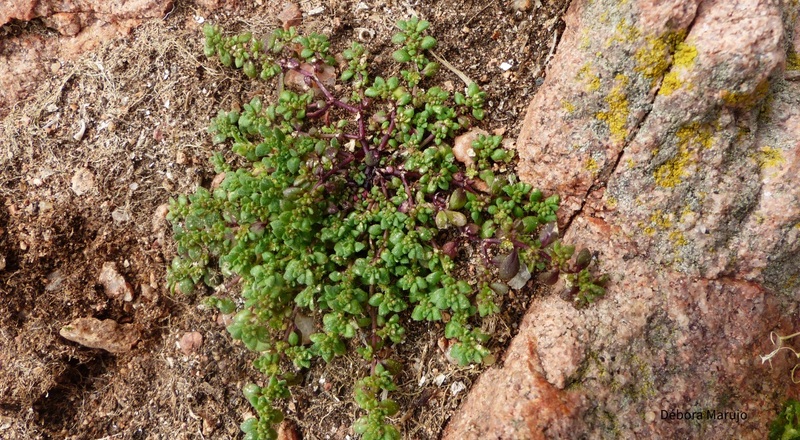 This plant, originally from South Africa, was introduced in Berlenga to contain the movement of the deposits resulting from the construction of the restaurant. However, the impressive propagation capacity led the Hottentot Fig to quickly colonise other slopes of the island. With its very dense leaves and strong roots, the Hottentot Fig is an important threat to the conservation of native plants, especially of the three endemic species (Berlengas Thrift, Berlengas Rupturewort, and Berlengas Fleabane). The Hottentot Fig also poses a threat to seabirds, as the dense carpet it forms reduces the number of cavities available for nesting. When Life Berlengas began in June 2014, the Hottentot Fig in Berlenga occupied a total area of 38533 m2. Since then, SPEA in collaboration with its partners and numerous volunteers has been removing it from the island. After 2 and half years of work, we already removed around 15000 m2, which represent about 40% of the total area of the island. This is equivalent to one and a half football fields. 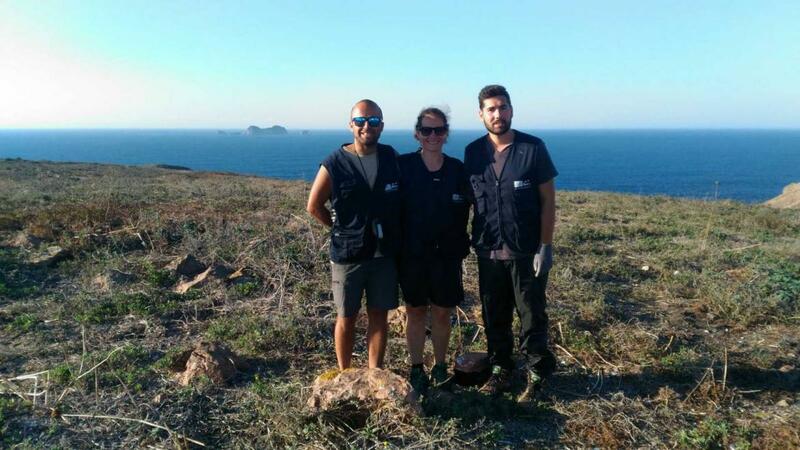 We are very thankful to the Berlengas Nature Reserve wardens and to all the volunteers for all the effort done in the removal of this invasive alien species. Thank you all! I decided to volunteer on the Island of Berlenga for SPEA as a practical for my Master’s program. I was informed prior to of the work that was conducted on the island but, I had never worked on a conservation project so I was in for a treat. The island is like nothing I have ever seen. Riding towards it on the boat I was in complete awe of the beautiful greenery, the etched out ledges, the colors of the rock, and the birds flying overhead. The island felt so vast and the weather was perfect even though it was December. As a Floridian I had quite the work out walking up and down the hills and edges of the island. The accommodations provided are in the old village near the lighthouse and it was cozy and warm. The rangers cooked for us primarily and it was always creative but, delicious foods and very necessary as the work on the island requires quite a bit of energy. In the mornings we would rip and roll the hottentot fig and the afternoons were for bird surveying as well as surveying for rodents, both of which are very interesting. We also set up artificial nests in the afternoons. In our spare time we were free to do as we pleased and one afternoon we received a tour of the lighthouse which was exciting. The views during all hours of the day were gorgeous and the hard work was worth the education and being outside breathing in the very fresh, salty air. Overall, the experience was a challenge in some aspects but, worth every moment. I would strongly recommend this volunteering opportunity to everyone especially if you are an avid bird watcher. My visit to Portugal and Berlengas occured from November 2016 till January 2017 under Erasmus + traineeship programme. As always in life, the most amazing experiences are hard to describe with words, but I'm gonna try. From the first misty sight on Berlengas, between big waves I knew this archipelago is something special. After getting off the boat first I noticed a calmness and ease which I could feel all around and also in the people I met. At that time of the year the island is inhabited by only a few scientists, volunteers, the two rangers and lighthouse keepers. Although not so distant from the mainland, Berlengas offers all the charm of the island's tranquility and isolation. The house where we stayed, despite its simplicity and modesty completely satisfied our needs. One of the things I learned by living in it was that we can live happily even without everyday luxury, on which we are dependent. I must stress that the meals were rather luxury than modest. I never thought about myself to be a “people person“, but the company of these beautiful people tore down all my walls and I truly connect with them. I enjoyed the specificities of each of them and I can say that I have experienced true diversity of character, but again I noticed how similar we all are. All the field work we have done together and jointly, with no task too hard to handle. We all shared great appreciation for the amazing nature which we were part of. I find Berlengas archipelago as a true treasure worth of conservation and I'm very grateful that I was part of it. February, a month with a strong personality! The first half of February was characterized by extremely rough seas demanding the maximum respect of the ones depending on it to work. Therefore, most of the boats stayed at the harbor during this time. Once these hard days passed, the calmer seas allowed the fishermen to go out again and of course we had to join them. We continue the seabird bycatch monitoring in fishing gears. But we have some news! 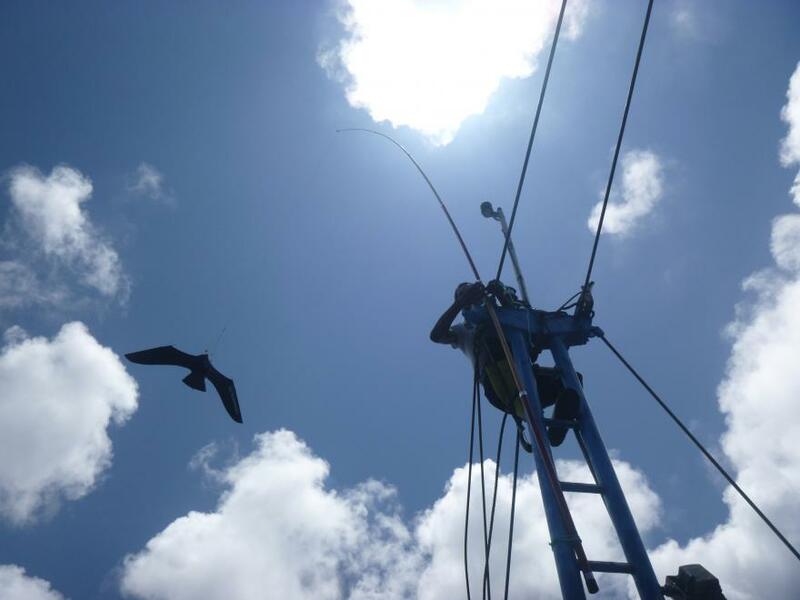 We were able to attach the high-contrast panels to scare away the seabirds from gillnets. During two days, the panels were attached in the gillnets of a new boat while the fishermen were fishing. Attaching the panels on the boat and while they were working was a crazy and difficult decision but everything went well. And after some fishing trips, the panels are still attached and everything is going fine. The panels don’t make the fishing activities harder for the fishermen which is very important. During the next months we will continue testing these mitigation measures and soon we will have some more news. And the Bird of the Year 2017 is ... the Shag! With this campaign SPEA wants you to discover more about this seabird, easily identified by its dark plumage with greenish reflections, its green eyes, and its long neck and beak. The main breeding colony in Portugal is located at Berlengas archipelago, with a population estimated at 75 couples. UNfortunately the population trend shows a slight decrease in the short and long term (data from 2015). The breeding period runs from January to July. Between February and April the eggs, up to 6, are laid and the incubation is carried out by both parents for up to 33 days. After 2 months, the chicks begin to leave the nests, although they are still dependent on the parents. They frequently join in small groups in the sea, not far from their nests. Their feathers are permeable to water, leaving the birds wet to their skin after the fishing dives. Therefore, to warm and dry, it is common to see them in the sun, with the wings open for long periods of time. Learn more about this species here. 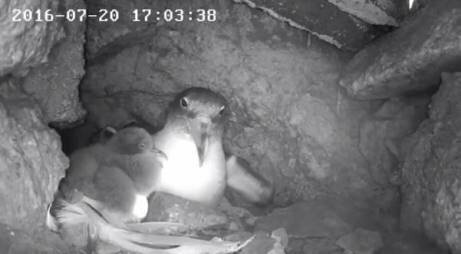 If you are curious about this species, now you can follow the daily life of a couple and their future chicks, live from the island of Berlenga, through a web stream camera installed near one of the nests. Look here. 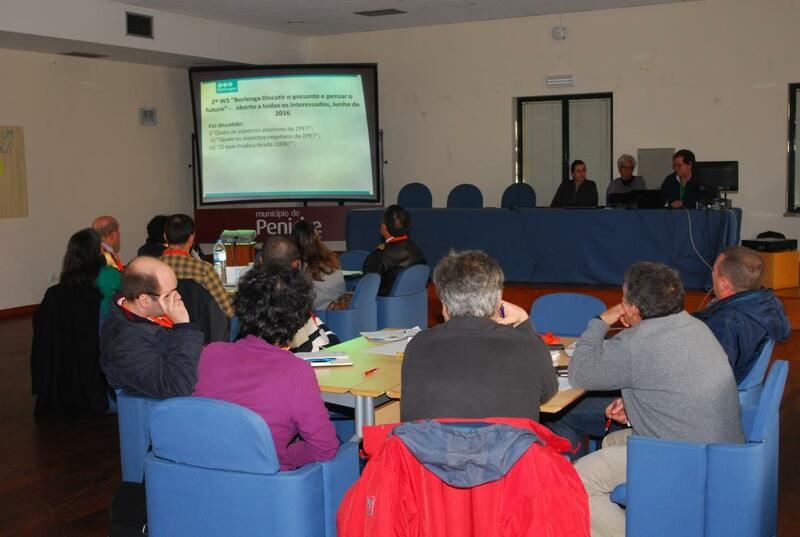 Workshop "Management of SPA Berlengas Islands: Planning, Implementing, Accomplish"
On the 26th of January, a Workshop on the Management Plan for the SPA of the Berlengas Islands was held in Peniche. The event was attended by numerous stakeholders from the region to discuss the actions proposed in the Plan, identify their level of priority and challenges to their implementation. The objective is to update the document prepared in 2011 (Basis for the management plan) through a participatory model that will contribute to the future adoption of the Management Plan. SPEA was present at this event that was organized under the Life Berlengas and presented some of the results achieved so far in the various actions of the Project. After the first preliminary tests with contrasting panels in May last year, since the autumn everything is ready to implement this mitigation measure in gillnets of a cloth. In October we put these panels in the nets of a fishing boat, but we had to wait until the end of November so that these modified nets could finally be used, because the high temperatures and clearness of the water resulting from the lack of rainfall made it unfavorable to use this Fishing gear that requires more turbulent and turbid water to make the net "invisible". The first shipments went well and there were no major differences in catches of fish between control and panel nets. There was no accidental capture of seabirds on these shipments. In the early days of the year, the sea state was very agitated and the control and modified nets had to be removed from the boat for repair, as some of them were broken and many of the panels were released. Due to the few panels that remained in the nets and the impossibility of putting new panels, we had to leave the evaluation in this boat. At the same time, we began to implement this measure on another fishing vessel, which had not yet started using gillnets because of unfavorable conditions already mentioned. In a hunt with 40 nets in total, 122 panels were placed in 20 nets to have a control with the same dimension. The panels were fastened in the center of the net every 6 meters with a stronger nylon thread than the one used previously, since one of the main problems for the panels to be released in the other boat was precisely the material used. The fishermen accepted the challenge with all good will and even assisted us in putting up the panels. The collaboration of vessels is essential if we are to have reliable results and the possibility of implementing measures that may indeed make a difference. The nets with the panels were in the water and again, the loss of some panels was noticed. It is important to continue to test the different materials to attach these panels to the nets to find one that resists sea busting. Soon the panels will go permanently to the water but before that the warm weather and the little rain of this atypical winter has to change. However, we continue to monitor seabirds on each shipment by increasing knowledge of their diversity, abundance and feeding areas. These tests of mitigation measures are carried out in Portugal for the first time and hopefully they will contribute to a new stage in the conservation of seabirds! When winter arrives some seabirds don’t resist due to very hard weather conditions. Besides hard weather, fisheries gear, abandoned or active, remains a big cause of mortality of seabirds. 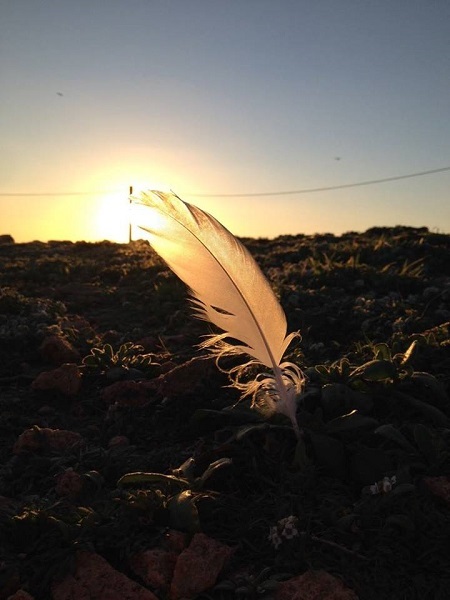 In January, we conducted beached bird surveys in Baleal-Peniche area after some very cold days with strong winds. In total, we found 8 dead seabirds: 2 yellow-legged gulls Larus michahellis, 2 northern gannets Morus bassanus, 1 lesser black-backed gull Larus fuscus, 1 common Scoter Melanitta nigra, 1 razorbill Alca torda and 1 great cormorant Phalacrocorax carbo. The cormorant had a ring and showed some traces of blood in the beak indicating an eventual entanglement in a hook. It is very important to report this information to better understand seabird´s threats, migratory routes and longevity. The common octopus (Octopus vulgaris) is a very appreciated species in Portuguese gastronomy being its price highly valued. Besides its commercial interest, there is also a biological interest given their complexity. The common octopus (Octopus vulgaris) is a very appreciated species in Portuguese gastronomy being its price highly valued. Besides its commercial interest, there is also a biological interest given their complexity. In the boat where I´m going on board dozens of octopus are caught every day. 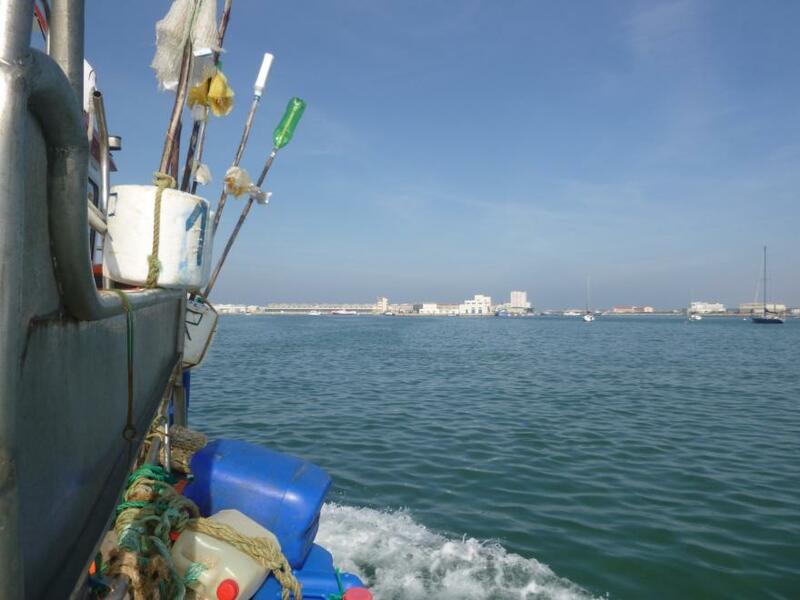 With the good good weather that we had recently in Peniche, set nets don´t work very well since the water is very clear and the fishes can spot the nets. Alternatively fisherman are using other gears such as traps for octopus. Before setting them in the water, the traps are baited with fish remains, usually horse mackerel or chub mackerel. When the octopus eat the bait the trap is closed and they get caught. Usually, traps are hauled a few hours after being set at night. Part of my job as observer is counting and identifying seabirds. Gulls, and in particular the yellow-legged gull (Larus michahellis), are always present in in my list. They are always there, waiting for an easy meal. Gulls are birds with high capacity of adaption and reproduction, few predators and generalist diet. The high food availability from landfills and fishing ports has contributed for the drastic increase of the population. This “superpopulation” of gulls in Peniche has been a problem for the other animal and vegetal species and even promotes conflicts with humans. One of the actions from “Life Berlengas” project is to test new methods of yellow-legged gull population control, trying to return the balance to Berlengas archipelago ecosystem. We can also contribute being more aware and conscious in the managing of our resources. Marine census with the new application! Marine census with new application! from SPEA on Vimeo. In the 12th and 13th of December we were back onboard for two days of marine census using ESAS (European Seabirds at Sea) methodology in Ilhas Berlengas SPA. This time we left the paper at home and we successfully tested the new data application. 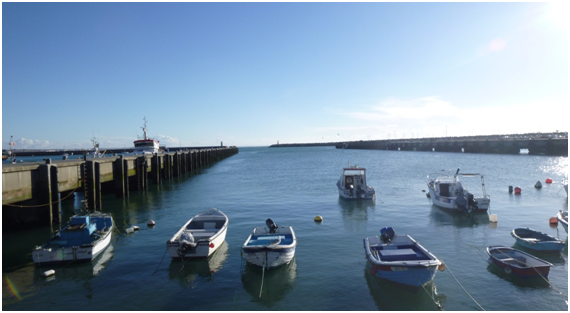 Like in the census in November, we had an amazing first day, the sun was shining and the sea was calm. During the second day the wind was blowing stronger, no sun and the sea was a bit rough which even made us leave the observation point due to the waves that left us completely wet. We registered about nine different seabird species and the northern gannet completely “dominate” the census. In January will get back onboard for two more days of census covering the entire ZPE. Berlenga's oldest seagull is over 20 years old! 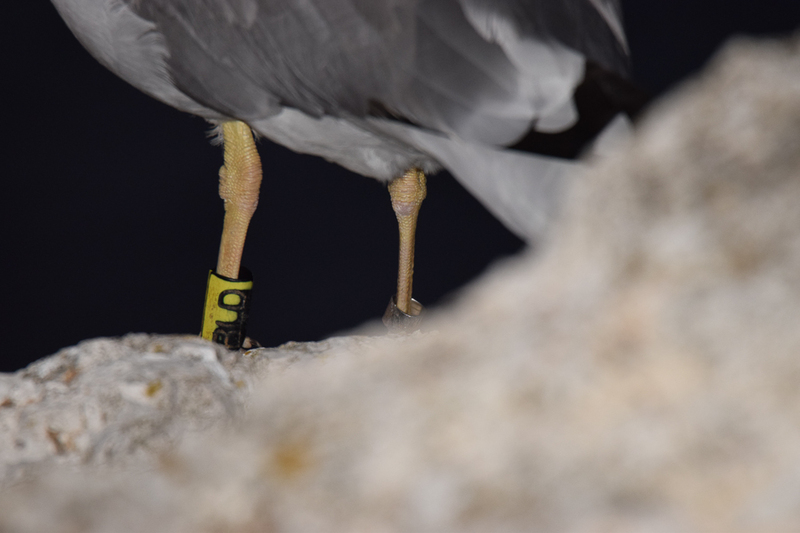 Ringed in August of 1996, this bird was recently observed in Sesimbra and by its colored ring with the letters BLD it is concluded that it is already twenty years and four months, being thus the oldest Seagull born in this Natural Reserve. It should be noted that this is not only the oldest seagull in Berlenga but also the seagull with the longest life reported to the Euring (European Ringing Center). The marking of birds with rings allows us to identify each individual throughout his life and allows us to know his habits and his age. Seagulls can live for more than 30 years. 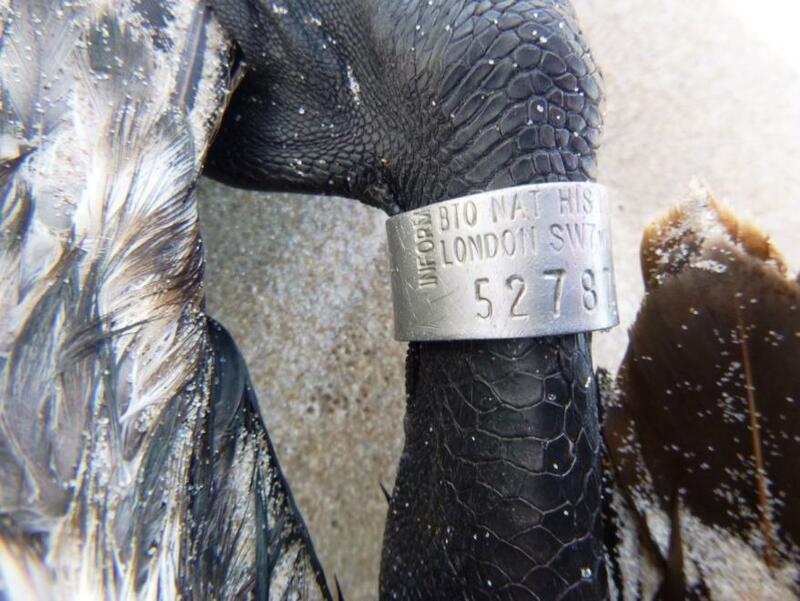 In wild birds, metal rings with a single code are usually used, and this record is sent to the national ringing center binder that coordinates these data. Sometimes, as in the case of the BLD gull, colored plastic rings are used, which allows the "reading" of the number from a distance, without being necessary to disturb the bird. Under the LIFE Berlengas project (www.berlengas.eu), dozens of seagulls in the Berlengas are being marked with colored rings (three black letters in a yellow ring). By sending the observations of these animals it is possible to know their movements and feeding places, which allows to manage their populations and possible threats. This project intends to know where they feed, so that adequate measures can be taken to avoid imbalances of the population. If you observe some of these birds send the observation to nuno.oliveira@spea.pt or to cempa@icnf.pt. The rain is needed…also in fisheries! With the high temperatures and dry weather that were felt until the end of November, many fishermen continue with 'summer fishing gear' waiting for the first rains to come to stir the water. During the summer and fall, I went out on a boat that has as target species john dory and hake. John dory is caught with trammel nets and hake with gillnets. The nets are set during the night and hauled during the day, with the trammel nets being set first, followed by gillnets. The hauling of the trammel nets began at dawn, and I expected to find quite a few more birds than the ones I registered,0 since it would be a period of seabird greater activity. However, most seabirds were recorded during the hauling of gillnets, which occurred during the afternoon. In fact, gillnets, whose target species is hake, catch large quantities of horse mackerel and chub mackerel which attract more birds to the boat. 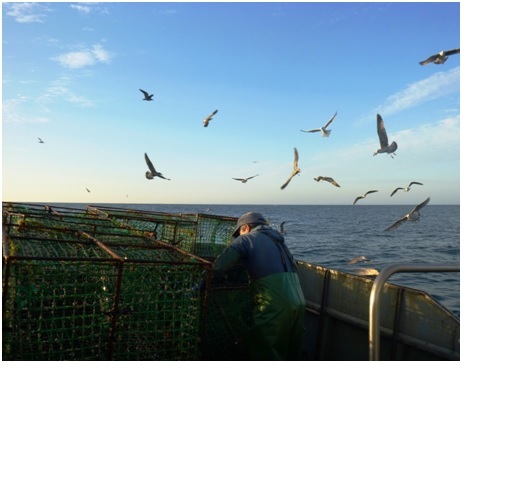 I didn´t make that many trips to get a solid conclusion, being the sample too small but it was interesting to realize the influence of the fishing gears and target species in seabird interactions with fishing boats. Now winter is coming and the gear switch to trammel nets for flat fish are expected in this boat…many adventures are still to come with the opportunity to go onboard in a new smaller boat! 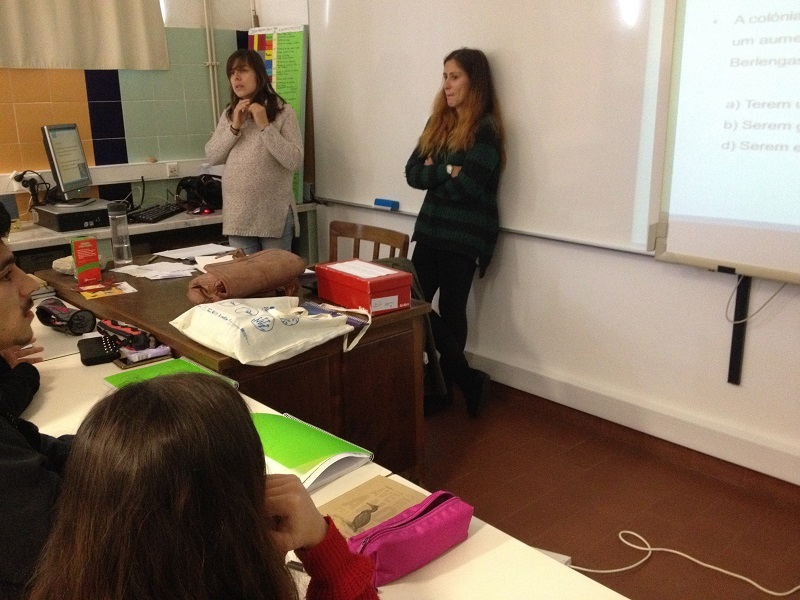 Peniche is celebrating November as the month dedicated to the sea, so in the 23rd we went to the shool - Escola Básica 2,3 D. Luis Ataíde, to talk about the Life Berlengas project to about 80 students with around 10 years old. They were a very energetic and curious group of children. This first session was very important for them because this year’s theme for their annual project, Animal Project, is about animals that inhabit in Berlengas SPA. First, we did a presentation about the general objectives of the project, talked about the target species and the work we have been doing in Berlengas. For some of the students we were no strangers, most of them still remembered the names of the species we talked last year and they were very interested in learning more and more. To finish we did a game to raise awareness about fishing gears and seabird bycatch. This was the student´s favourite part since they could run and have some fun. This kind of activities is essential to motivate young people to respect and preserve all living beings and the habitats they depend on. 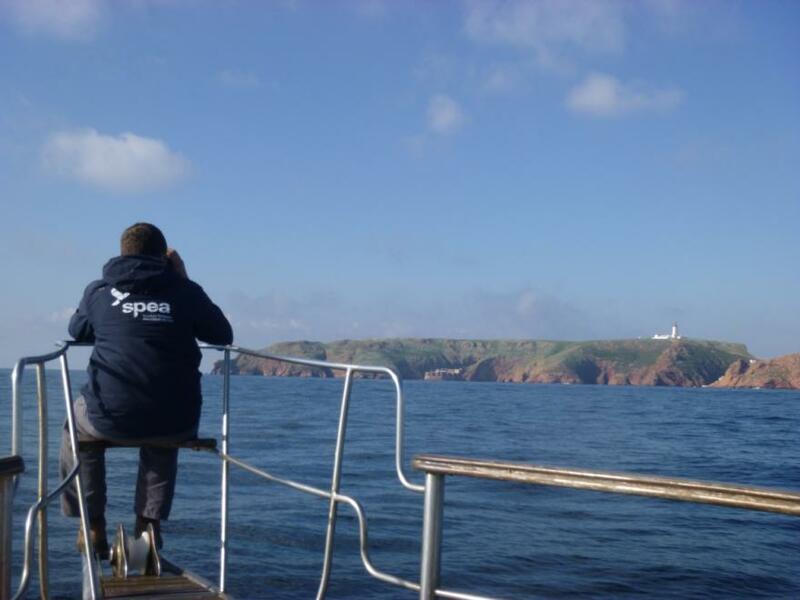 On the 28th of November, seabird counts were conducted at Berlengas Islands SPA (Special Protection Area) using ESAS methodology (European Seabirds At Sea). We navigated since 8:00 a.m until 5:00 p.m. It was a sunny day with calm sea which helped the observations. It was possible to see species such as razorbil (Alca torda), Balearic shearwater (Puffinus mauretanicus), Manx-shearwater (Puffinus puffinus) and great skua (Stercorarius skua). Also, we had a group of common-dolphins (Delphinus delphinus) following us during big part of the way. This monitoring is very important since it allows the production of distribution and abundance maps and probability of occurrence of seabirds. 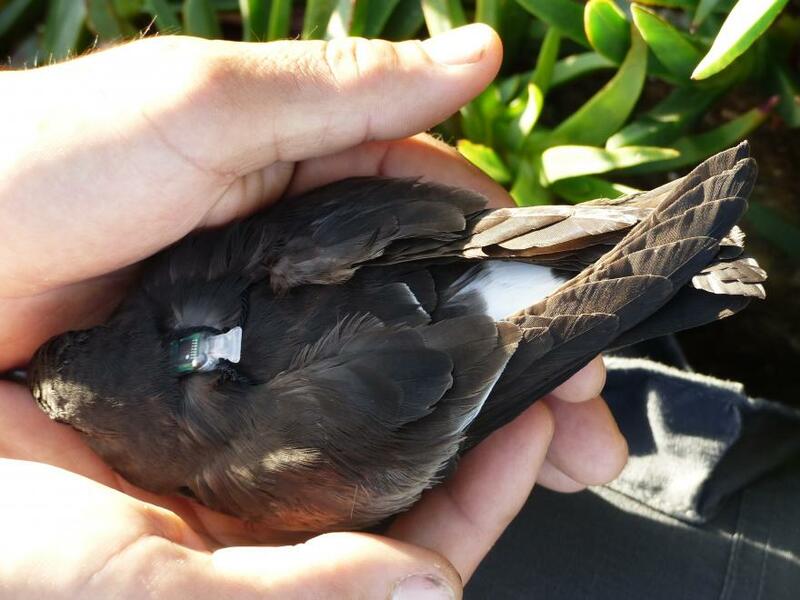 If there are any animal species that can symbolise the Portuguese territory and the connection of the Portuguese to the sea, it may well be the Band-rumped Storm-petrel. 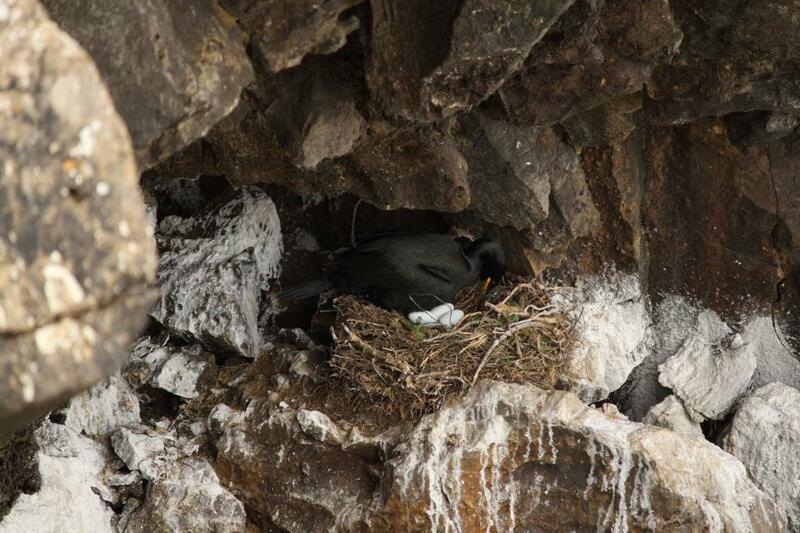 It is one of the few seabirds that naturally nests throughout our territory, including the islands. Being the only bird that nests in the fall and winter, it is approximately from the 16th of November, Sea Day, that you can usually watch the birth of the first calves. In Continental Portugal, the small Band-rumped Storm-petrel nests only in the Berlengas archipelago, more precisely in the Farilhões. Although there have been a number of attempts to occupy the main island of Berlenga over the last few years, the presence of introduced predators such as the black mouse has made it impossible to establish itself. At only 20 cm in length, being even smaller than a blackbird, it manages to make incredible trips. 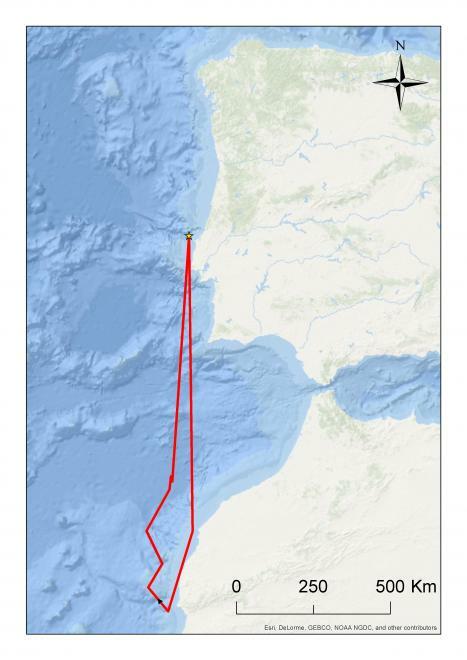 One of the best examples we have is that of an adult individual, marked with a small tracking device, who made a round trip between Farilhão Grande and the coast of Morocco in just 5 days. 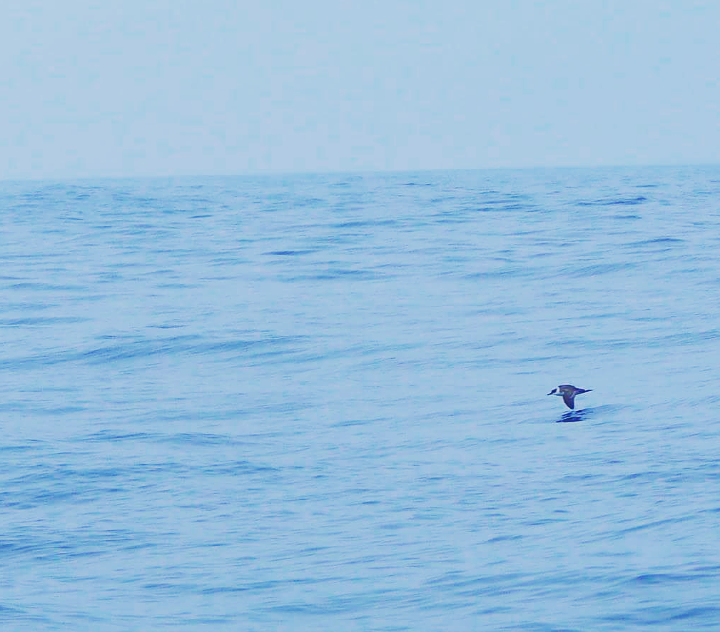 Coincidentally or not, this bird was marked in full Sea Day, on November 16, 2011, by the team of the Portuguese Society for the Study of Birds (SPEA). Like the shearwaters, also the Band-rumped Storm-petrel comes to earth only to nest, spending most of its life on the high seas. At present, it only nests on islands where no terrestrial mammals have been introduced, namely rats, cats and ferrets. And so, its distribution is reduced to small islanders or uninhabited islands. For all these reasons, we consider the Band-rumped Storm-petrel the right symbol for the celebration of the Sea Day, since the state of its populations is indicative of the "health" of the marine ecosystems and our sea. Band-rumped Storm-petrel is one of the target species of Life Berlengas, a project coordinated by SPEA, in partnership with the Institute for Conservation of Nature and Forests (ICNF), Peniche City Hall, Faculty of Social Sciences and Humanities Of the New University of Lisbon, and ESTM of the Polytechnic Institute of Leiria as observer. The project, which started on June 1, 2014, will be implemented by September 30, 2018, and has a total budgeted investment of about 1.4 million euros with the co - financing of the LIFE + Program of the European Union and Biodiversity Fund. Autumn is here and the wintering birds begin to arrive to Portugal. As planned for this time of the year, we started to implement mitigation measures in the gillnets to avoid seabirds bycatch, namely of Common guillemot and Razorbill that spend the autumn and winter in Portugal. In October, we deployed high-contrast panels on the gillnets of Olimpico´s boat and in the next weeks we will attach these panels in other 3 boats operating in Ilhas Berlengas SPA. This boat hasn’t started yet using the modified nets in the sea since they are waiting for the most appropriate conditions of sea state for this kind of fishing gear. Meanwhile, we continue to monitor seabird interactions with fishing boats and to collect information of fish catches abord. In one of my recent trips, I was able to watch up to 10 different species of gulls interacting with the fishing boat during fishing events, which really highlights the importance of this SPA for seabirds. Let us hope that these measures will help conserve seabird biodiversity in Portuguese waters! Live to the world, departure to the sea! 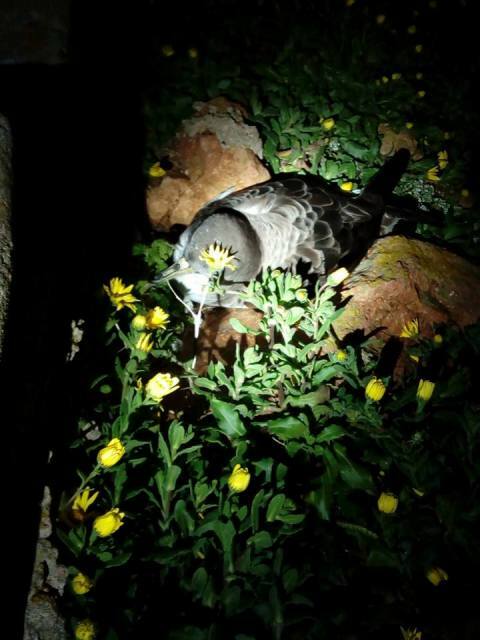 After a little more than 3 months of growing in the nest, the shearwater that we were able to follow live from the island of Berlenga, since its birth on July 19, finally abandoned the nest on the night of October 25. During this period, the small shearwater and its parents were accompanied by about 17 thousand spectators from 97 countries, who marvelled and discovered the secretive habits of this species of seabird. Having completed its growth, it has become able to fly and will join other young shearwaters at sea and head to the southern hemisphere, thus initiating their first migration. And it is at sea that she will spend the next 6 to 9 years of life until she becomes a reproducer, at which point she will return to the place where she was born and then arrange a pair and nest for the first time. We are waiting for the return of the shearwaters to Berlenga next spring so that we can once again follow the daily lives of a couple in the nest. But the good news does not stop here, since in early 2017, before the arrival of the shearwaters, we will put the camera online to monitor a nest of European shags in the island of Berlenga and thus accompany the reproduction of another of the emblematic species of Berlengas. 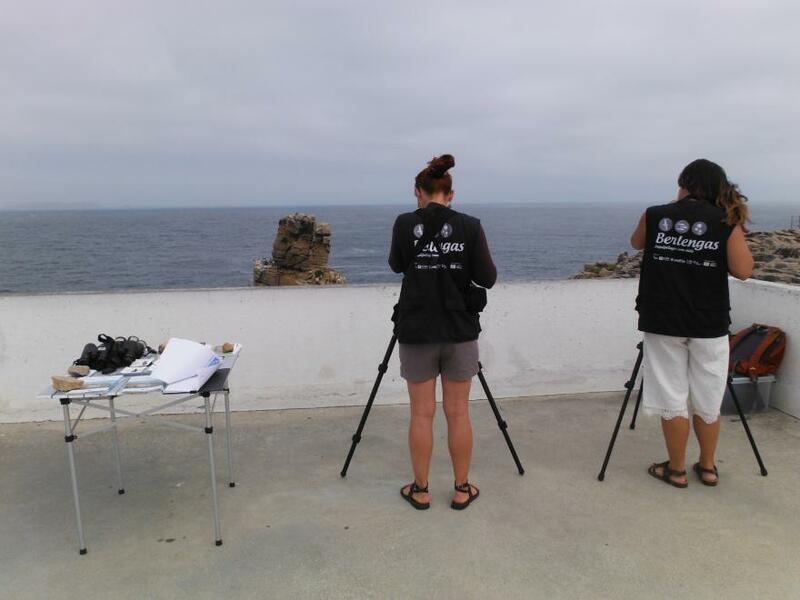 Last week the team of LIFE Berlengas visited the Farilhões to monitor the Band-rumped Storm-petrel colony. This visit allowed the marking of 10 individuals with small remote tracking devices, GLS. See here the landing of the team at the Farilhão Grande (Berlengas archipelago). Since September, I started working as a fisheries observer at SPEA and I am having such a wonderful experience. 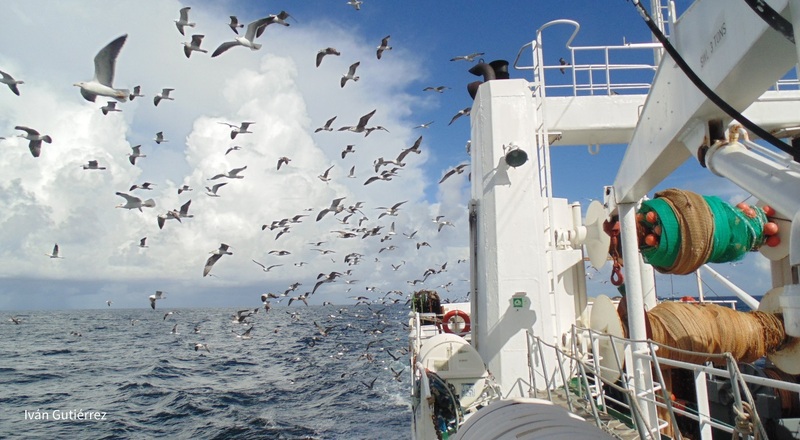 My job on board is to assess seabird bycatch, to evaluate fishing events and to monitor seabirds. I always had an interest in the bycatch theme and I feel very proud to be part of this team. The fishing crew of “Meu Regresso” is made of calm, nice and hard working man. When going on the boat, I can see how challenging their life is. They are always dependent on the state of sea and on its recourses. In such a short period, I already learnt a lot about fish and crustacean species and about the dynamics of the different fishing gear such as traps, gillnet and trammel nets. However, the biggest highlights for me are the animal observations. I already added a new species of seabirds to my personal list, the European Storm-petrel (Hydrobates pelagicus). 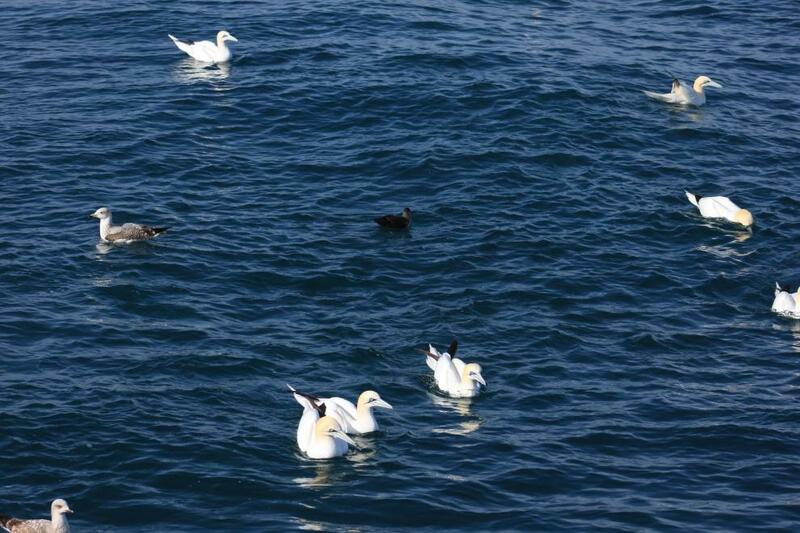 I saw big groups of northern gannets (Morus bassanus), and even a jumping sunfish (Mola mola). I was surprised with a group of dolphins (Tursiops truncatus) very close to the boat and contemplated a shinning and golden sunrise close to Berlenga island. For all of this, it’s easy to wake up at 2 am in the morning and I have to say: I wouldn´t change my office for nothing! 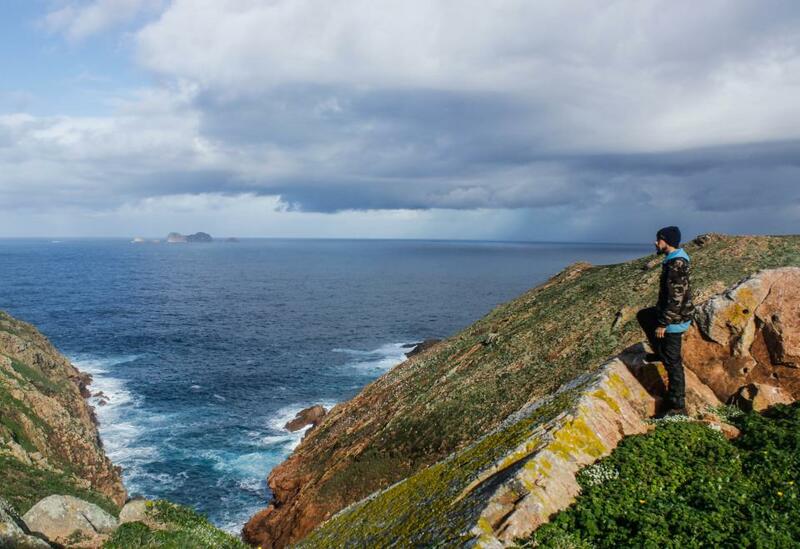 From the misty islands to the "living archipelago"
More than 1500 kilometres of ocean crossed by the elements of the SPEA Azores to reach the archipelago of Berlengas. Among Cagarros (in good Azorean) Calonectris borealis and Band-rumped Storm-petrel Hydrobates castro that chanted all night the team felt at home. Were we not well acquainted with these seabirds, and with life on the islands. An unforgettable week where we collaborate in the removal of introduced mammals, we know and share experiences with the LiFE Berlengas team and where the presence of the Phalacrocorax aristotelis European shag was common. On the return, the good moments spent between the seabirds are remembered, but above all the gratification for having collaborated in the excellent work that is being done there to recover this archipelago with life and restore its status as a sanctuary for seabirds, Where fluttering flights of farewell from Nothern gannets Morus bassanus, European shags, Cory's shearwater and Balearic shearwaters Puffinus mauretanicus opened smiles on these inhabitants of the misty islands. With the approach of the season of a greater abundance of wintering birds in the Berlengas Islands SPA, it is necessary to intensify the bycatch monitoring effort on a board of commercial fishing vessels. 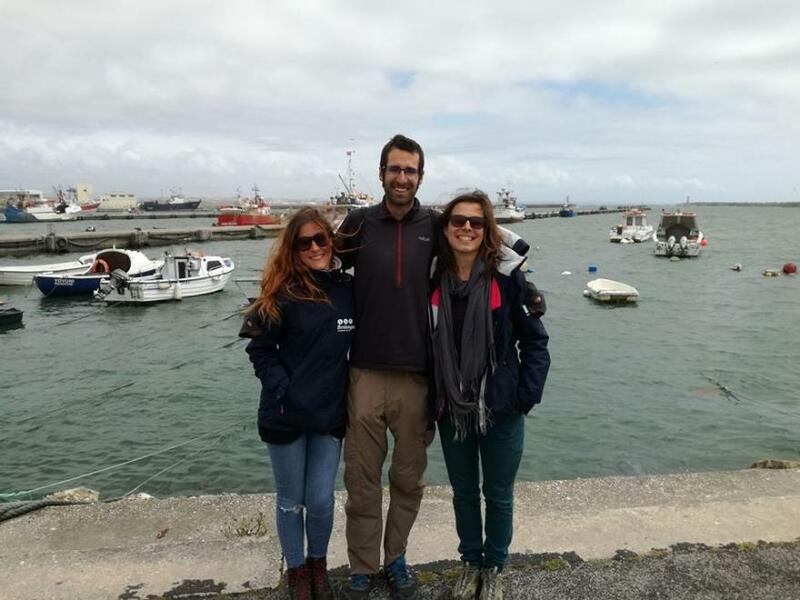 To this end, two new fisheries observers have recently joined the team: André Ferreira and Elisabete Silva. They have already had their baptism on a board of the "Mãe Purissima" and "My return". Welcome to the team and wishes of good winds and sea tides! If I have to describe my experience at Berlenga in one word I would say "spectacular". It was a very important period for me since I was able to have my first contact with seabirds. The Berlengas shearwaters became the protagonists of my master's thesis and I had the opportunity to learn a lot about these incredible animals. In addition to working with the shearwaters, my internship at SPEA went well from the beginning, the whole team made me feel part of it and my adaptation was quick. I also had the opportunity to collaborate in the control of the white-bellied seedeater and monitoring of rats and rabbits - important conservation tasks that SPEA is developing in this project, for the improvement of the Berlengas archipelago - very good work and always with a smile!! Thank you also for all the good times with the volunteers and the staff of the island. I hope I have the opportunity to return!!! 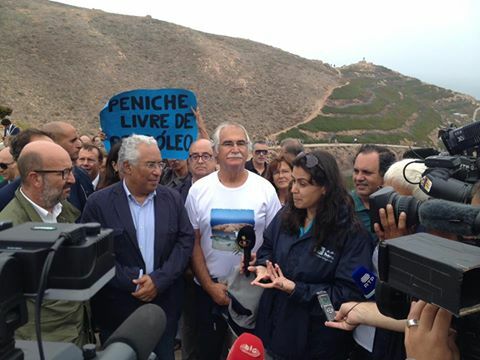 Today Berlengas Island was visited by Prime Minister António Costa, Environment Minister João Pedro Matos Fernandes and more people related to the environment and nature conservation in Portugal. This visit took place in the framework of the signing of the Cooperation Agreement of the Network National Biosphere Reserve of UNESCO, where it was used to show what has been done in the intervention zone of the project Life Berlengas. Last June, while montoring seabird bycatch onboard a commercial vessel, I saw a group of yellow legged gulls following the boat. One of them had a colored ring on the leg and when landed on the boat fora rest, I managed to read the ring code. I sent the data to the coordinating organization for European bird ringing (EURING) and a few weeks later they replied with the information about the bird. I was a gull ringed in Berlengas Island in 1997! This was the first time that this particular bird was resighted since it was ringed, 19 years ago! If you ever watch a gull or any other bird with a ring, please do try to read the code and send us the data, in order to learn more about the life of these amazing birds. 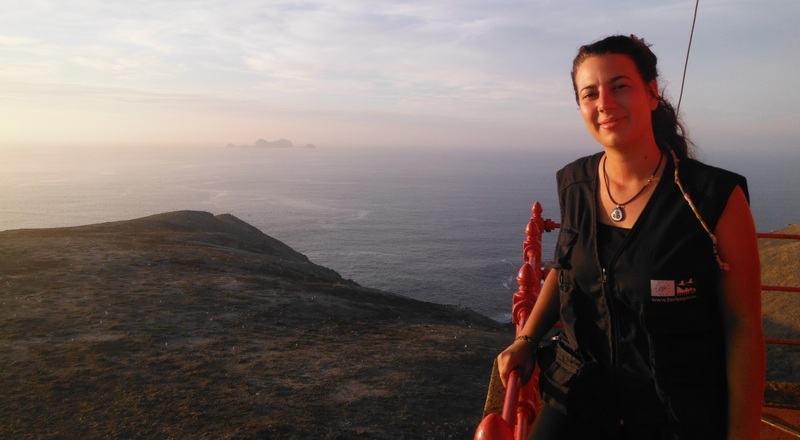 My participation in this project began in October 2015 under a traineeship aimed to study the population of black rats on the island of Berlenga. Nine months after the adventure ended, but with it remained moments and people that I will keep forever with special affection and that I will truly miss. During this time I saw a lot of people come and go, very different people, from various locations in the world, with unique experiences they wanted to share, but all had a feeling in common, the desire to return. From the first moment it was noticeable the good and unique environment of mutual aid and friendship created not only from Spea team, but from the Reserve rangers, lighthouse keepers and, in general, all those who pass through the island. This good welcome in which people are received and the constant care made the stay on the island and the works a lot easier. The realization of so many activities in several areas led not only to professional, but above all, personal growth. Direct contact with so many forms of life allowed the perception of the real wealth of fauna and flora existing in the archipelago, and the constant challenge to its preservation. We cannot change the world, but with each step we are closer to making it better. 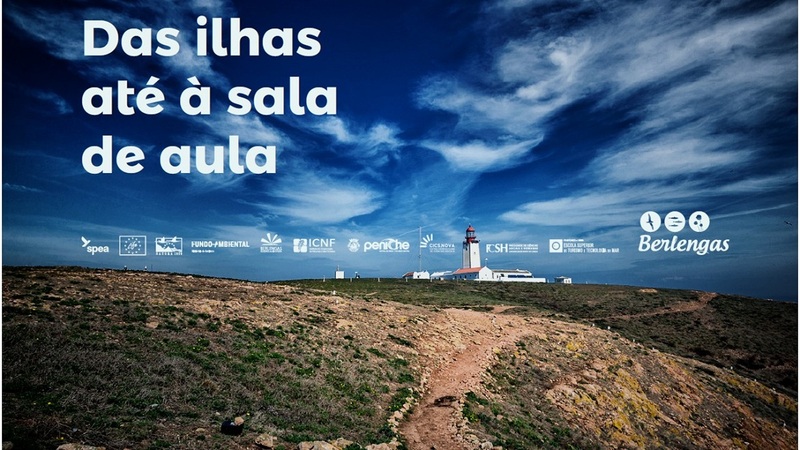 This unique experience is not only good for those who are connected to this area, but for all who want to have the opportunity to help in the realization of this essential project for the good management and conservation of all the values that make this archipelago so special. Inaugurated in July 2015, the Interpretive and Visitor Support Center of Berlenga Island, reopened last month for another holiday season. This space aims to be a point of complementary information for those who visit the island, where it is possible to learn more about the wealth of this archipelago and the Project Life Berlengas. Located in the Fisherman's Quarter, the Center counts this year with a corner dedicated to children. Do not miss the opportunity to take a break, and show the little ones the Berlengas seabirds! We continue to collect information on board small fishing vessels operating in this SPA. Summer is characterized by small amount of fish caught, for which reason, many skippers take advantage of this time of the year to repair the vessel and go in holidays for a few days. In the last two fishing trips, there were three bycatch events in surface longline, this time 3 Northern gannets were trapped in the hooks. Gannets dive and catch the bait or the fish that is caught in the hook, which is low depth of surface. The three gannets were released alive but with the hook in its beaks, giving the complexity of removing the hook of the beak from these birds. In the next days I will start to work on a vessel which operates with bottom and surface longline in the Berlengas area. This will give us more information about the interaction of seabirds with longline and will be useful in the characterization of this type of fishing gear. 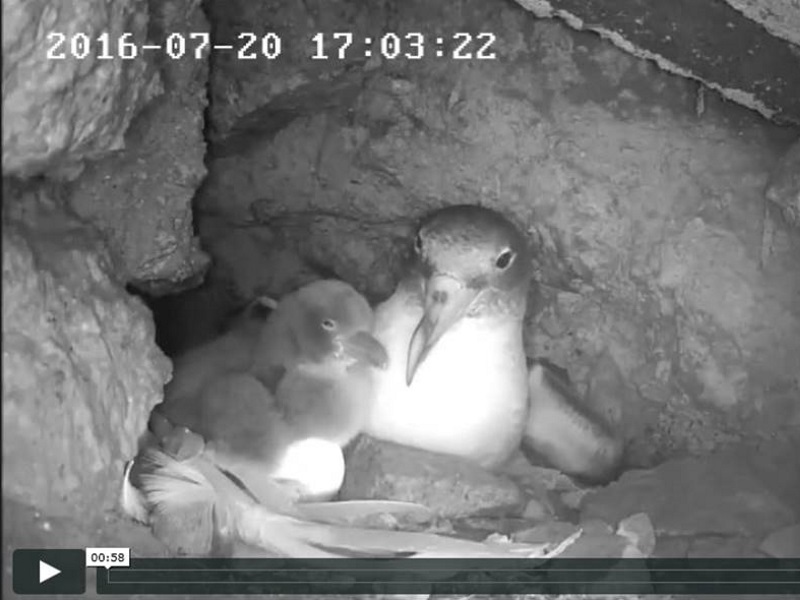 Cory’s Shearwater chicks are already born in Berlenga! Last July 19 was born the Cory’s Shearwater chick that is being followed in streaming from the Berlenga Island! In the first days, the chick was always accompanied by one of the parents but now, during the day the chick is alone in the nest. 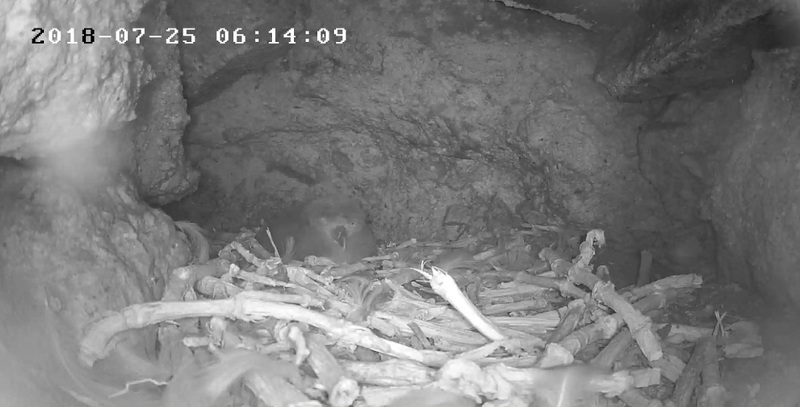 But during the night you can see more movement in the nest when the parents take shifts to bring food to their chick. Due to ocean circulation and upwelling phenomena, the waters of the Berlengas are very rich in food, especially fish such as sardines, horse mackerel and mackerel. Thus, most of the Berlengas Cory’s Shearwaters forage near the colony, up to about 50 km away - although some individuals travel up to 270 km! This chick and its companions will now remain in the care of their parents at least until late October, a time when already large and with the feathers all formed they travel to the South Atlantic, although some individuals can stay in the North Atlantic. On July 9, SPEA and Life Berlengas returned to Cabo Carvoeiro to show all visitors at that place the seabirds that pass by. As in June, meteorological conditions were not the most adequate and the low visibility did not allow the observation of a larger number of birds as well as the Berlengas. Again, the Great cormorants that rested on the Nau dos Corvos were a great attraction but this time they were also accompanied by a couple of yellow-legged gulls who took care of their chick. It was also possible to observe Gannets and Sandwich terns. Once again, we had the opportunity to contact numerous people and publicise the Life Berlengas project and return home satisfied with the success of another seabird watch activity. On the coming days of August 20 and September 10, we will be back to Cabo Carvoeiro! 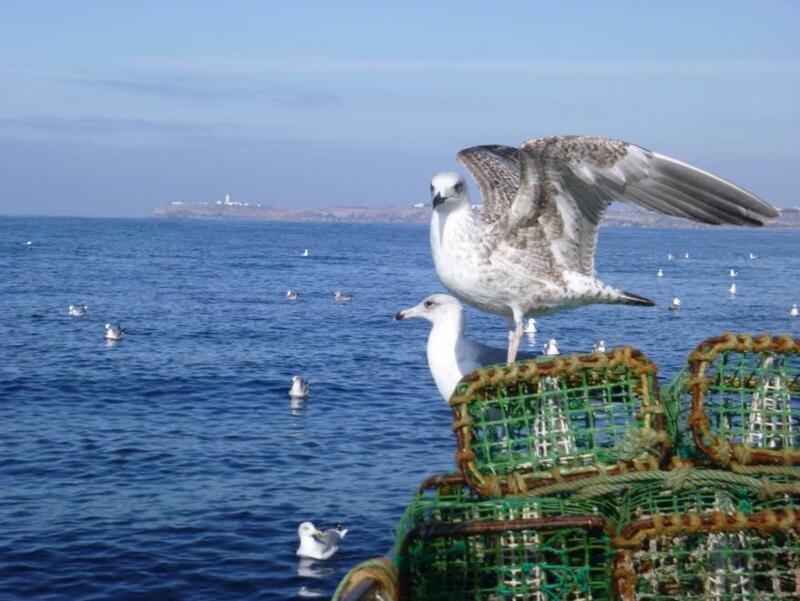 SPEA is looking for a collaborator to work as an observer for incidental catches of seabirds in mainland Portugal under the Life Berlengas project, working in the Department of Marine Conservation. 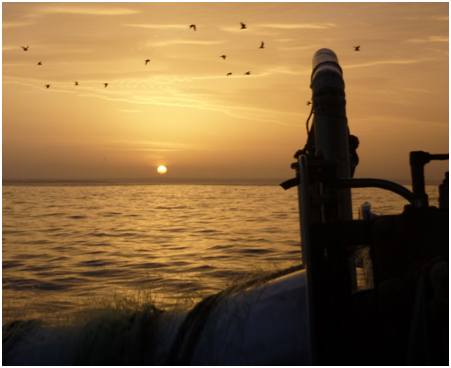 The main functions of the collaborator will be to monitor the interactions and incidental capture of seabirds as well as to participate in the testing of mitigation measures on board of several types of fishing vessels. Shipments will be made from the fishing port of Peniche. It is intended that the collaborator takes an active role in establishing contacts with masters of fishing vessels and associations. I left France to discover Portugal, it was one of the best decisions of my life. 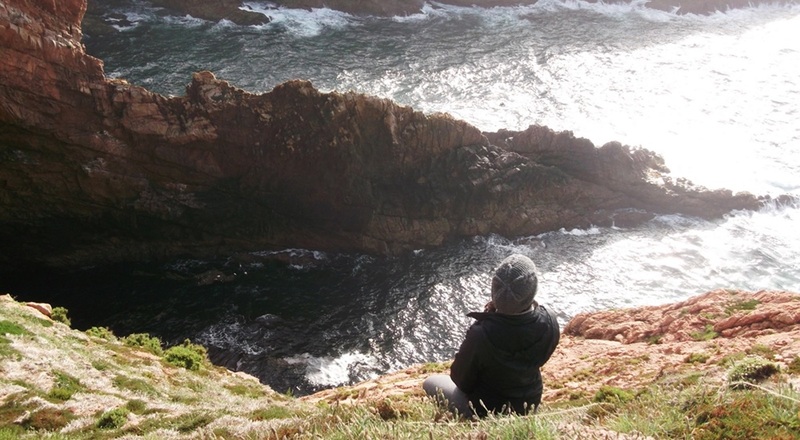 I came to SPEA to do an internship in 2015, under the Life Berlengas project, where I saw this spectacular place that everyone has to know - the island of Berlenga. I learned a lot of things about plants, about seabirds (I was lucky enough to gather and handle the shearwaters), the field work and all this in a very cosy environment. This whole experience was very gratifying for me, so gratifying that I returned to SPEA for a second internship. Now to track the European shags on the island of Berlenga. It was an extraordinary experience again. I learned many new things and especially I was fortunate to be very close to the animals. This second experience was different because I could see the progress of the project after a year and do new tasks. Thanks to these two internships, I know what I want for my professional project. I would like to have a job with tasks like those that take place in the Life Berlengas project. That is, work with birds, in the countryside and with a very cosy atmosphere, similar to what I found in SPEA and Berlenga. I want to thank the SPEA team that allowed me to find my professional path. I also want to thank the Berlengas rangers I've been with on the island and all the other trainees and volunteers who participated in the work with me. Follow the final stage of growth of a shag whose nest is located on the island of Berlenga. In the scope of Life Berlengas actions, a webcam was placed near the nest, allowing to divulge the behavioural habits of this seabird and the parental care of the adults with their chicks. The Shag occurs exclusively along the continental coast, in particular along the western rocky coast of Cabo Carvoeiro to the south. In Portugal, it is a rare species, and its population was estimated in 2002, in about 100 to 150 nesting couples. Most of the national population is concentrated in the Berlengas archipelago, particularly in the island of Berlenga. 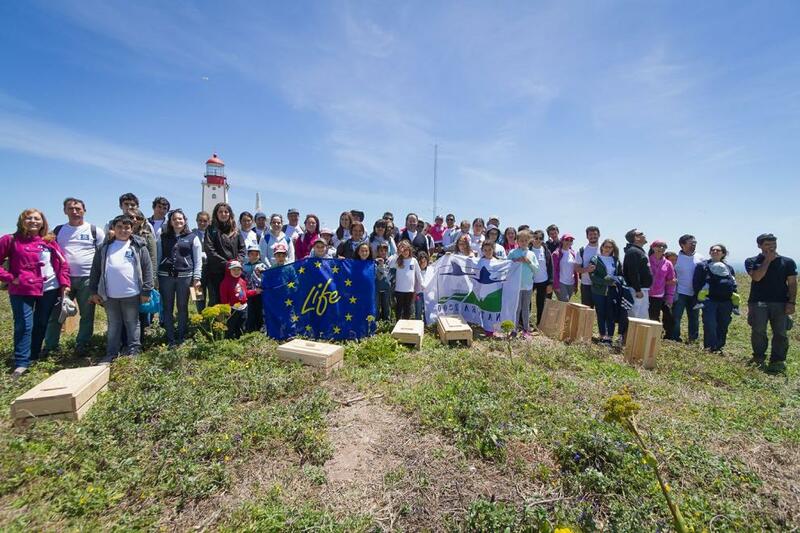 On June 5, World Environment Day, SPEA and Life Berlengas promoted a seabird observation activity in Cabo Carvoeiro. The morning started grey and with reduced visibility, which could have compromised the possibility of observing the birds at sea but fortunately, the clouds flew to other destinations and the Berlenga that was hidden was finally observed by all who came to Cabo Carvoeiro. This viewpoint is very visited by people of different ages and nationalities, which allowed us to make known the seabirds, especially the cormorants that rested on the rock known as Nau dos Corvos, to a very heterogeneous group of young, elders, Portuguese, Spanish, Polish and even Italian people. 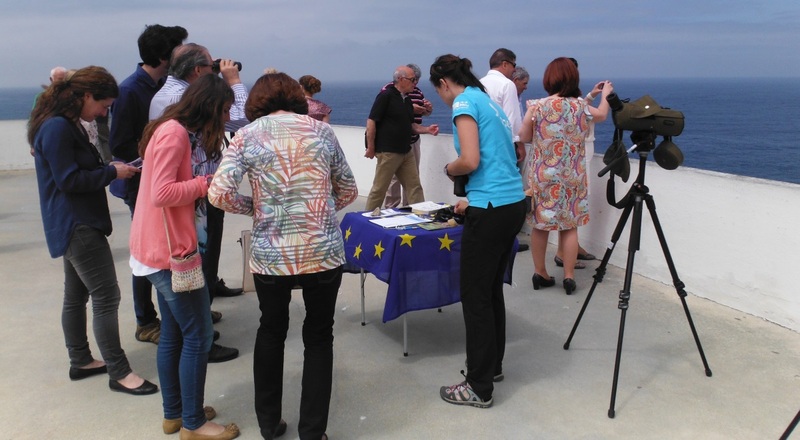 It was gratifying to see the interest and surprise of all those who tried the binoculars and watched with the telescope and wanted to know a little more about the birds observed, the SPEA and the Life Berlengas project. This was still a good opportunity to explain the reason for doing some actions in the Berlengas such as the removal of the Hottentot Fig and the removal of introduced mammals. In the coming days July 9, August 20 and September 10 we will be back to Cabo Carvoeiro to stay De Olho nas Aves! By invitation of the Portuguese Association of Geologists (APG), SPEA participated in the training course "The Peniche region as a laboratory for the study of geosciences", which took place on June 3-4 in Peniche and Berlenga. With the aim to publicise the Life Berlengas project and to show some of the results already obtained. 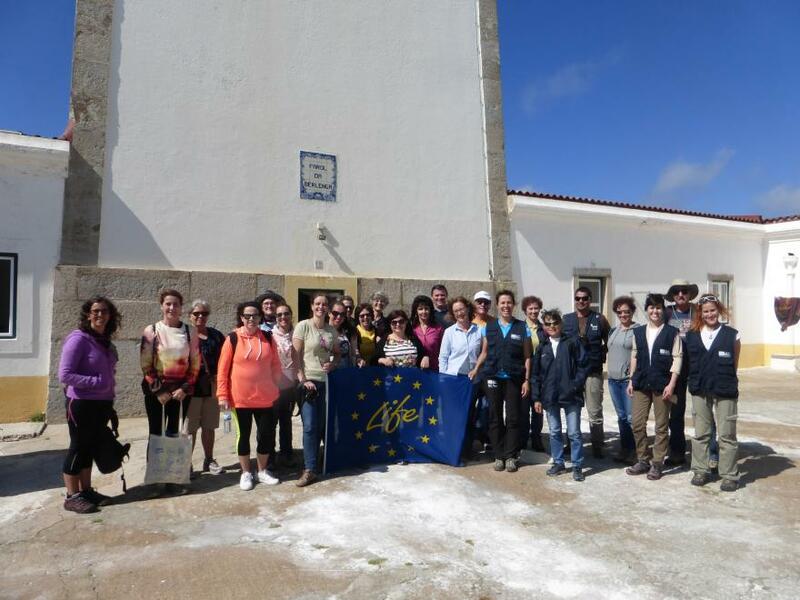 This event, which was attended by about 24 people, mostly professors from the area of biology and geology, allowed us to discover the geological secrets of the coast of Baleal and Berlenga, as well as seabirds and endemic flora. Among other discoveries, participants were able to verify the recovery of native vegetation in the areas where the Hottentot Fig was removed and understood the importance to remove this invasive plant, as well as the importance of removing introduced mammals. This partnership between SPEA and APG was a success and we believe that in the near future there will be new opportunities for joint activities. 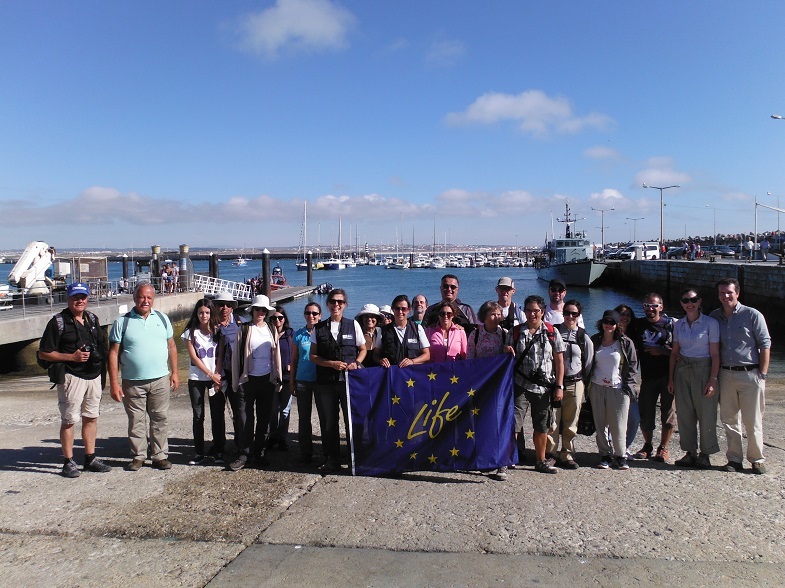 SPEA and Life Berlengas would like to thank APG and all the participants for the pleasant days spent in Peniche. 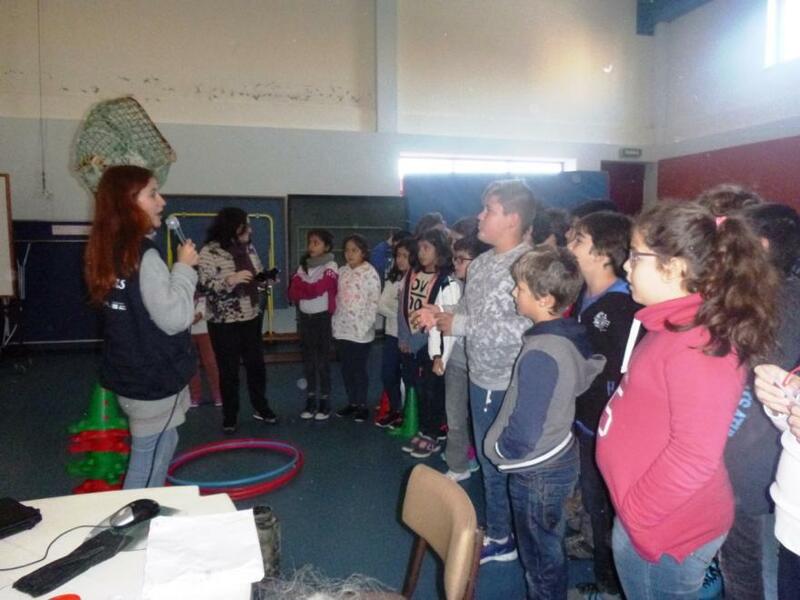 In May, environmental education activities continued with the school public in Peniche. This time we visited the Jardim de infância do Filtro where we were very well received by the students and Educator Patrícia Gago. In preparation for the day on the Berlengas Life Project, the students paid a visit to the beach where they collected materials to draw the Berlenga Island. During our visit, we talked about the seabirds that exist in the archipelago, how they live, what they eat and what dangers they face. There was still time for a game where children could feel on their skin what it's like to be a seabird in search of food in the ocean. The day after our visit, we had a beautiful surprise: the island of Berlenga was now filled with life and colour with the Berlengas birds! Thank you, JI do Filtro for your work! 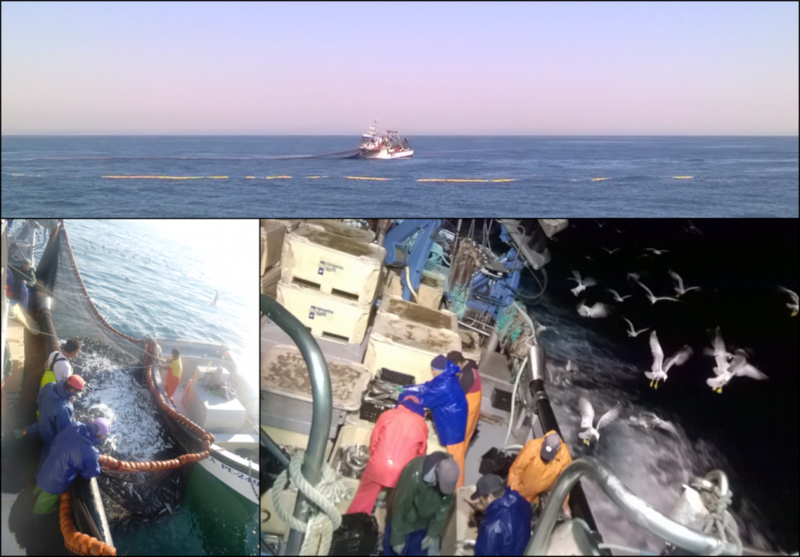 As we all know, the winters in the Ilhas Berlengas SPA are hard and this year in particular was very difficult for our work at the sea, the sea was rough which did not give us the opportunity to ship in the fishing boats as much as we would like. Although shy, good weather begins to appear and in the past weeks we have managed to make some fishing trips. 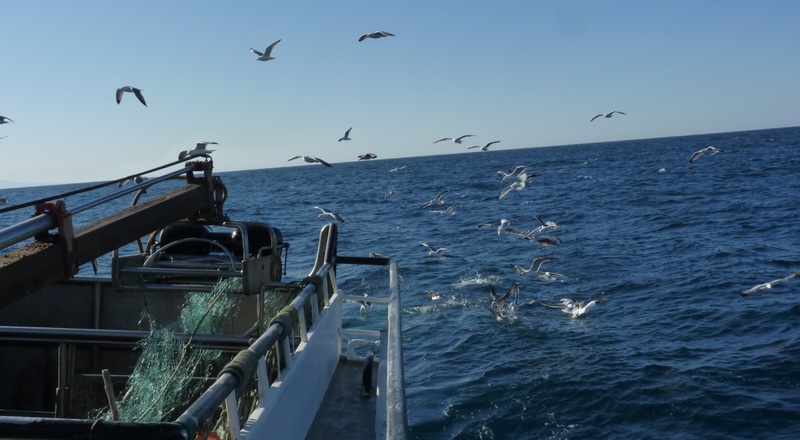 Spring months are not the most exciting season for observation as the abundance of species is lower, but that does not mean that it is not important to go on board as seabird bycatch may still occur as well. The species that outstands in our interaction board sheets is the Yellow-legged gull (Larus michahellis), many of them are most likely to be nesting in the archipelago of Berlengas now. In the midst of the yellow-legged gull we can find the Lesser-black-backed gull (Larus fuscus) and occasionally a Cory’s shearwater (Calonectris borealis) or a Shag (Phalacrocorax aristotelis) fly near but show little interest in the boat. In these last few fishing trips we didn’t have much action around the boat but we need to emphasized the fact of not having registered any seabird bycatch event. I’m Marta, an Italian girl. 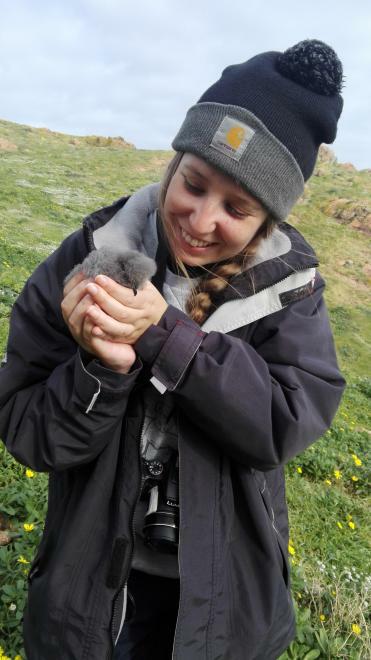 My internship in the project LIFE Berlenga started in the end of October 2015, just in time to see and help in the monitoring of the chicks, not so young anymore, Cory’s shearwater before they left the island for their migration. It was a totally new experience for me, I had never taken part of a nature conservation project and I had never seen a chick or an adult Cory’s shearwater. During this six month I joined the SPEA team we did a lot of different field activities indispensable for the conservation of the vegetation and fauna, in particular seabirds. We worked very hard, doing several shifts per day, often also at night: we trapped rats and rabbits; removed a big part of the invasive plant “hottentot fig” also on the cliffs with the help of safety ropes; we did a lot of transects to study the endemic and exotic plants; we did a radio tracking to find the position and movements of some rats previously marked with a radio device; built artificial nests for Cory’s shearwater; and several others tasks. The rangers of the ICNF Paulo, Mourato and Antonio were almost every moment with us to give their support in big part of the work and with the preparation of amazing Portuguese food too. In those six months in Berlenga I met only very motivated and friendly people, many of them also volunteers, and we lived together in a small house sharing food, bedrooms and a lot of laughs. Despite the winter, the rain and the wind in the island were real obstacles I really think that together we did something very important for the future of the species living in the archipelago. Finally at the end of my internship, in April, I had the satisfaction to see the Cory’s shearwater coming back to the island after their long migration in the south hemisphere and looking for a rocky cavity to make their nest. I felt very lucky to take part of this important project even only for a short period of time and I enjoyed so much the time spent there. The SPEA team and the rangers of the ICNF will continue to work hard for the conservation of the natural reserve. Now I really want to say a huge THANK YOU to all the wonderful people I met during my internship and I hope to have in the feature another possibility to come back and give my contribution. Continuing the LIFE Berlengas awareness program, two more sessions took place yesterday at the Jardins de Infância do Alemão and Prageira, both in Peniche. In Peniche, because it is the closest town to the Berlengas, where almost all the kids have heard about this archipelago. The activities went very well and the dissemination objectives of the project were achieved. 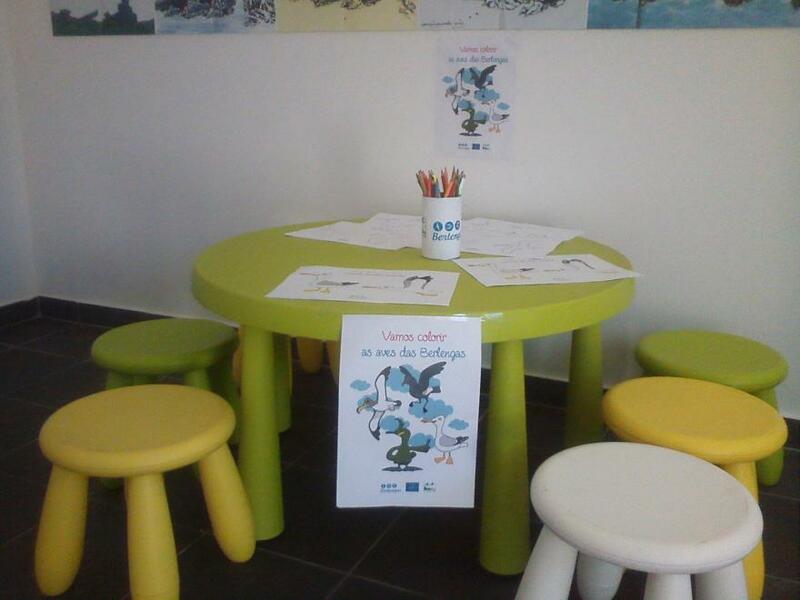 Now the children will never forget the Berlengas seabirds, and how important it is to preserve them. 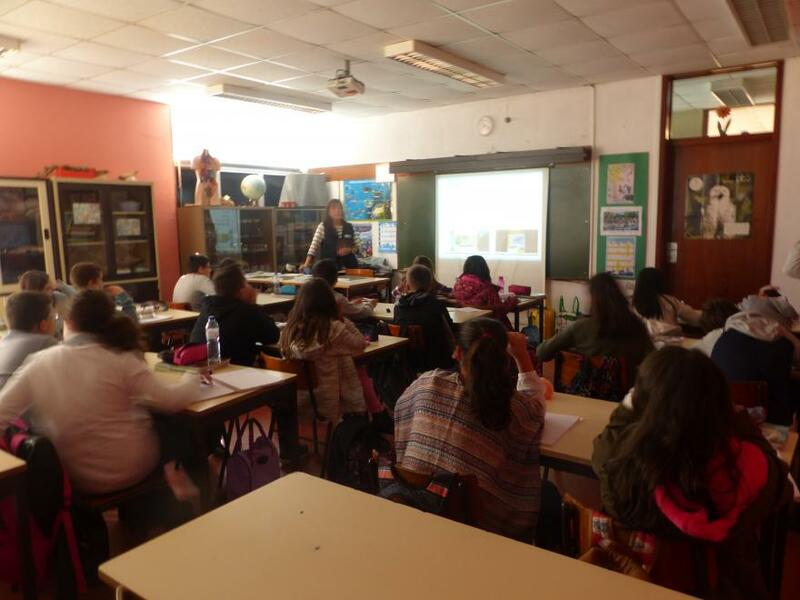 During the activities, the spot about the LIFE Berlengas Project was screened, then each species of seabird in the archipelago was presented to the students. The children also received a colouring book and in the end played a game where they represented the seabirds in search for food in a sea full of dangers. "Why does the gull have a red spot on its beak? "Was the question of the day, in which the Anas were very happy to answer. I’m still trying to figure out how can I manage myself aboard the fishing boat Mãe Purríssima in order to record all information about the gillnet fisheries. This boat is large and comfortable but very closed which make it hard to check all interactions and captures. February was awesome! Near 20 Balearic shearwaters were less than 20m from the boat, large numbers of Northern gannets, Razorbills and even a Sooty shearwater interacting with the fishing gear. Also an individual was bycaught, this time a Northern gannet was found dead. During the gillnet setting, lots of small fishes remained from the former fishing event usually attract seabirds to dive towards the gillnet, being entangled and drawn. 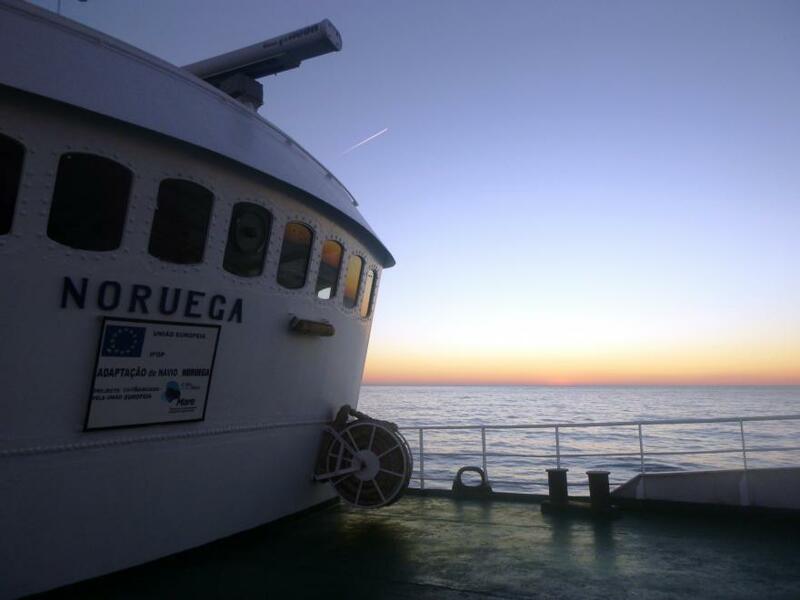 In March one of our marine observers participated in the IPMA campaign “National Program for Biological Sampling for horse-mackerel, sardines and other pelagic fishes” aboard the research vessel “NORUEGA” to censuses of seabirds and cetaceans along the Portuguese coast. 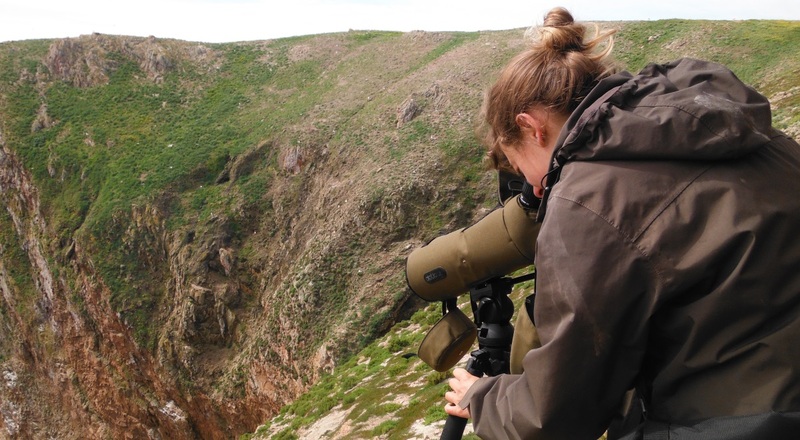 This campaign was particularly important to collect data on seabird distribution within the Berlengas SPA, where were observed the first Cory’s shearwaters, that are coming back to our waters to nest, Balearic shearwaters, Great skuas and huge numbers of Common dolphins. Berlengas Rupturewort found in the Berlengas! The Berlengas Rupturewort is an endemic species of the Berlengas and one of the most difficult plants to find on the island. It can often go unnoticed by being small and growing close to the soil and cracks in the rocks. 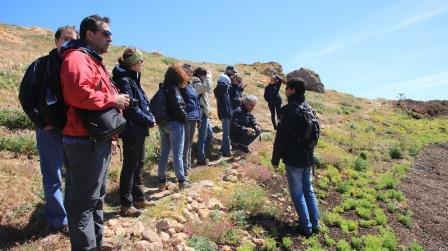 Since the beginning of Life Berlengas, the project team has been struggling to find the Berlengas Rupturewort. Fortunately, in the first fortnight of March was found a specimen that already had some flowers. This discovery gave new impetus to all involved in the project because of this small plant, whose leaves are succulent to ensure protection against the high salinity of the islands, currently has a conservation status Vulnerable. This classification is due to the fact that it has a limited distribution, a reduced population and because it is threatened by the expansion of the Hottentot Fig. 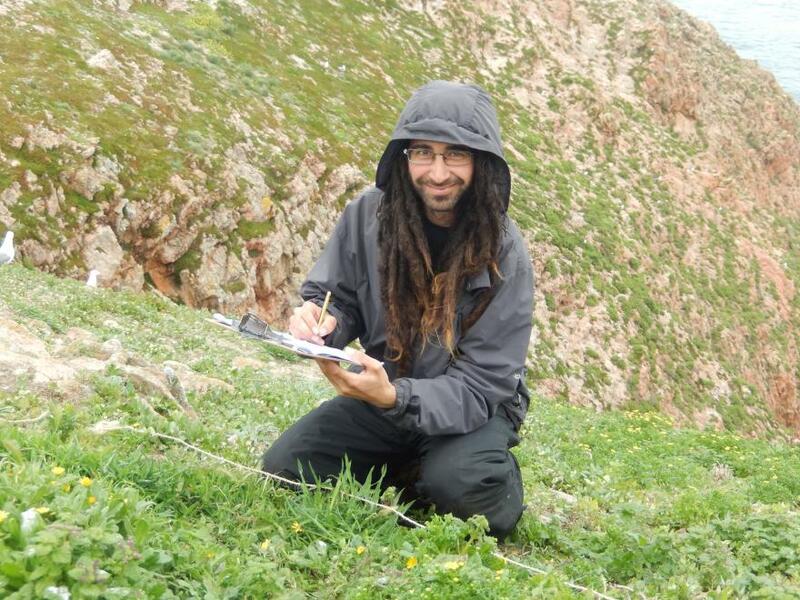 The Berlengas Rupturewort inventory works, and other vegetation will continue in the coming months in the hope that more specimens of this unique species will be found. The study, titled “Invasive-mammal eradication on islands results in substantial conservation gains,” examined how native species responded to projects that eradicated invasive mammals from islands. The researchers found 596 populations of 236 native species on 181 islands benefitted from these eradications. According to one of the authors, Holly Jones, twenty one billion dollars (US) are spent globally each year on nature conservation. A small fraction of this goes to eradication of invasive species, yet this relatively simple, cost-effective conservation intervention is benefitting hundreds of native animals and endangered species. This is fantastic news in the race to prevent extinctions. Nick Holmes, director of science for Island Conservation says these island restoration projects are a proverbial silver bullet for biodiversity conservation. For any conservation intervention, it is rare to find a body of global evidence measuring the outcomes for native species. These results are a testament to the value of these types of projects. With a large-scale literature and database review the researchers documented positive responses, including population increases, recolonization and successful reintroductions. Islands with invasive species pose a unique biodiversity conservation challenge and opportunity. Islands occupy less than 6% of Earth’s land area, yet are home to 15% of terrestrial species. Islands represent 61% of recorded extinctions with invasive species implicated in the majority of those. 37% of all Critically Endangered Species on the IUCN Red List are found on islands. In recent decades, eradication programs have gained traction even on more populated islands. More than 1,100 attempts at eradication of invasive mammal populations have occurred. Holly Jones hopes the study’s results will help conservation practitioners see where they can make further strides to curb extinctions and protect native species. “While we can't bring back the species that have gone extinct, our analysis shows that removing invasive mammals can help us undo some of the damage we've caused”. A project to protect breeding seabirds from invasive rats on the Scilly Isles has been a success with the two islands declared "rat-free". Bird populations on St Agnes and Gugh, linked by a sand bar, are starting to recover after a quarter century of year-on-year declines following work to eradicate the non-native brown rats which were feeding on eggs and chicks. They are thought to have first colonised the islands in the 18th century following several shipwrecks and grew to a population that was harmful to birds such as European storm-petrels (Hydrobates pelagicus) and Manx shearwaters (Puffinus puffinus), which have been in decline since the 1980s. Local volunteers and conservationists began work in 2013 on a project to monitor rat activity on the island, followed by an intensive programme of baiting and poisoning for a month in the winter. No rats have been spotted since November 2013, and after a thorough month-long inspection at the beginning of this year the islands have been declared officially "rat-free". 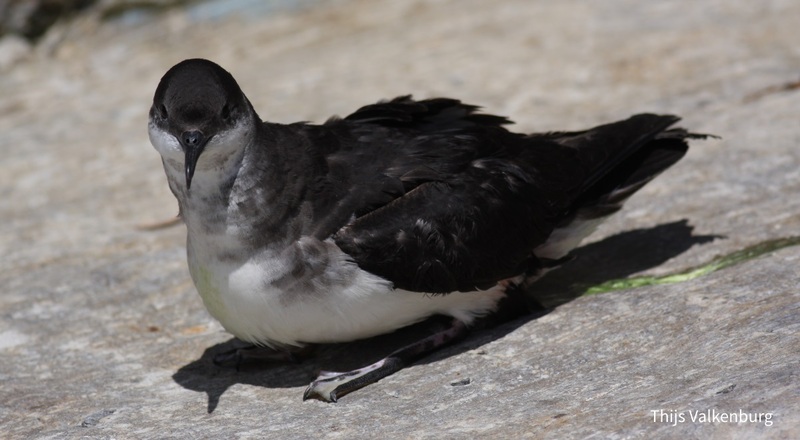 Since the removal of the rats, both Manx shearwaters and European storm-petrels are successfully breeding on the islands for the first time in living memory, with more than 40 chicks recorded on the islands in the last two years. The hottentog fig is native to South Africa, and has been introduced in several countries for medicinal and ornamental purposes, and to control soil erosion. However, its impressive propagation and seed production rates led to the quick colonization of vast areas, becoming an invasive species in Portugal. It is currently considered one of the 100 worst invasive species on the planet. By growing uncontrollably, the hottentog fig dominates the ground completely, forming dense vegetation carpets that are practically impenetrable to native plants. The soil covered by this plant suffers chemical alterations which in turn affect the germination, survival, growth and reproduction of the native vegetation. The history of the hottentog fig on the Berlengas goes back to the 1950s. At first, it was planted in the fishermen's neighbourhood. However, without any restraints to its propagation, it rapidly spread throughout the island. In addition to the optimal environmental conditions that allow it to thrive, the presence of the Black rat, Common rabbit, and Yellow-legged gull in the island contribute to seed dispersion. Since the beginning of the LIFE Berlengas project, SPEA with the help of its partners and many volunteers has been removing this invasive species from Berlenga Island, especially in the slopes of the “Carreiro do Mosteiro”, the camping area and in the Flandres area. This removal, which is done manually, is carried out along the contour lines. The removed plants are rolled up and left to dry on top of the hottentog fig carpets directly below. 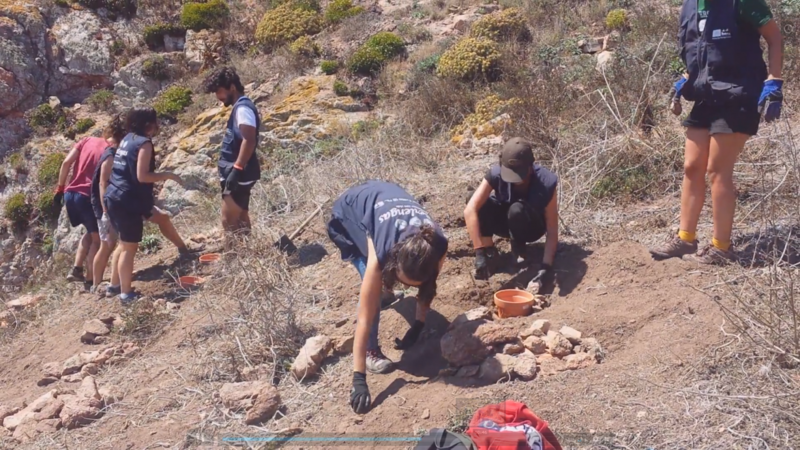 The effort of the LIFE Berlengas teams to remove this invasive species from the island has been intense, and groups can vary from between 1 and 8 people, which have already dedicated around 730 hours of work to this removal process. We would like to take this opportunity to thank the 40 volunteers and ICNF technicians that have put their energy in the fight against this exotic invasive plant. In 2016, we will continue to remove the hottentog fig in the hope of one day seeing the slopes of the island of Berlenga adorned with its native vegetation. The Red List of Birds, published this week by Birdlife International and the IUCN and funded by the European Commission reveals worrisome figures on the conservation of species in Europe. In Portugal there are many endangered species, especially the painho-of-Monteiro, the Vulture and Imperial Eagle. About 13% of 533 species in Europe are under threat value rises to about 18% if we consider the 27 EU countries (to the baseline date to Croatia was not yet a Member State). Of these, 11 are Critically Endangered. In Portugal, the situation is also critical being identified 22 species that are under threat in the Union, highlighting the pardela-Balearic (endangered Critically), the Zino's Petrel, the Vulture and the Priolo (in danger) . There are other species in Portugal who are under clear threat. The Turtle Dove, the ferruginous duck, the Eurasian Wigeon, the pintail, the Fieldfare and Redwing, all game species capable of being fighters in Portugal. To Luís Costa, Executive Director of SPEA, "is shocking case of species that were common but have come back sharply several years ago, continues to be ignored by policy makers" and launches appeal for there to be a suspension "urgent of their hunting in Portugal, "he concludes. 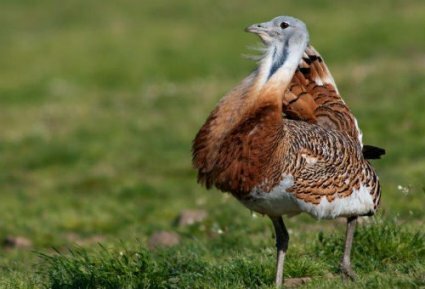 Conservation in Portugal has also been successful with the recovery of species such as the great bustard and the kestrel which have been recognized, awarded by the European Union, not threatened. The official also believes that "the recovery of these species is a direct result of carried out conservation efforts, the application of the Birds and Habitats directives and the implementation of the LIFE program of the European Commission".